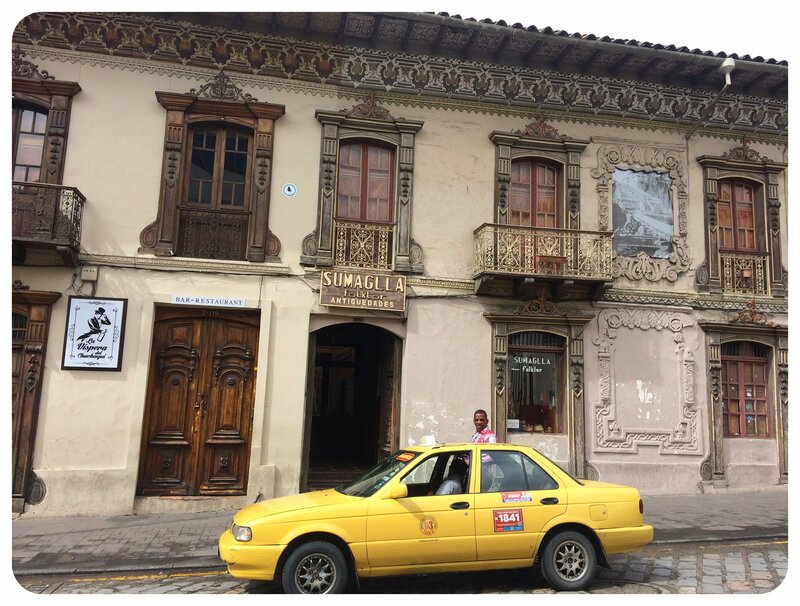 I hadn’t fallen in love with any of the places I had visited in Ecuador – with the exception of the Galapagos Islands – but I had high hopes for Cuenca. People seemed to love this Andean university town, and I needed a break from the mosquitoes and the heat of the Ecuadorian coast. 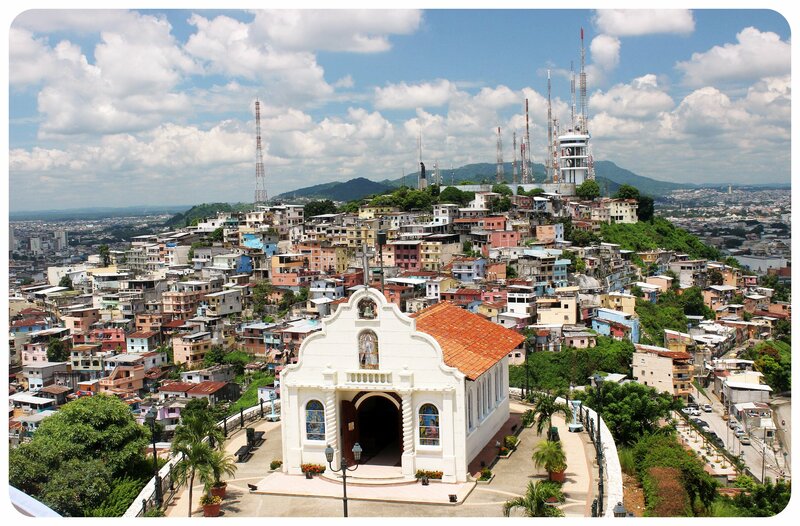 It took me around eight hours to get from Montañita to Cuenca, with a quick stopover in Guayaquil where I changed buses. 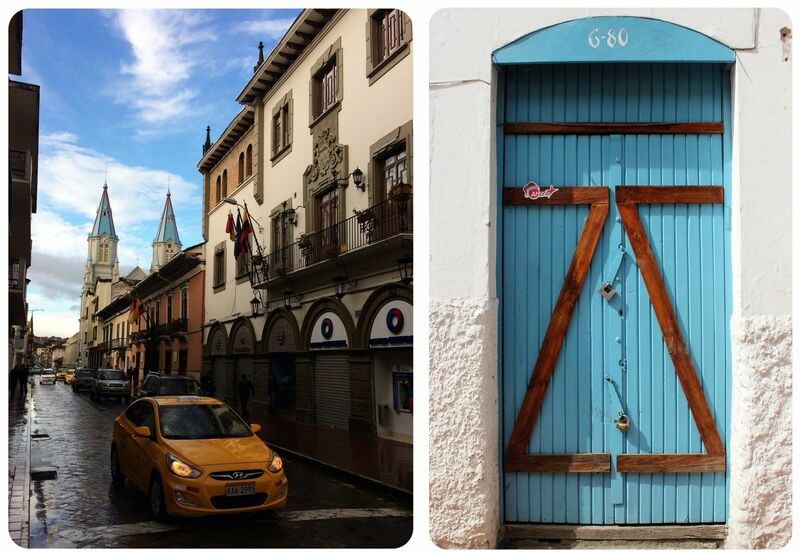 As soon as I got off the bus in Cuenca, I got a good vibe from the city, and I had a feeling I’d enjoy my stay there. I walked to the hostal I had booked, instead of taking a taxi, and the walk was much needed after the long hours spent on the bus. 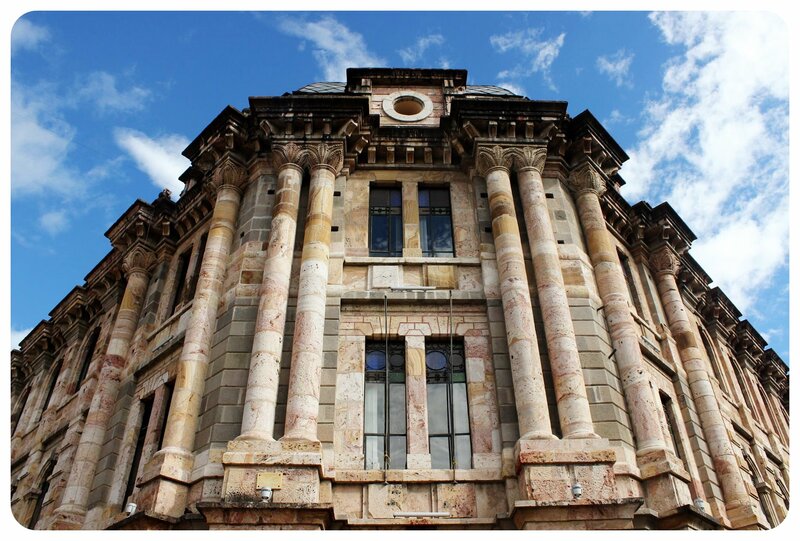 I noticed right away how beautiful the architecture was – the buildings were mostly from different eras , but it was the mix of architectural styles that made it so interesting. 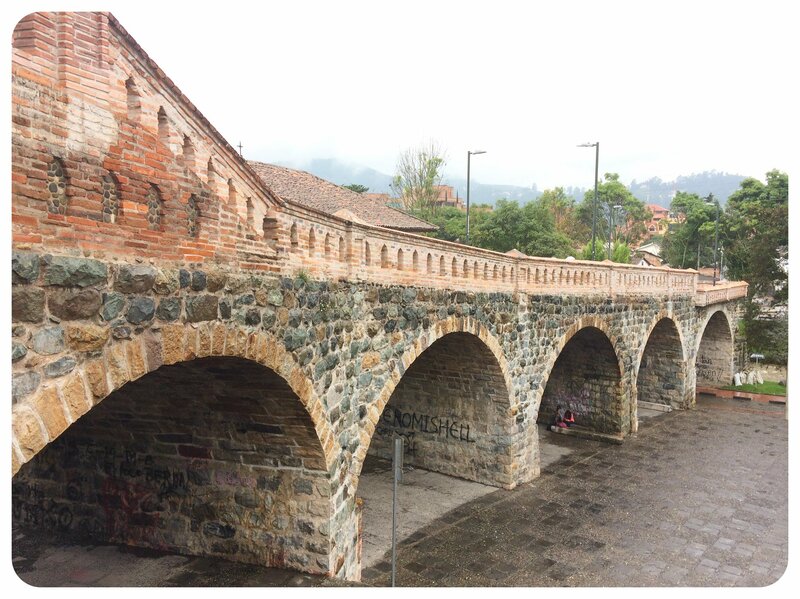 Cuenca was the first city in Ecuador I found visually appealing – neither Quito nor Guayaquil had done much for me with their boring, unimaginative architecture. Yes, I admit it: I prefer cities that are delightful to look at over cities that aren’t all that pretty (which is probably why I never fully understood the appeal of Chiang Mai in Thailand). 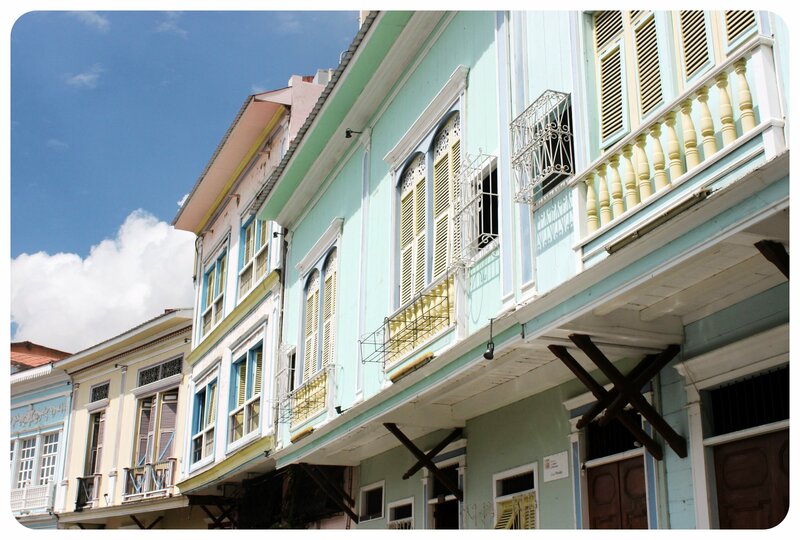 The unique blend of architectural styles has led to Cuenca being awarded a place on the elusive list of UNESCO World Heritage Sites. 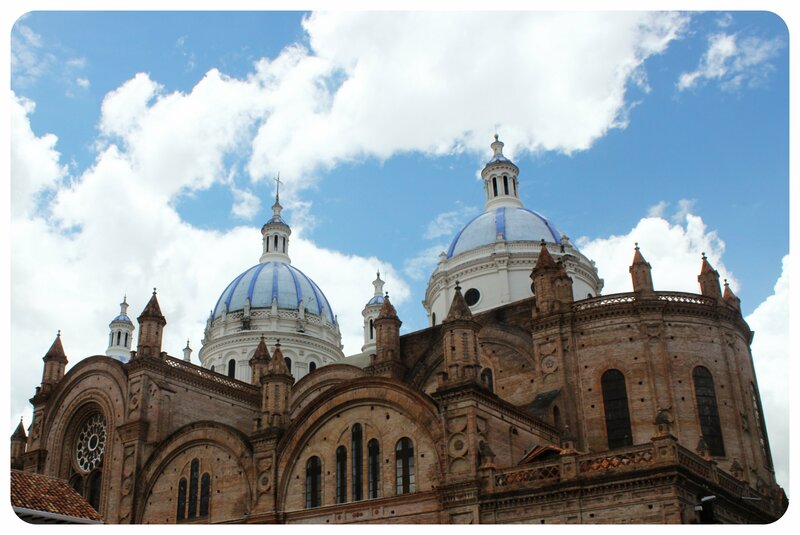 Cuenca charmed not only UNESCO, but also me with beautiful Spanish-colonial architecture, well-preserved Renaissance buildings, a pleasant town plaza and a number of impressive churches, especially the Cathedral of the Immaculate Conception. The unique fusion of different cultures and epochs in South America that can be seen in Cuenca’s streets and architecture are impressive, and I was even more impressed when I read about Cuenca’s UNESCO status, which is based on cultural heritage, and that the classification actually comprised of over 1,000 buildings in Cuenca! 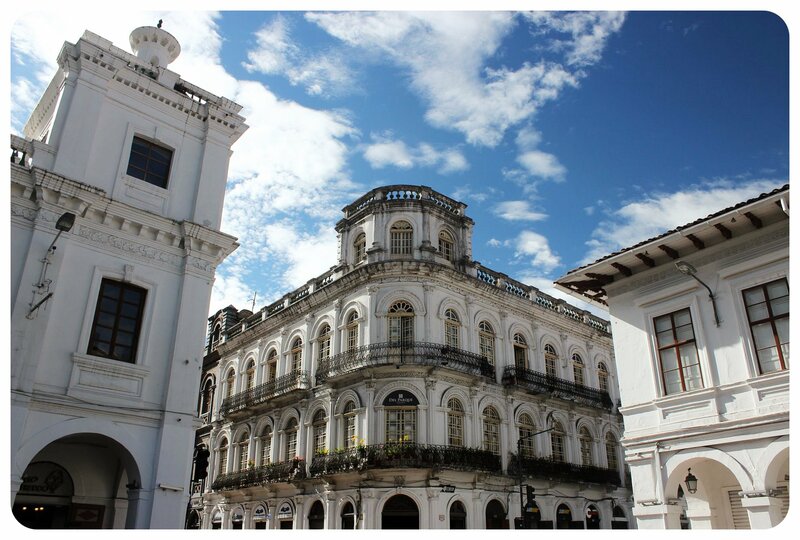 Cuenca’s recognition for cultural heritage naturally means that the preservation of historic buildings is taken seriously here, which is why it is such a delight to simply wander the streets, marvel at the buildings, and try to figure out which era they belong to. 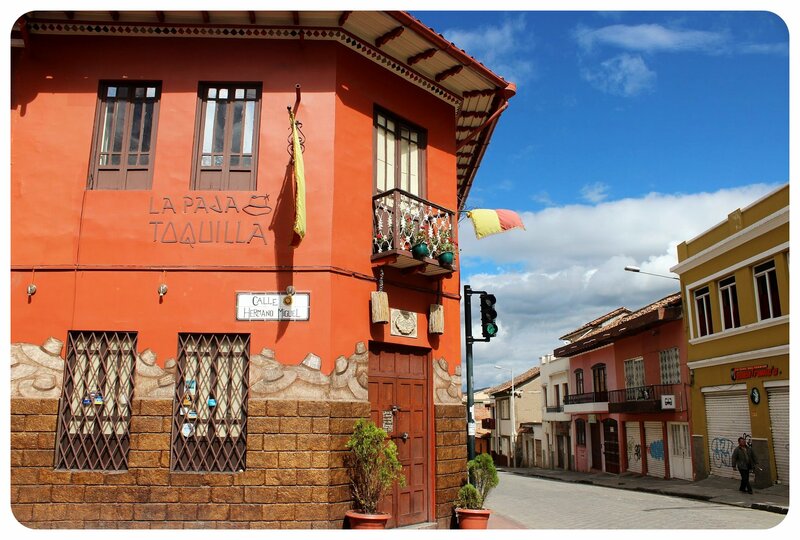 But there’s more to the city than just architecture and wandering around: If you enjoy museums, Cuenca is THE place for you. The city had enough museums to keep me busy for the entire week I spent there: the Modern Art Museum, Central Bank Museum (Museo del Banco Central), the Prohibited Museum (Prohibido Centro Cultural), Medicine Museum, Museum of Aboriginal Culture, a religious museum in the Convent of the Immaculate Conception, the Inter-American Traditional Art Center, and probably a couple of other ones that I have since forgotten about. 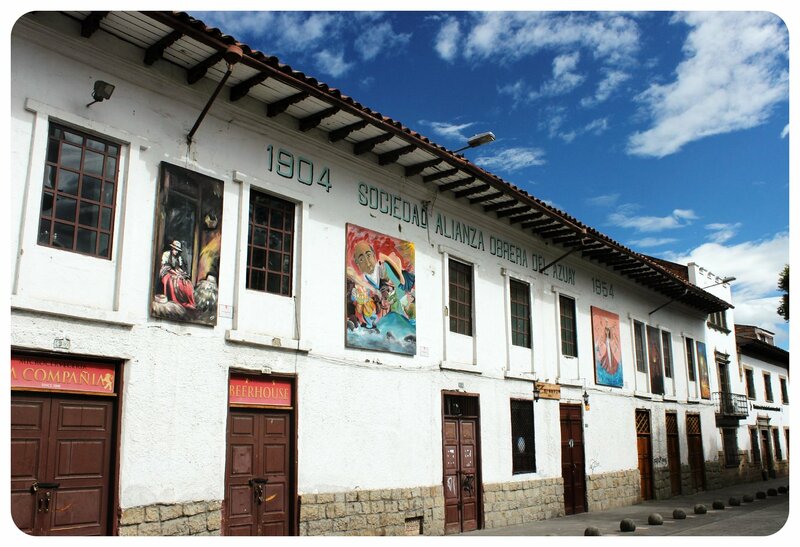 Somehow, I never made it into any of the museums, even though the Modern Art Museum was on my to-do-list for Cuenca. But I made a mistake that I’ve made before (it seems like I never learn?! ): I waited too long. Assuming I had plenty of time since I was staying in Cuenca for a whole week, I spent the first few days in town taking things slow, simply meandering in the parks and streets, peeking into churches, photographing murals and street art, walking around the market and exploring the coffee shop scene. One thing left on my to-do list was climbing the bell tower of the new cathedral, which I was told was well worth it for the sweeping views over the town and the Andes Mountains. But then, somehow, the week slipped through my fingers, and before I knew it, I had only two days left. And these two days happened to be completely rained out. On my last day, a rain storm so fierce passed through Cuenca that I got completely soaked while I ran from a coffee shop to a restaurant only three blocks away. There was no way I would enjoy climbing up the bell tower of the Cathedral of the Immaculate Conception, the New Cathedral, in this weather. I beat myself up for not doing it on one of the days when the weather was nice, but in all honesty, I enjoyed my time in Cuenca even though I barely did any touristy things. 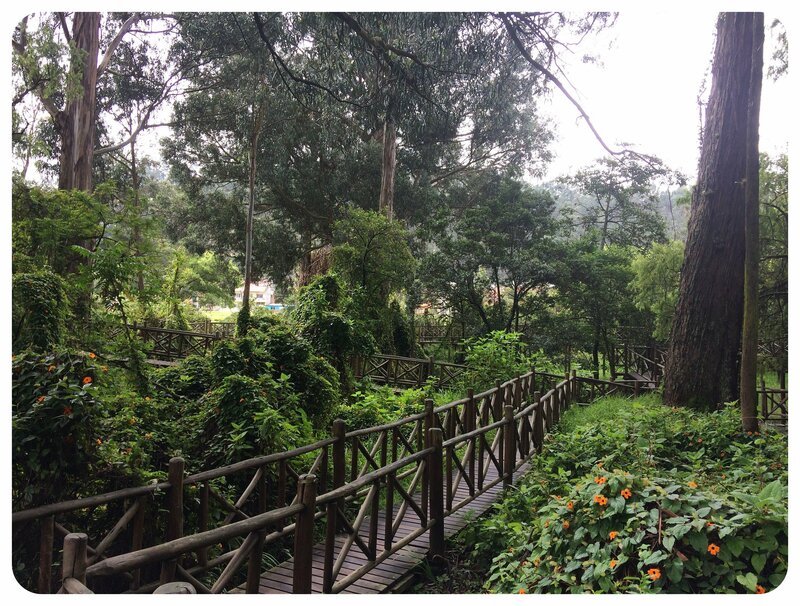 I got into a nice routine of going on a morning run along the river, a couple of times all the way down to Parque Paraiso, a pleasant, forest-like park which is the largest green space in Cuenca. 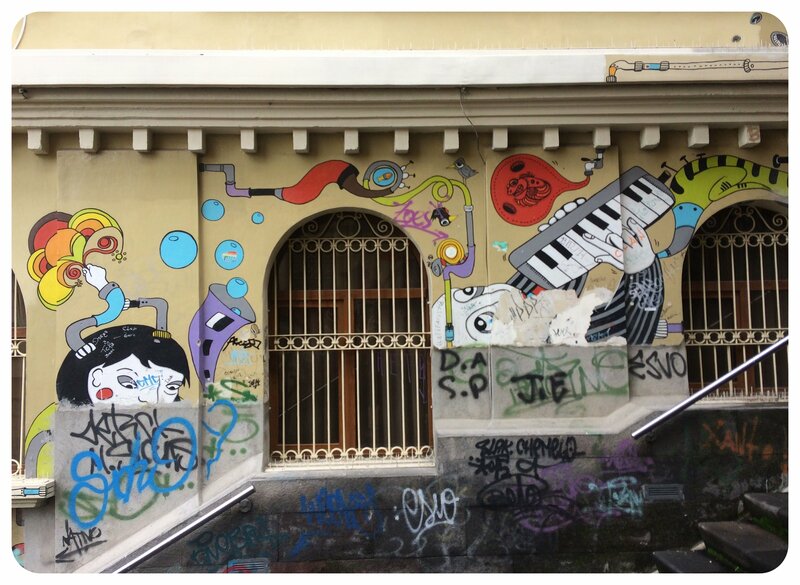 Afterwards, I’d walk up the stairs between Calle 3 Novembre and Calle Larga and look at the street art there, before plonking myself down for breakfast in one of the many cafes around town. There are no shortage of breakfast destinations in Cuenca, ranging from cheapie desayunos for less than $3 in the more local places, to pricier, gringo-fied versions at Goza, where I splurged on a $7 breakfast (they had shakshuka on the menu, how could I resist!). 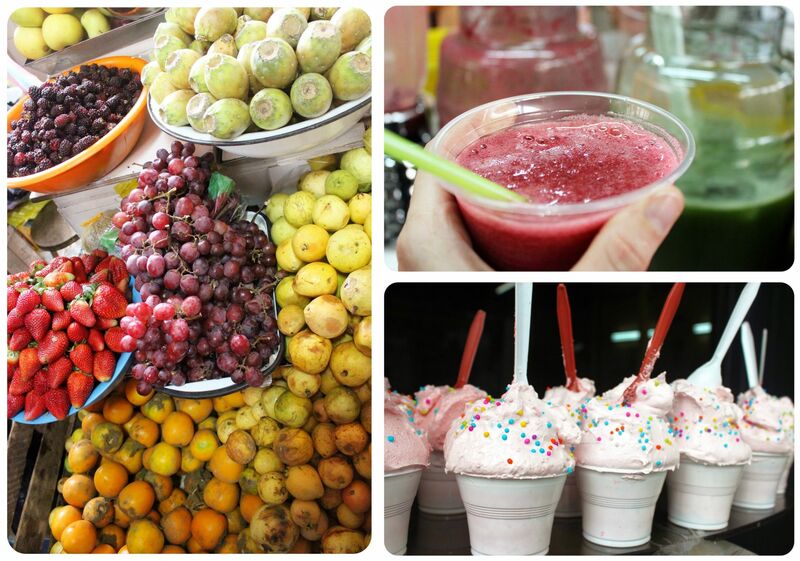 Another thing I loved about Cuenca? 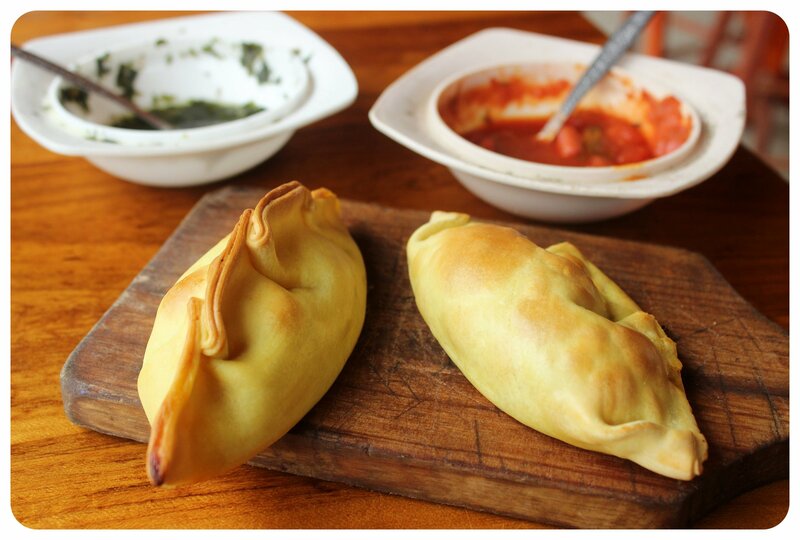 It was the first city in Ecuador where I never had trouble finding something to eat that I enjoyed. 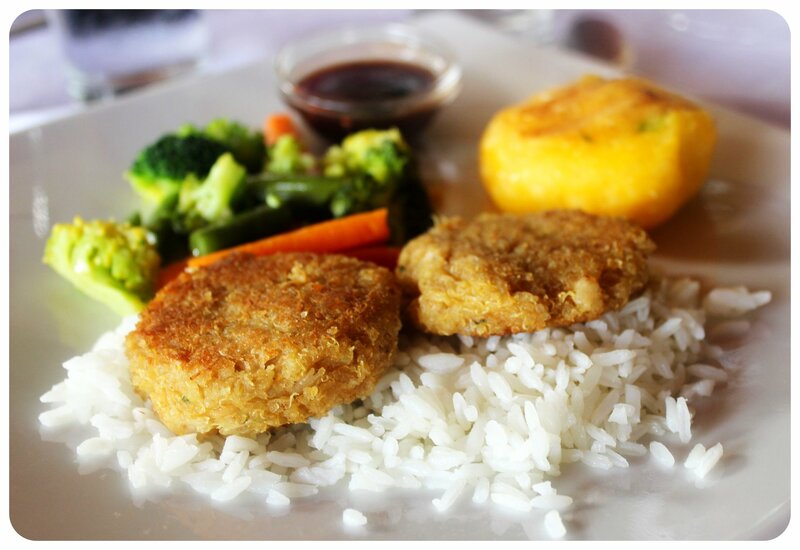 Ecuadorian food is not known to be very vegetarian-friendly, and for most of my time in Ecuador, I hadn’t had any memorable meals. 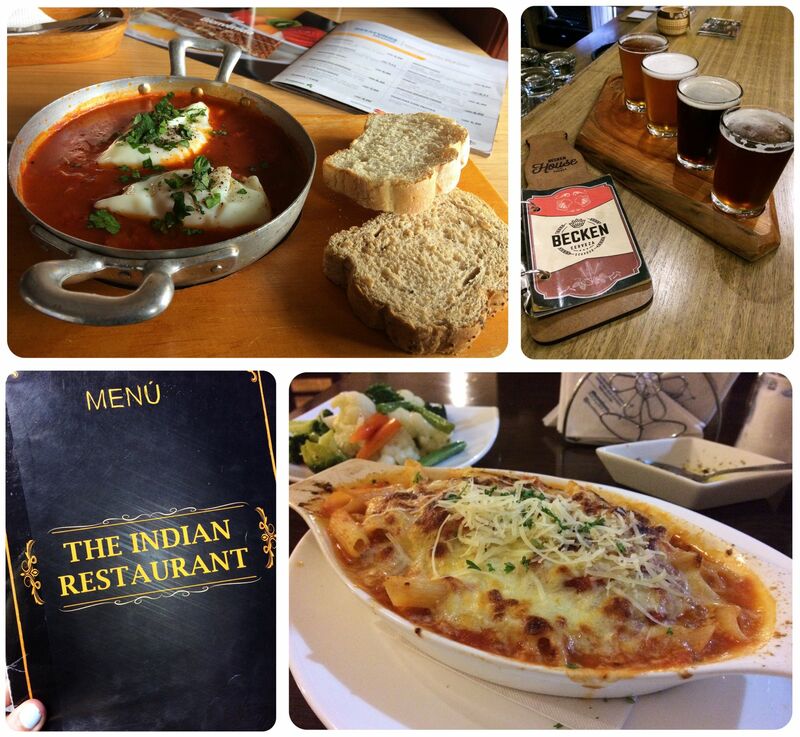 But in Cuenca, there were several international restaurants: an Indian restaurant, a Thai place, two Italian restaurants, and a number of vegetarian restaurants. When I wasn’t typing away on my laptop, I spent most of my time eating my way around town, reading on my Kindle in one of the cafes or people watching in the main square, and that was okay. I didn’t feel the need to do much more, and I enjoyed not feeling rushed, not feeling like I had to sightsee all day long. 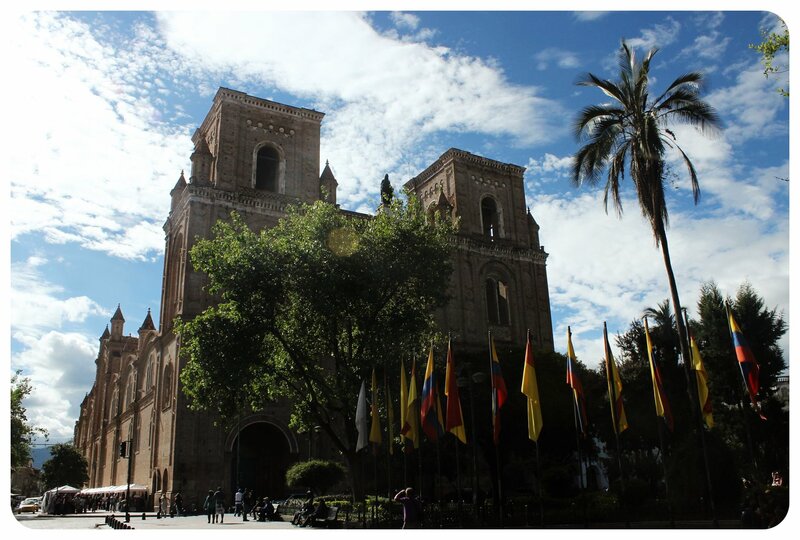 My week in Cuenca felt more as if I was living there instead of taking in all the tourist sights, and it showed me once more that visiting a place is about so much more for me than hitting up all the museums and landmarks a city has to offer. Those aren’t the places where the locals spend their time. Instead, I ran into fellow runners in the park, I chatted with café and bar owners about life in Ecuador, I watched kids play together in Parque Calderon and loved getting into a routine for a while, to discover what is would actually be like to live there. 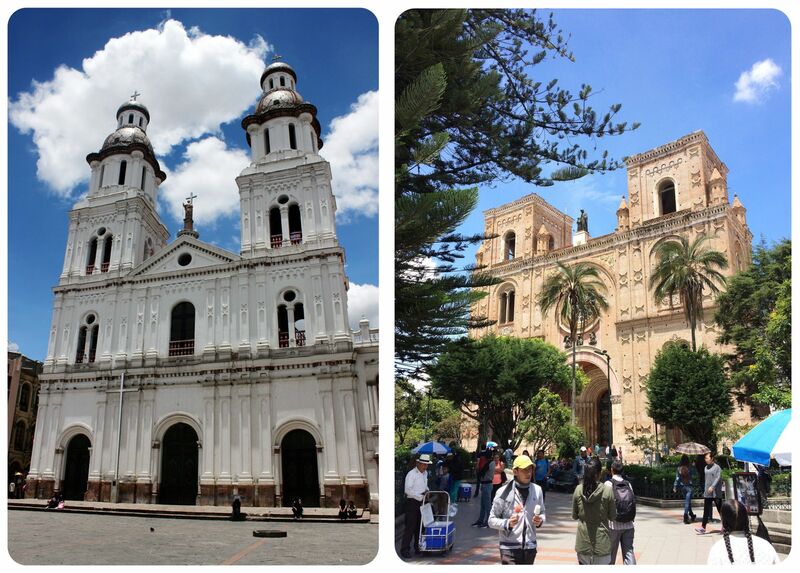 Speaking of which, Cuenca is very popular with expats, and is without a doubt the most popular expat destination in Ecuador. I have to admit though that while I enjoyed my time in the city, I didn’t feel the draw that many expats must feel. I could not see myself moving to Cuenca. But that being said, I rarely feel like I could move to a place. After a week of standing still, I got itchy feet and was ready to move on to my next destination: Baños, the Adventure Capital of Ecuador. 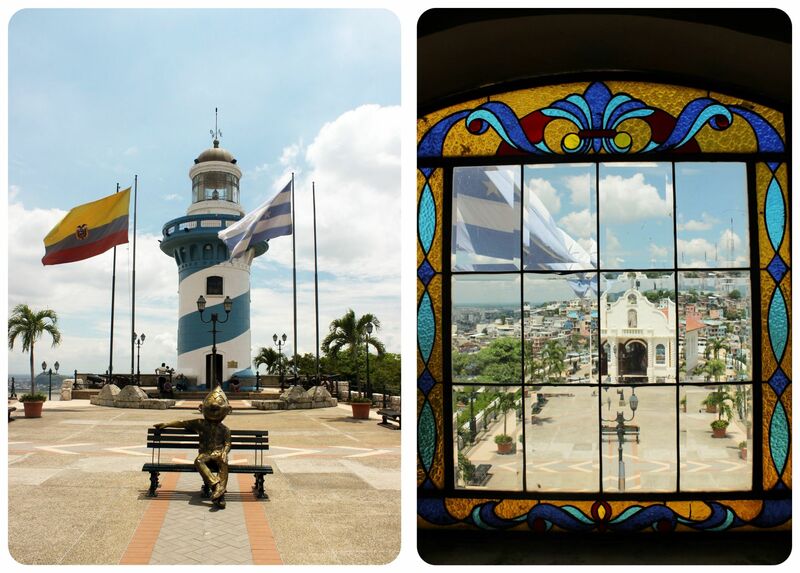 I have to admit that I had never even heard of Guayaquil before I flew to Ecuador. And I don’t know if I would’ve gone there had I not started my trip to the Galápagos Islands in Guayaquil, from where several flights a day leave for Baltra Island in the Galápagos. 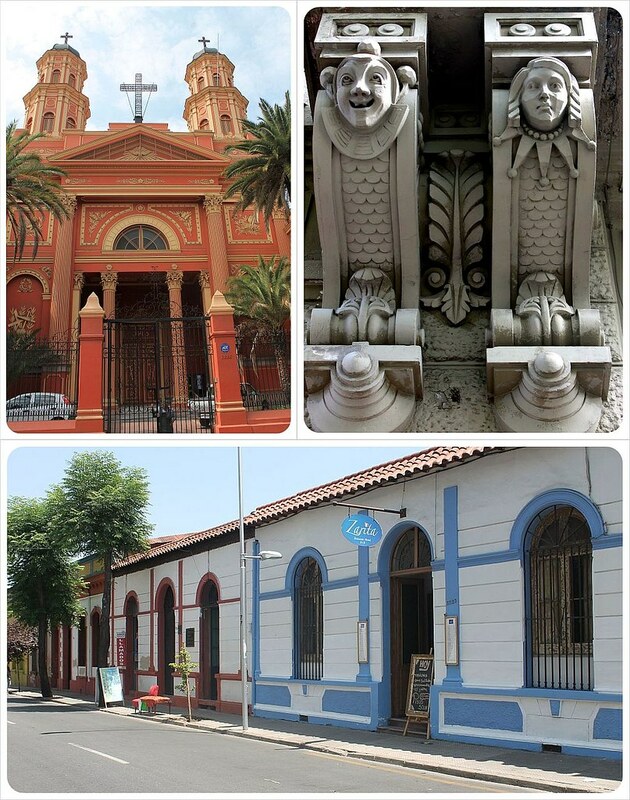 When I did do some research about the city, I found a few sights that sounded like they were worth visiting mentioned in travel guides, and I decided that Guayaquil sounded interesting enough to spend a few days after my cruise. However, the city didn’t make it easy for me to love it. It didn’t wow me with its architecture, and it wasn’t particularly charming. It was rainy and cloudy during my stay, and even though I spent five days in town, I never found a place to eat that I truly loved. 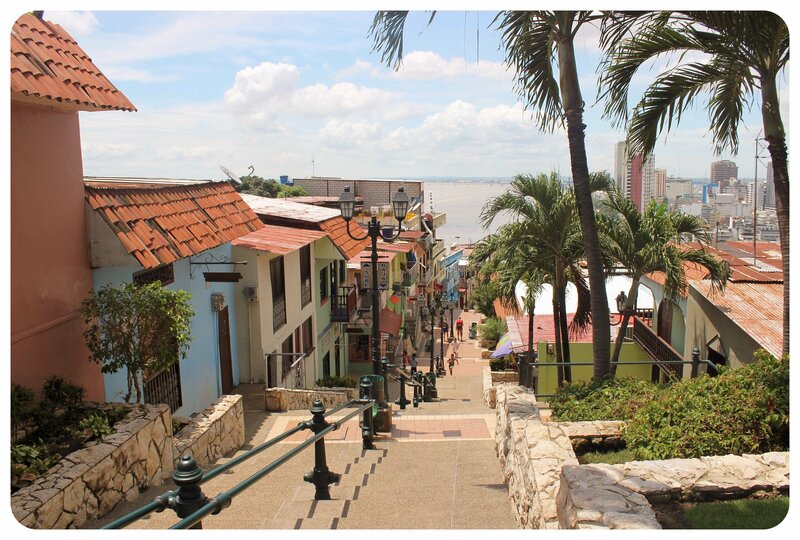 The main attraction of the city seemed to be the revamped Malecon 2000, and I had chosen well with the place I was staying at: a stylish, new hostel right across from the Malecon. 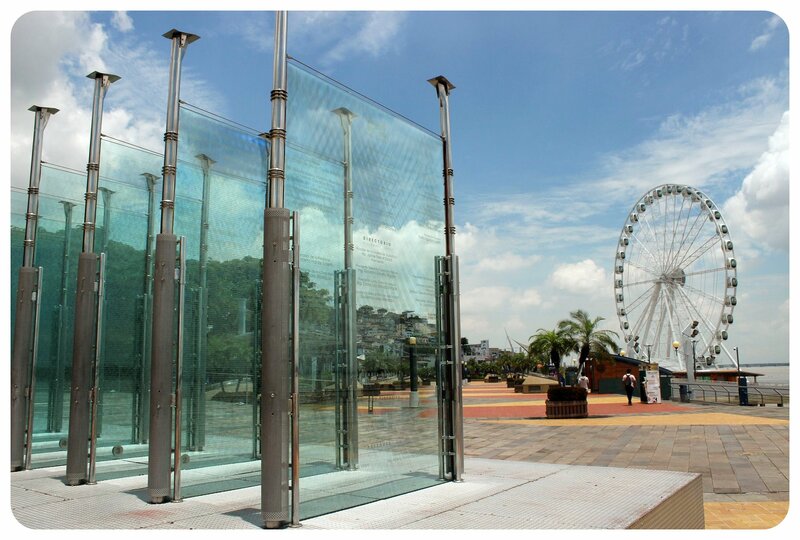 The Malecon 2000 was one of the most extensive urban-renewal projects in South America. Before the malecon was built, this area of the city wasn’t very popular, but these days, the malecon is teeming with people day and night. The boardwalk is made up of ponds, playgrounds, sculptures, gardens and offers sweeping river views. 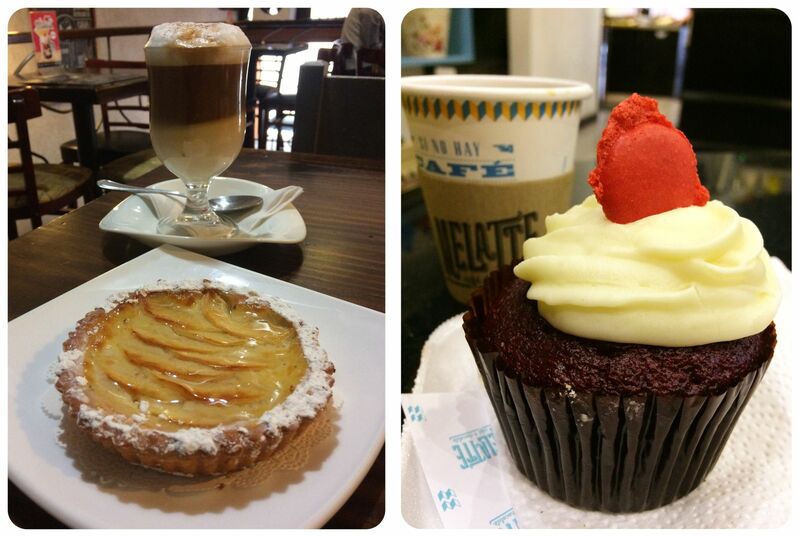 There are restaurants and coffee shops, and even a Moorish clock tower. The Malecon stretches 2.5km along the bank of the wide Río Guayas, from its southernmost point at the Mercado Sur, a handicraft market, to Cerro Santa Ana and Las Peñas in the north (which I would visit later),and was the perfect place for an early morning run – the only time it wasn’t too hot to exercise outside. 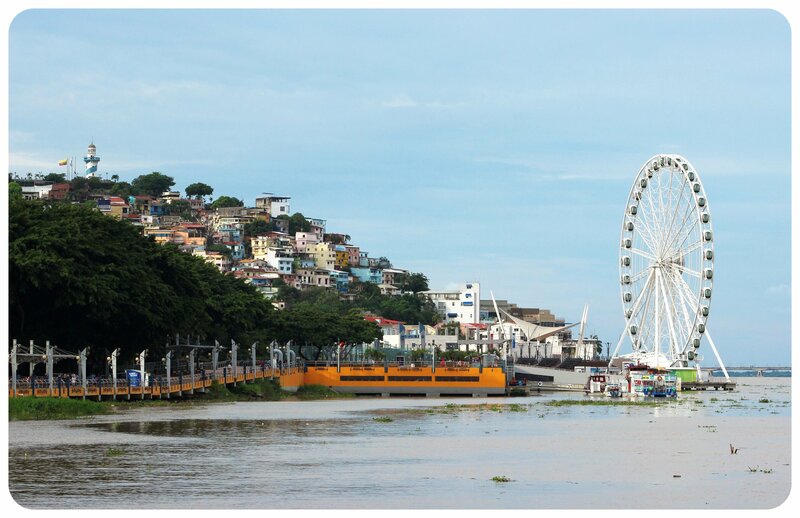 The Malecon is truly beautiful, there is even a Ferris wheel for panoramic views over the city, and an IMAX cinema, where I treated myself to a viewing of LaLa Land one night. 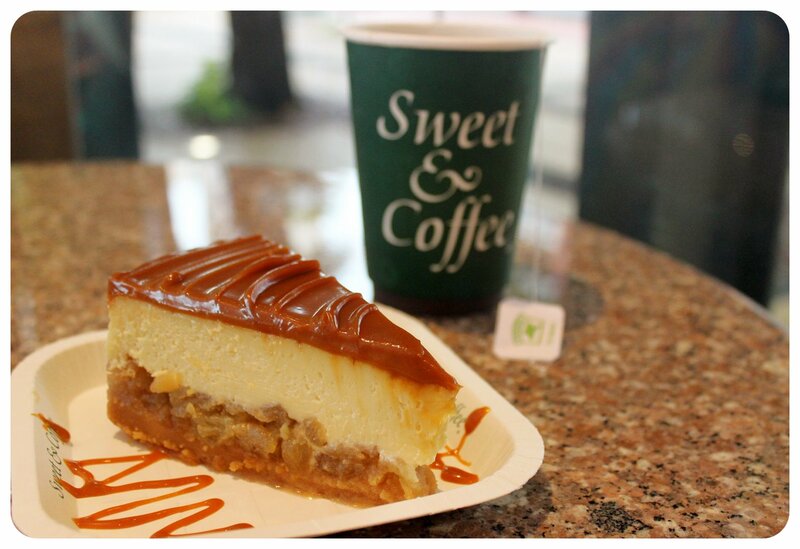 The Sweet & Coffee café right on the Malecon was nice enough to while away an afternoon or to pick up an iced drink and go on a stroll through the manicured parks next to the boardwalk. Ice cream vendors line the boardwalk, and they were constantly busy since Guayaquil was always hot. Rain or shine, the pressing heat never disappeared. Even at night, temperatures would rarely go below 80°F. 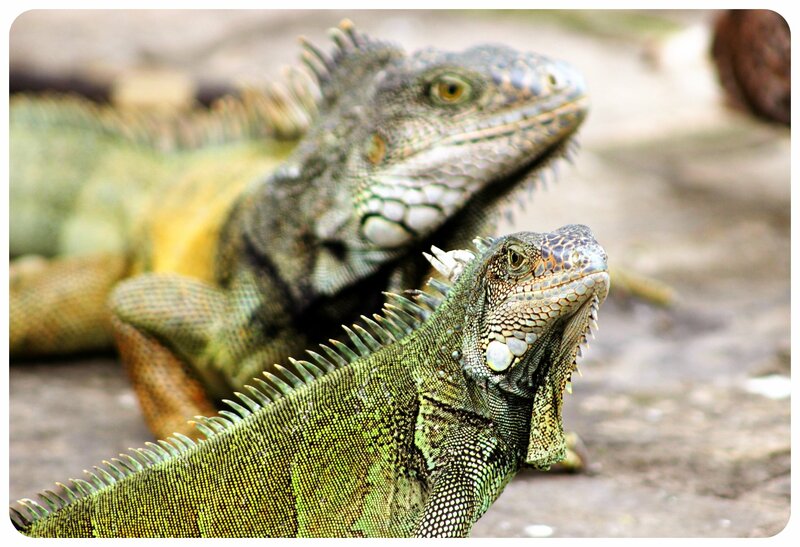 I had read about a park in the city center that supposedly was filled with iguanas, and even though I’d seen plenty of iguanas in the Galápagos Islands, I wasn’t tired of them yet, and I was excited to check out the park and see if it was indeed filled with iguanas. 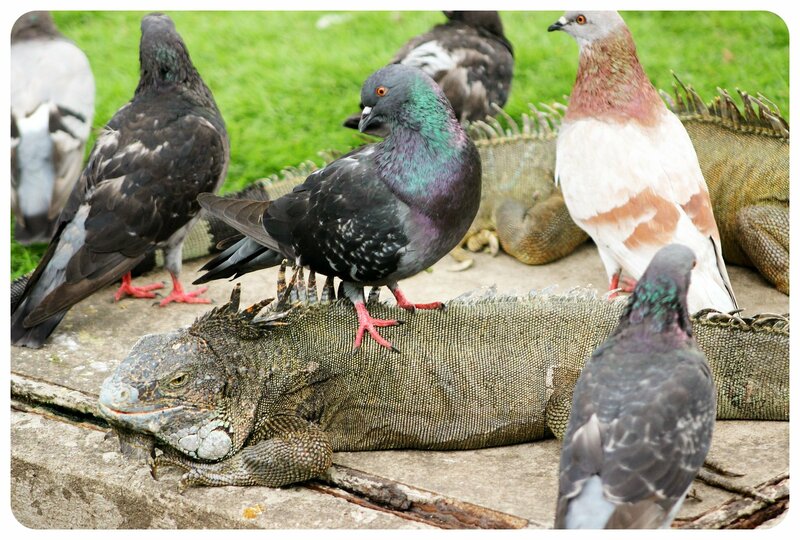 The guide book had not lied: there were dozens of iguanas hanging out everywhere in the small park, with people touching them as if they were fluffy little bunnies instead of leathery reptiles. I was amazed how gentle they were and seemingly unafraid of people – almost like their distant relatives out in the Galapagos Islands. 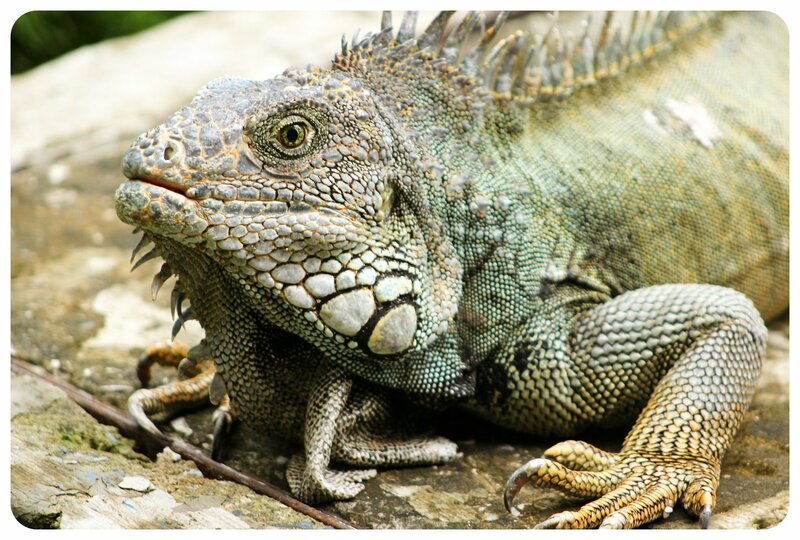 A lady had a stash of ‘iguana food’ on one of the benches – basically just lettuce cut into small pieces – which she was selling. 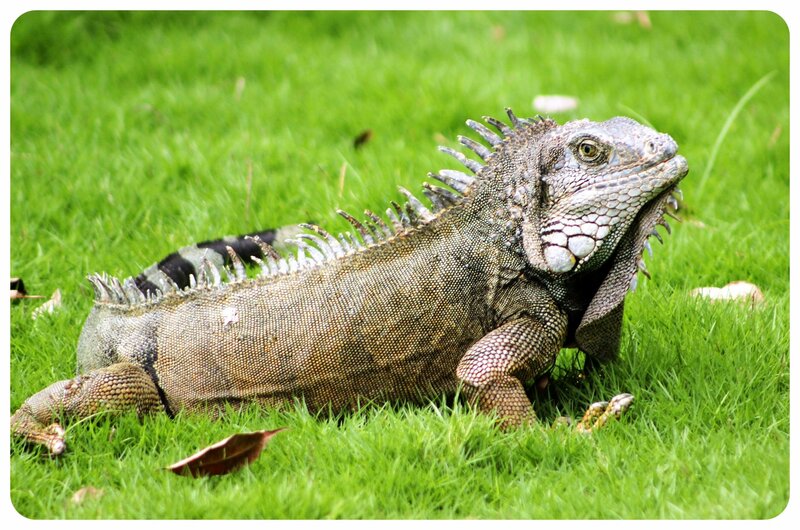 I invested 50 cents in a bag of lettuce and within minutes I was surrounded by hungry iguanas of all shapes and sizes. 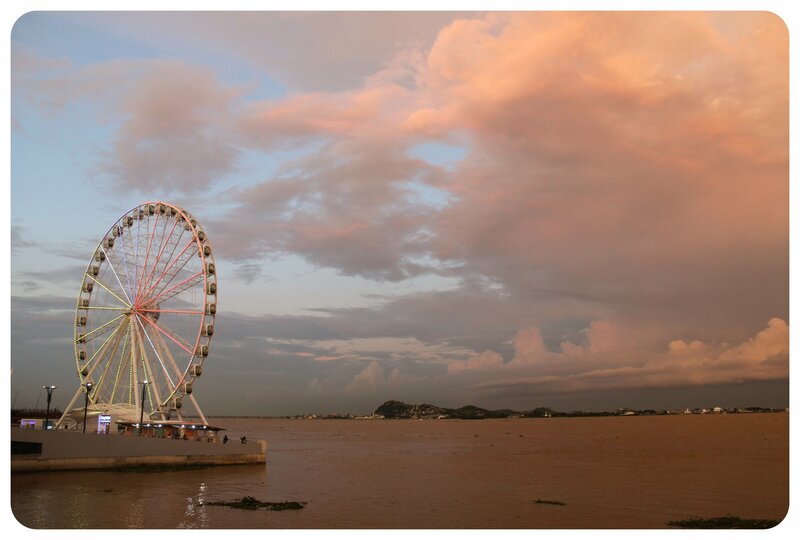 That afternoon ended up being my fondest memory of Guayaquil. 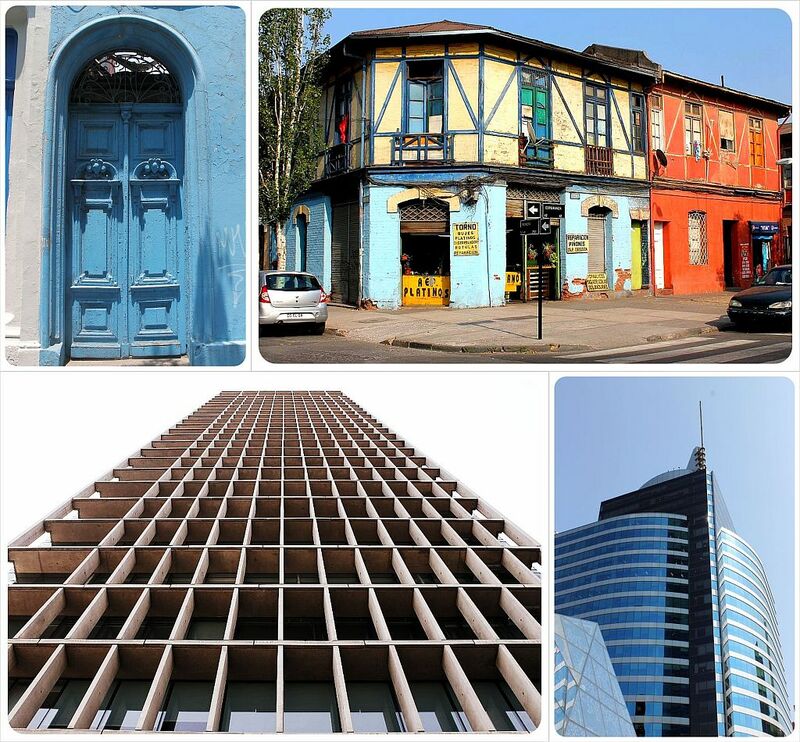 Even though I spent plenty of time wandering the streets of the city, I just didn’t feel much of a connection to Guayaquil. 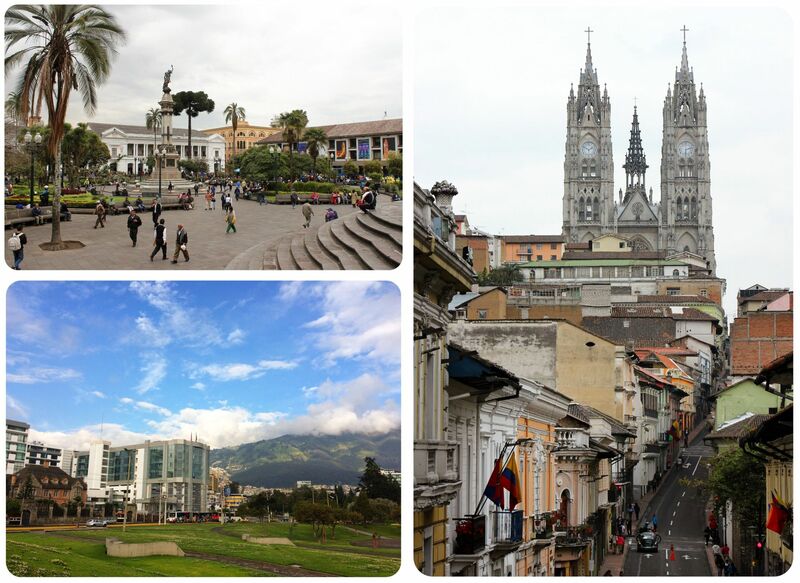 A city of 2.69 million people, it is the largest and the most populous city in Ecuador (yes, bigger than Quito! ), and it seemed mainly to be just that: a big, busy city. 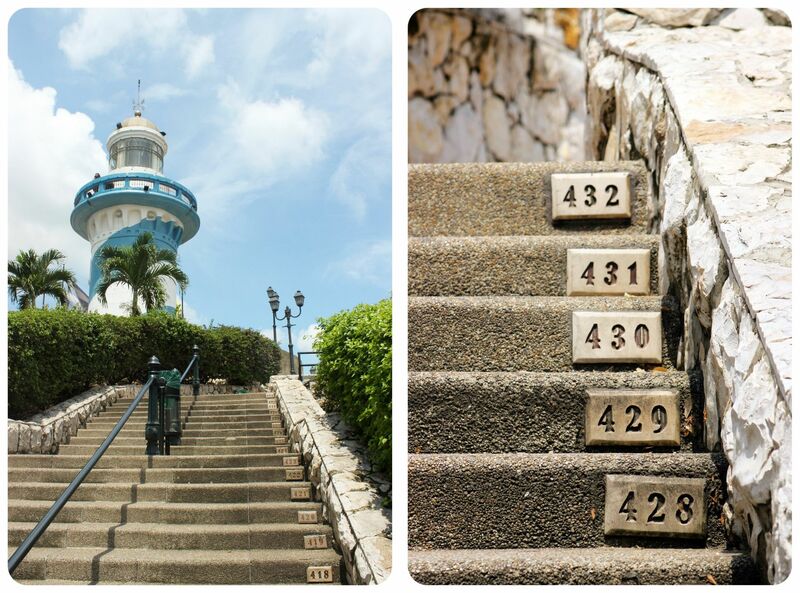 I left the main sight of Guayaquil for my last day, when, for the first time during my stay, the clouds opened up and gave way for bright blue skies: the perfect day to hike up the 432 stairs to Cerro Santa Ana, where you can climb to the top of a lighthouse atop the hill (in case 400+ stairs aren’t enough), which offers beautiful 360 panoramic vistas over Guayaquil. From up there, you can also admire the highest building in all of Ecuador, a modern twisted skyscraper named The Point, and an architecturally interesting structure, albeit at 137 meters (449 feet) tall it is a moderately sized skyscraper in the scheme of things – at least for someone who is used to North American metropoles. 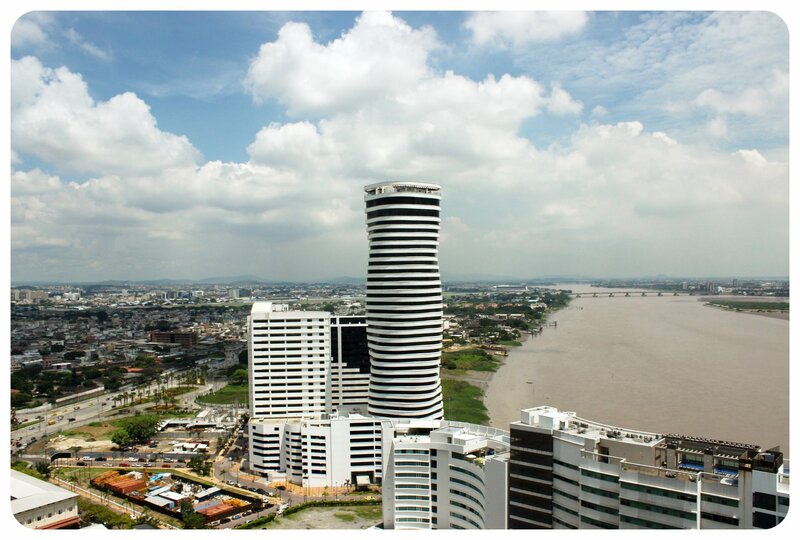 Guayaquil has one of the largest and most important sea ports in all of South America, and the building sits right next to the Guayas River which flows into the Pacific a few miles from there. Even though I left early in the morning for my climb up the hill, I was drenched in sweat by the time I reached the top, but the views were well worth me huffing and puffing my way up the steep little alleyways. 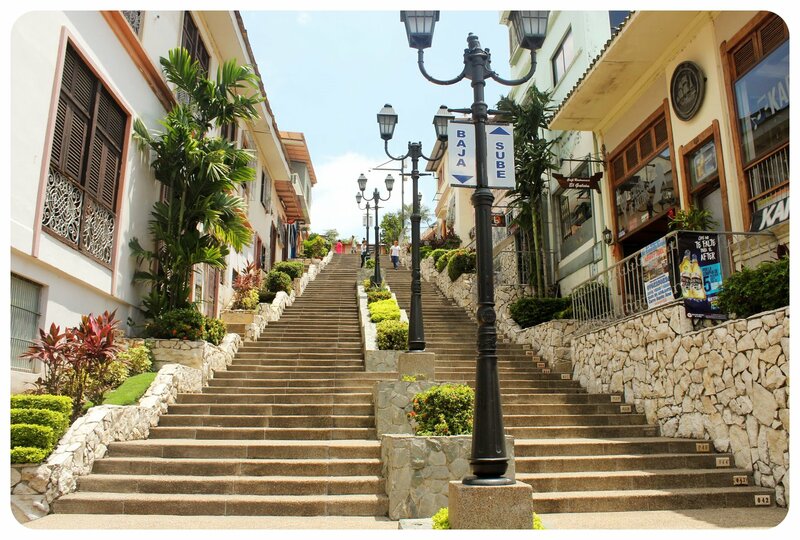 The stairs lead right through Las Peñas, Guayaquil’s oldest neighborhood. The houses there are more colorful than anywhere else in the city, and some of them have stunning wooden frames and balconies. 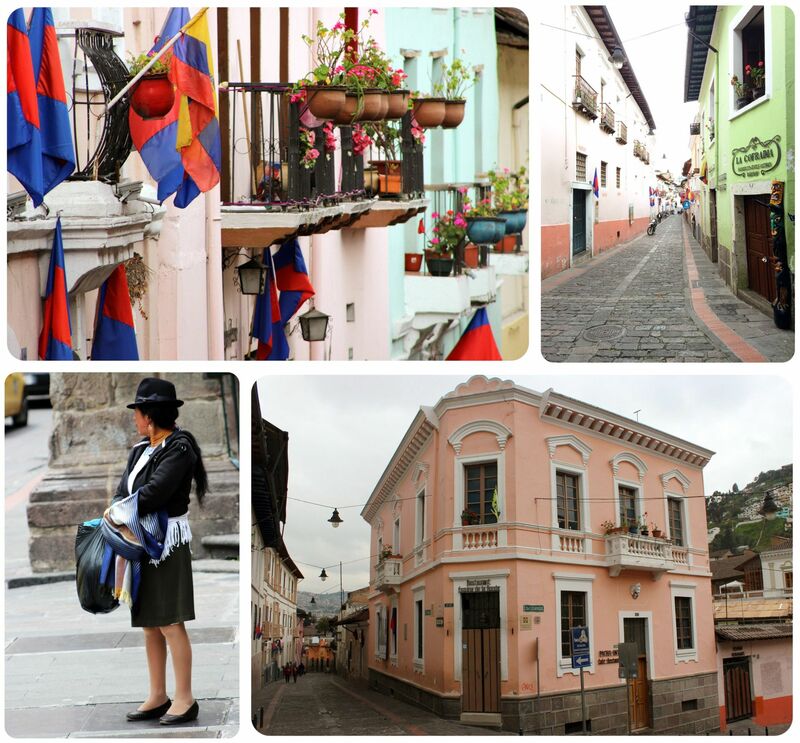 At 400 years old it is one the oldest and best preserved neighborhoods in the entire country, which is why it was declared a ‘Cultural Heritage Of Ecuador’. 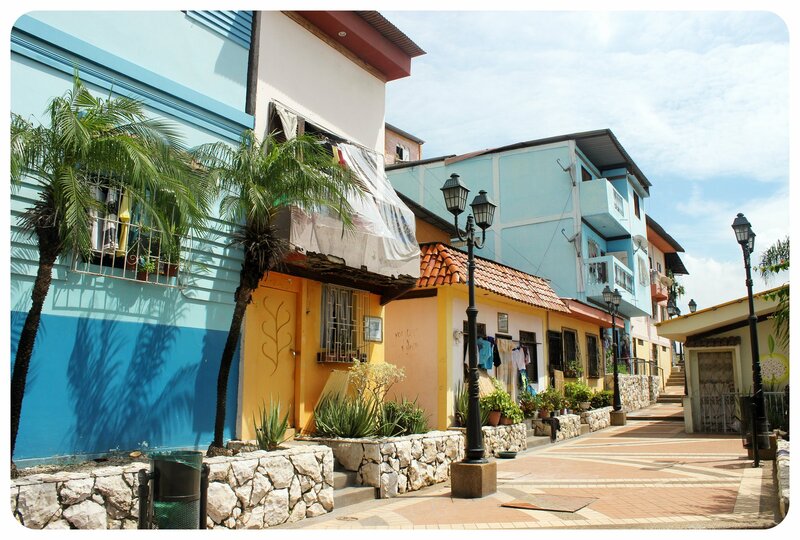 Las Peñas used to be Guayaquil’s poorest and most dangerous neighborhood until a regeneration project transformed its ramshackle buildings into an eye-catching sequence of brightly painted houses, restaurants, bars and shops. 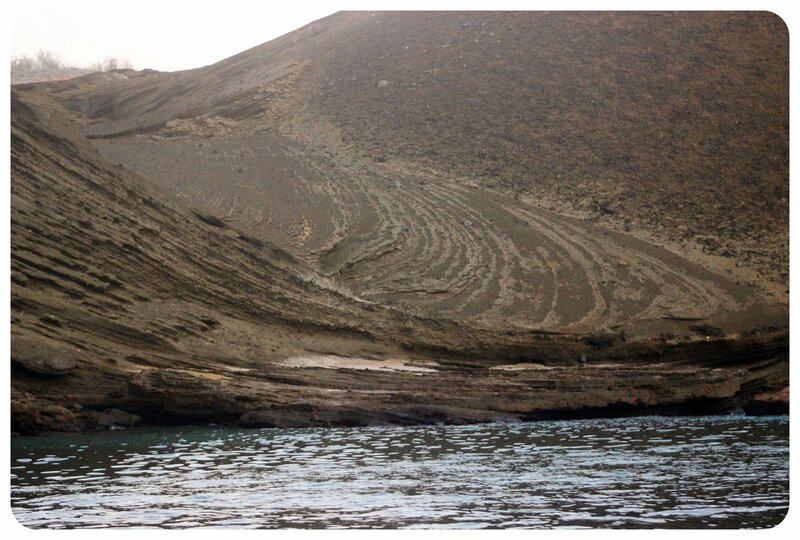 It takes its name from the cliffs and limestone rocks that formed the hill (Peñas = rocks). 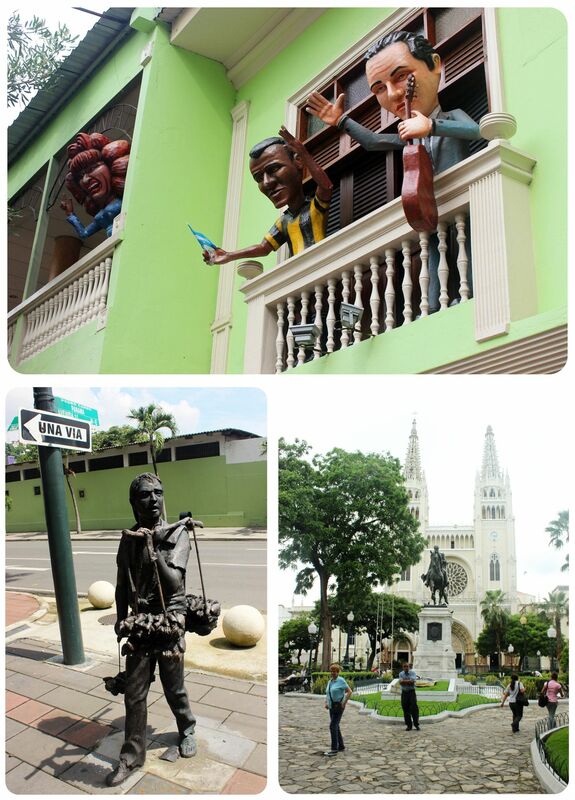 This was easily my favorite part of the city – everything Guayaquil was lacking in charm and personality could be found here. The little alleyways were filled with clotheslines, kids were playing in the streets and cats were lazing on the hot stonewalls. 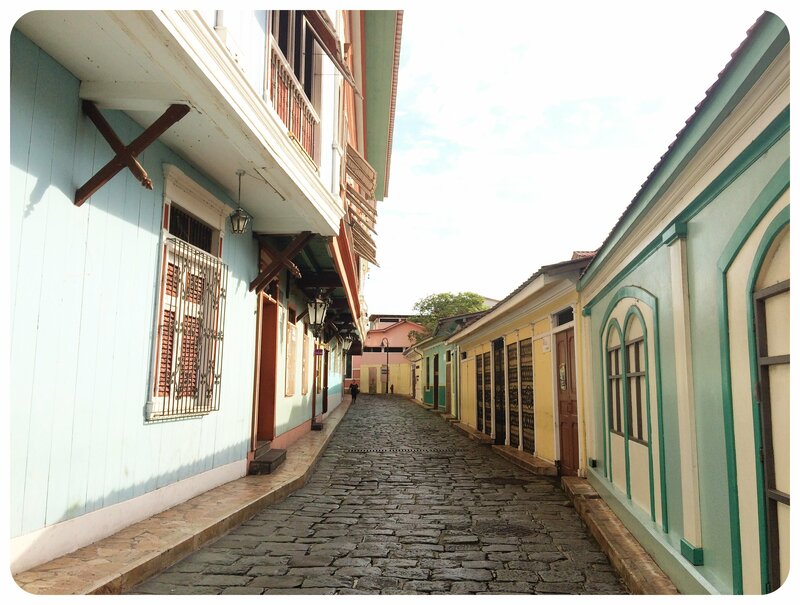 Many of the wooden houses in Las Peñas have been beautifully restored. One of Las Peñas’ most famous (temporary) residents? Che Guevara. 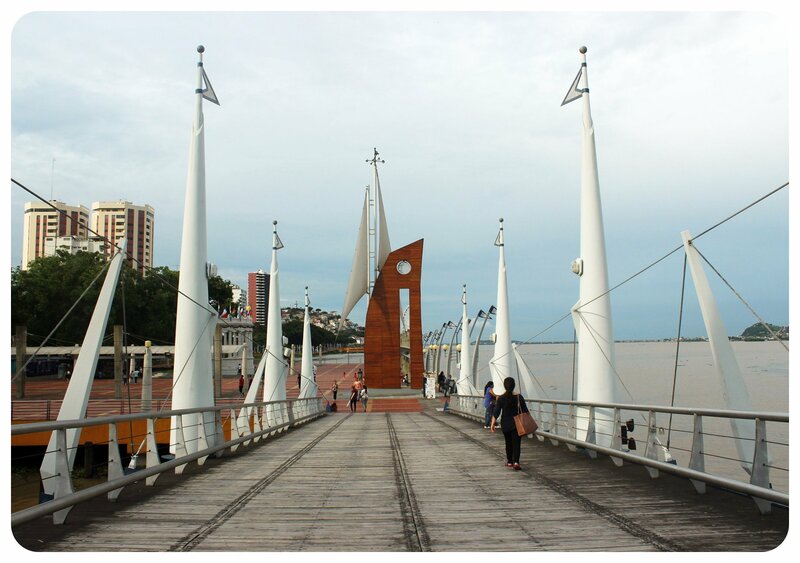 He passed through Guayaquil in 1953 on his famous South American voyage. 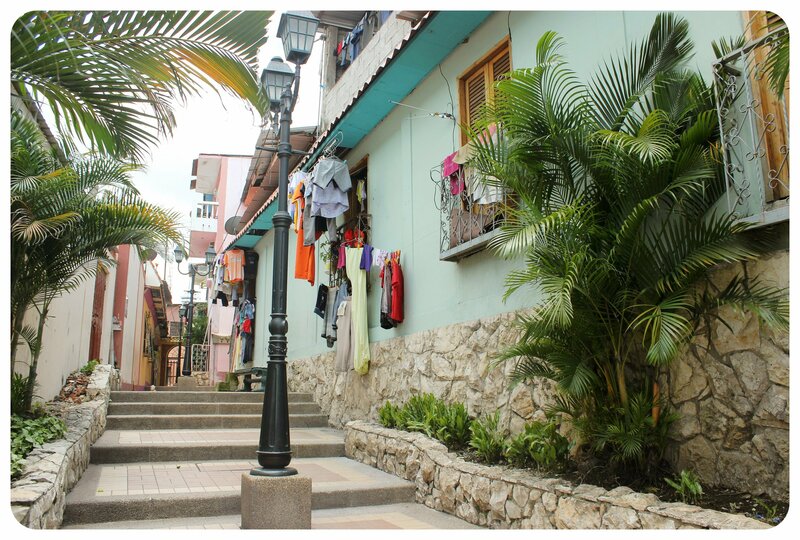 Back then, Las Peñas was a crumbling, poverty-ridden neighborhood. Che gave free pediatric assistance to its inhabitants. 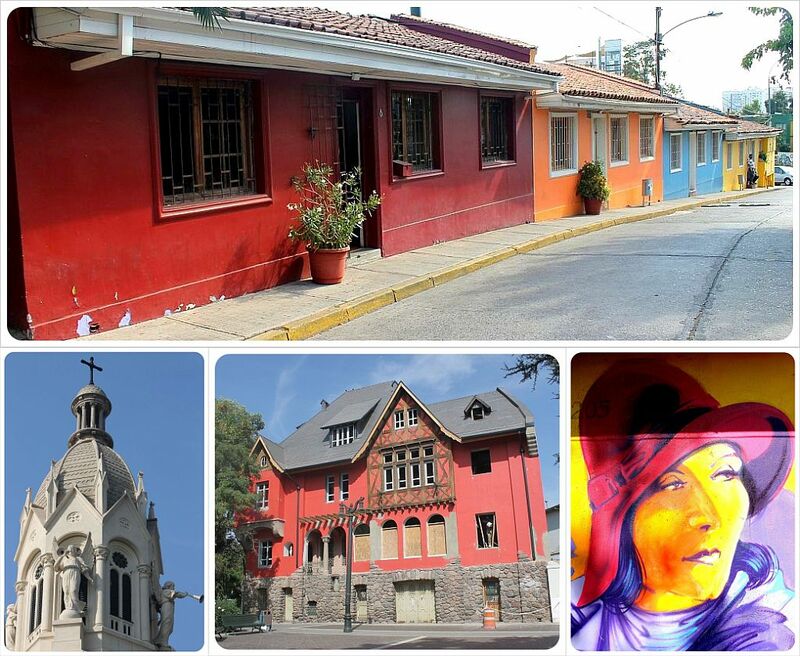 Ernest Hemingway and Pablo Neruda also spent time there. 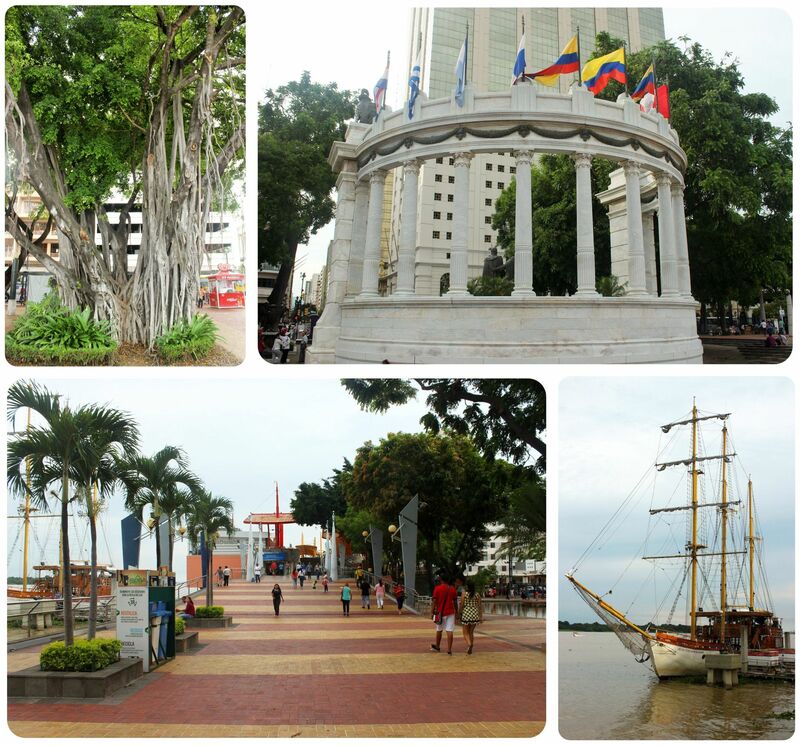 While Guayaquil has come a long way from its poor and crime-ridden past, it is still not the safest city in Ecuador. Several times locals stopped me and told me to put my camera away when I was out taking pictures, and whenever this happens, it makes me feel uneasy. 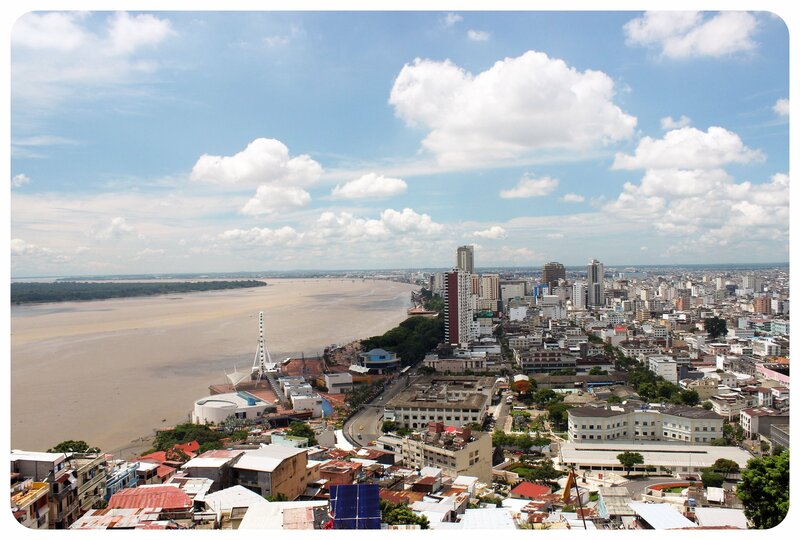 Luckily though, I ended my time in the city on a good note in Las Peñas, where for the first time, I could see the draw of Guayaquil. 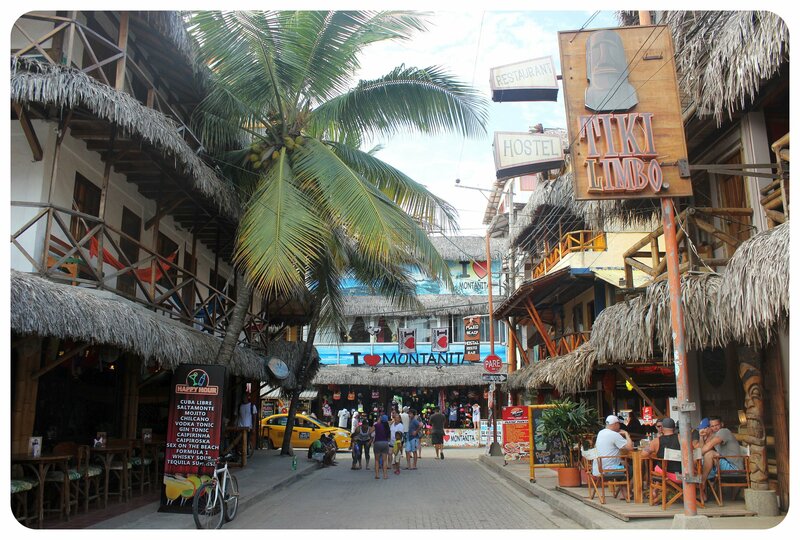 It’s impossible to love every place you visit, and I was happy when I boarded the bus for my next destination: Montañita, Ecuador’s most famous beach town. My Galápagos Islands cruise was a trip I’d been dreaming about for years, but despite that, it still managed to exceed my expectations, which is rare. But, as well as exceeding my expectations, these far-flung, remote islands ended up being completely different to how I imagined them to be. While the Galápagos Islands belong to the tiny Andean country of Ecuador, they are in fact very far from the rest of the country – 560 miles, to be exact. 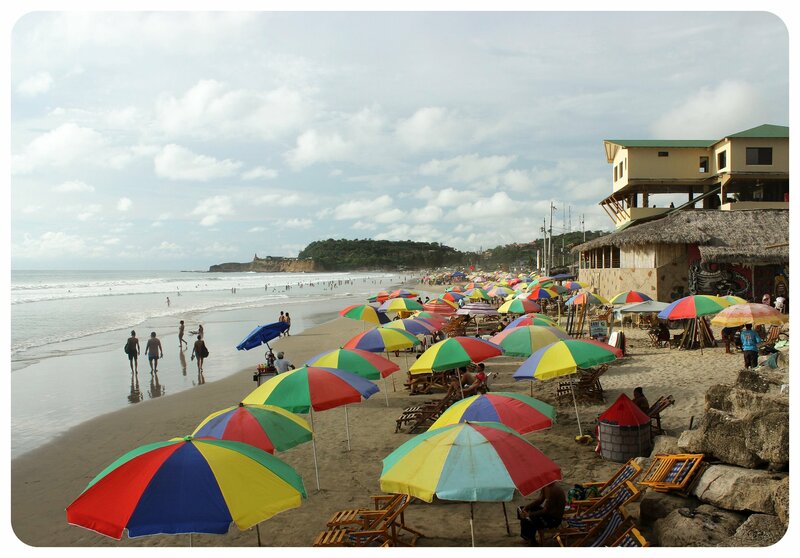 The islands are far out in the Pacific Ocean, and it takes just under two hours to fly there from Guayaquil, the closest airport on the mainland, and 2 hours 15 minutes from Quito, Ecuador’s capital. 2 How Many Islands are There? The archipelago consists of 13 major islands, five of which are inhabited, and six smaller islands. Several of the smaller islets are not inhabited by humans at all, only by wildlife. There are over 100 small islets or rocks in addition to the bigger islands. 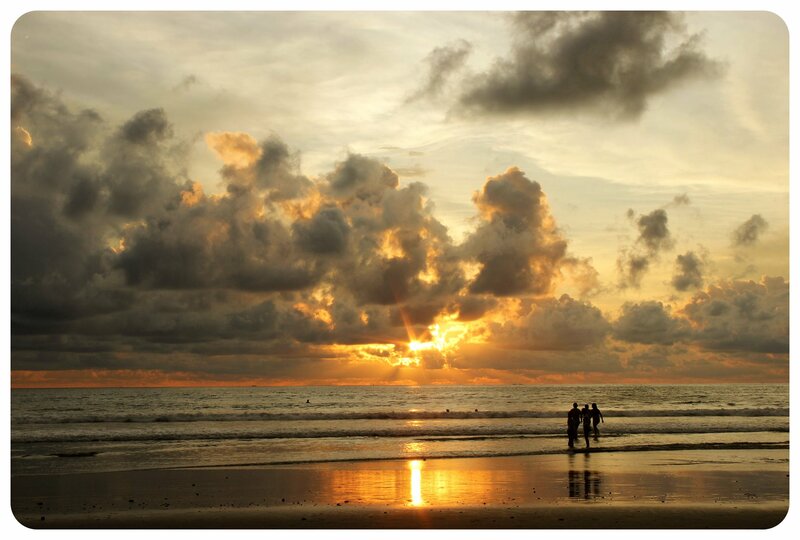 The islands sit right on the equator and are home to over 25,000 people. 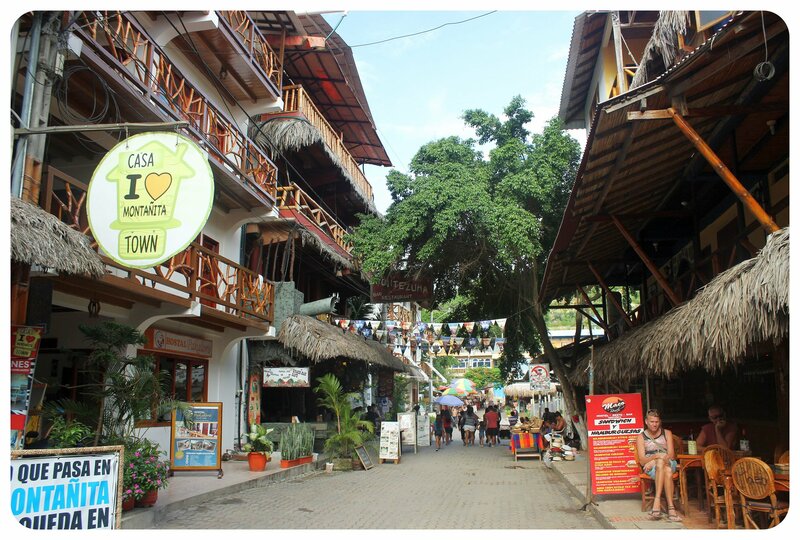 About half of them live in Puerto Ayora on Santa Cruz Island, which makes it by far the biggest settlement of the archipelago. 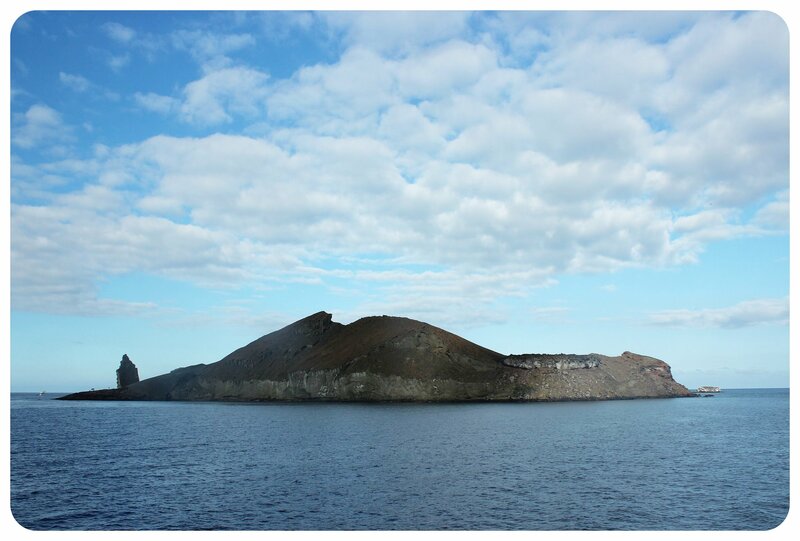 All of the islands are volcanic, and were formed 4 million years ago by lava oozing upward from the floor of the ocean. Some of the volcanoes are active to this day. 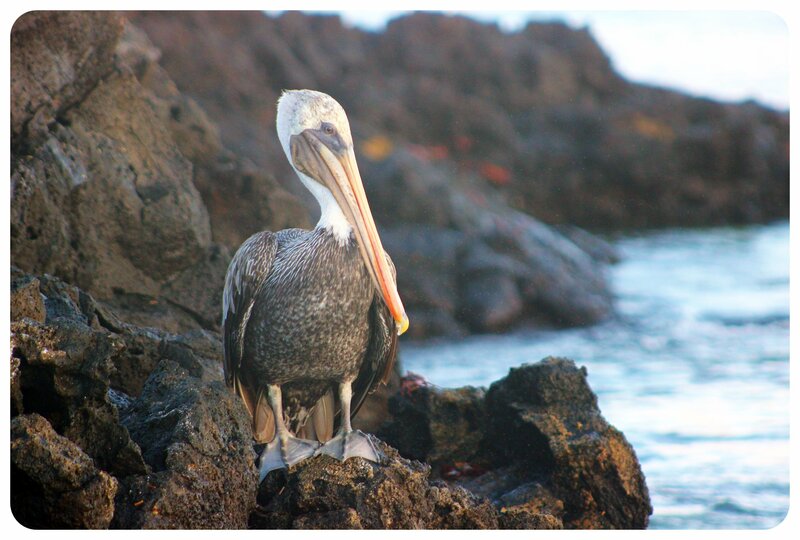 One thing the Galápagos Islands are famous for is their variety of wildlife, including species endemic to the islands, i.e. 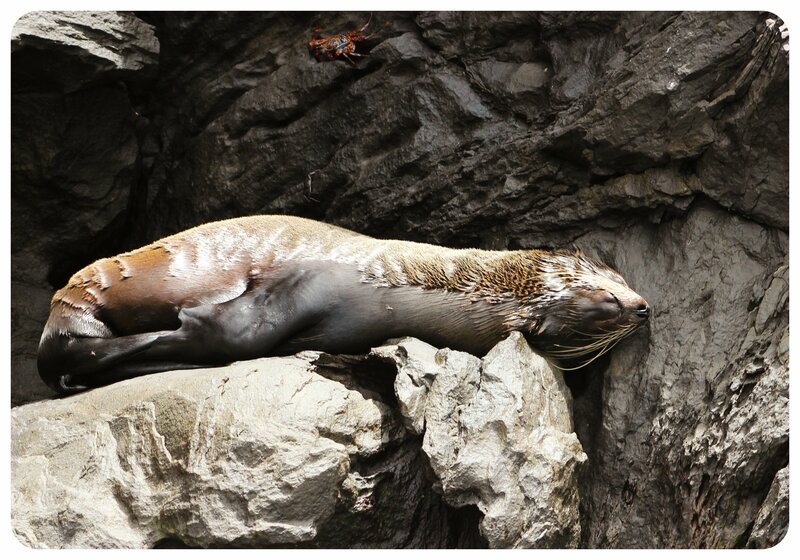 you will see animals that you won’t see anywhere else in the world, such as the Galápagos fur seal, the Galápagos land iguana, the Galápagos sea lion, the Galápagos land tortoise, and the marine iguana (the only lizard that can swim). 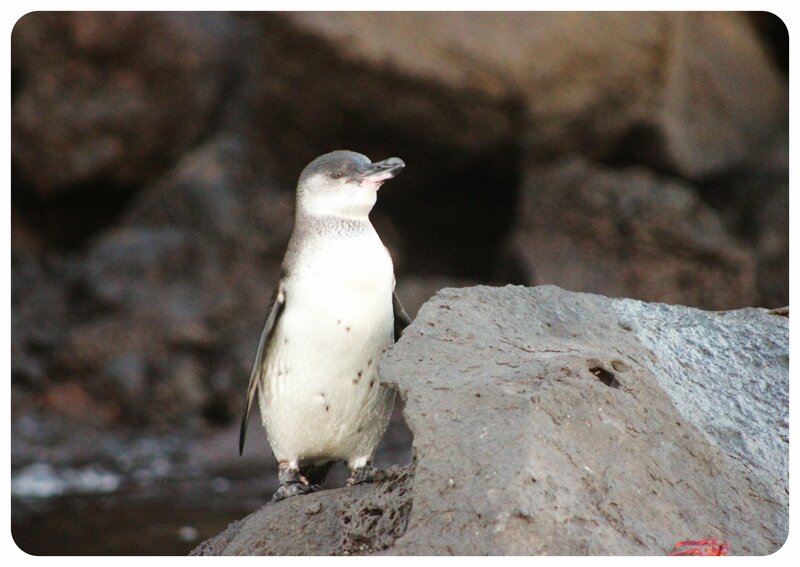 The Galápagos Islands are also the only place in the entire world where penguins live along the equator. 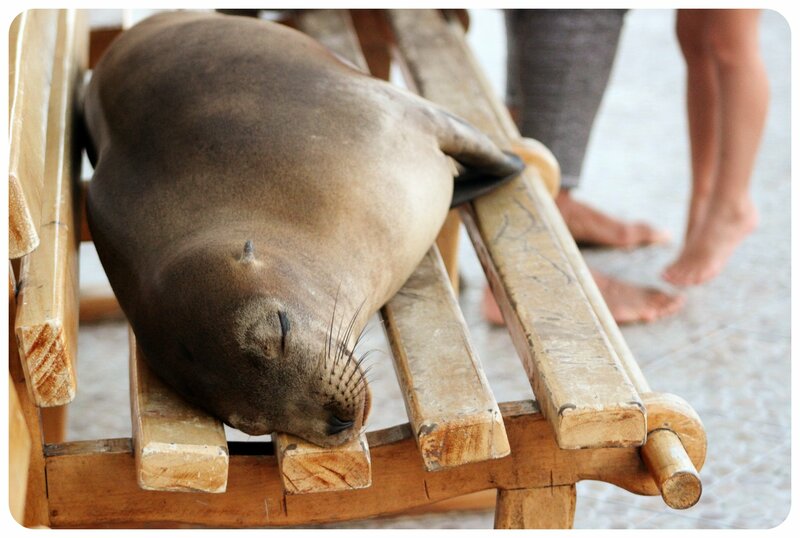 In addition to the species that are unique to the Galápagos Islands, there are dozens of other species, none of which seem to care about the presence of visitors. Sightings of blue-footed boobies, great frigate birds, marine iguanas, giant tortoises, hammerhead sharks, manta rays and flamingos are pretty much guaranteed. Charles Darwin visited the islands in 1835, and his study of the local wildlife contributed significantly to his theory of evolution, later published in his famous book ‘The Origin Of Species’. 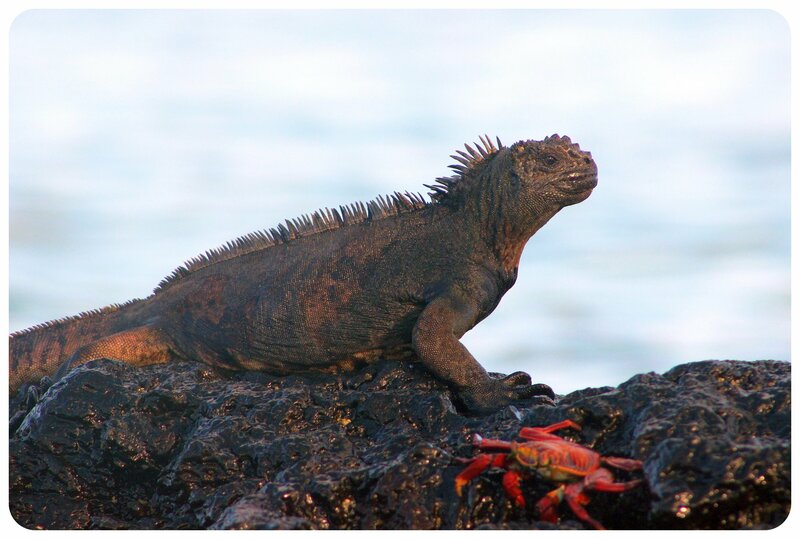 Thanks to their remarkable wildlife, the Galápagos Islands were declared a UNESCO World Heritage site in 1978. 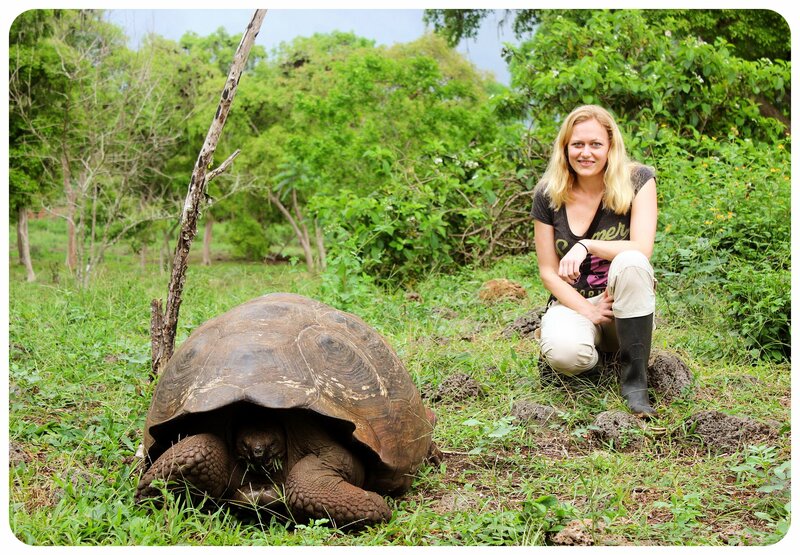 Sadly, many of the species that are unique to the Galápagos, such as the Giant Tortoise, have been endangered for centuries, starting from when Spanish explorers in the 17th century killed them for their meat, and later pirates hunted them for their shells. 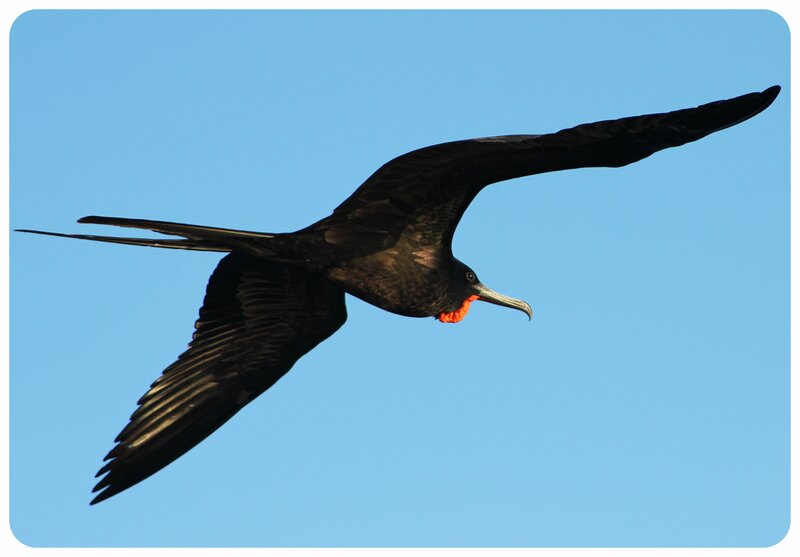 16 of 20 song bird species only found in the Galápagos are threatened, and some species are entirely extinct. It is sad to see so many of these unique species endangered, but the good news is that the Ecuadorian government is putting a lot of effort into protecting this unique eco-system and its inhabitants. 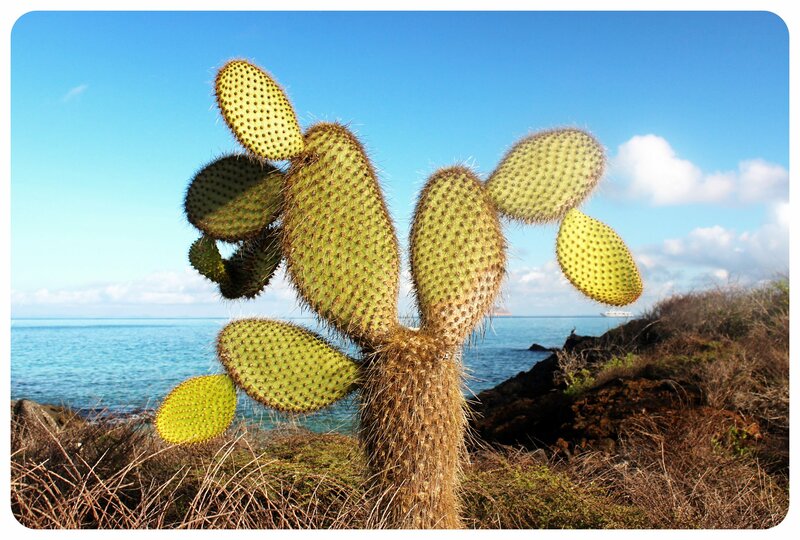 You’ll notice these protective measures even before you board your plane for the islands – it is prohibited to bring in any agricultural goods (like fruits) because non-native plants and animals pose one of the biggest challenges to the conservation of the Galápagos Islands. 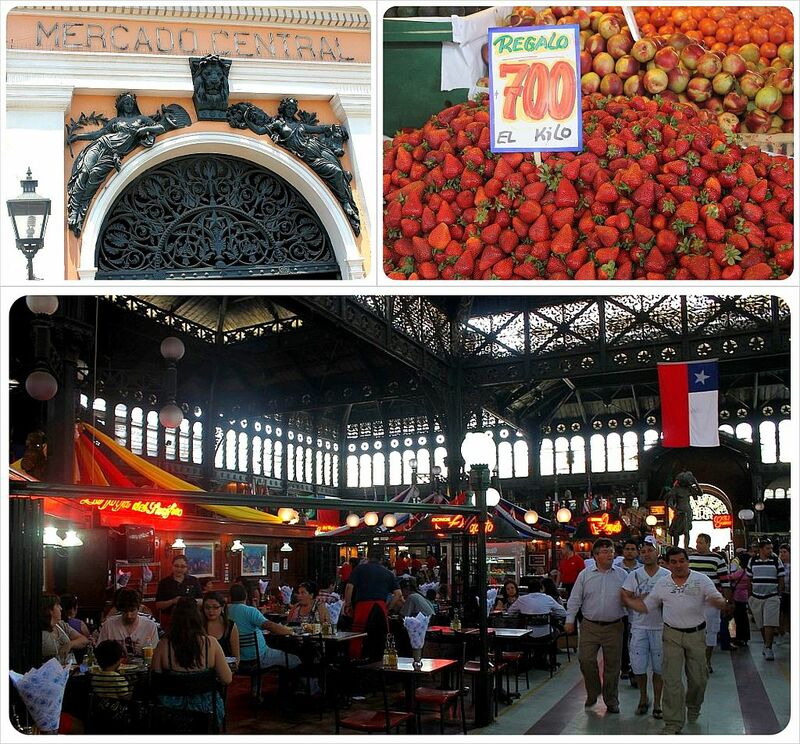 This is why each and every bag is thoroughly checked for fresh produce before you check in. The National Park tax of $100 that every visitor pays upon arrival at the airport also goes towards the protection of the natural habitat of the islands. The Galapagos Islands are often portrayed as this desolate group of islands out in the middle of the ocean – but several islands are inhabited and these don’t have the ‘undiscovered island’ feel which you might have experienced on a visit to the Galápagos pre-1969, when the only way to get there was by boat – daily flight connections didn’t exist. 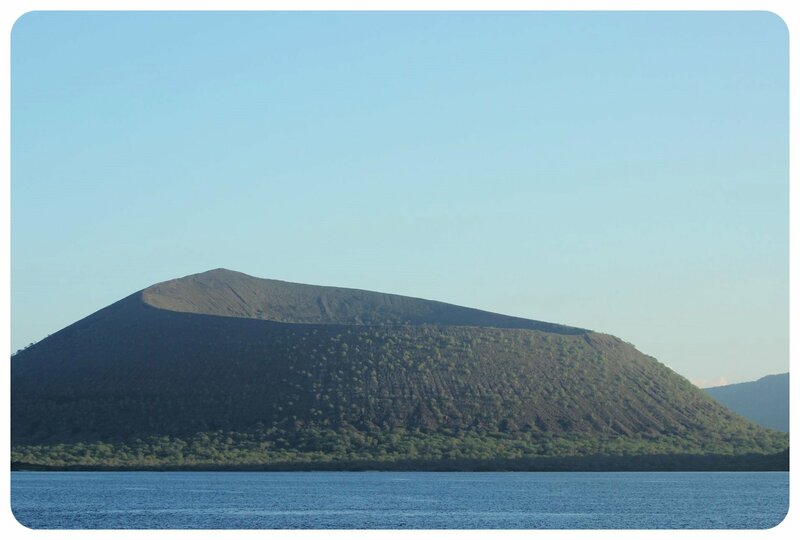 Over 25,000 people call the Galápagos Islands home, with nearly half of them living on Santa Cruz Island. 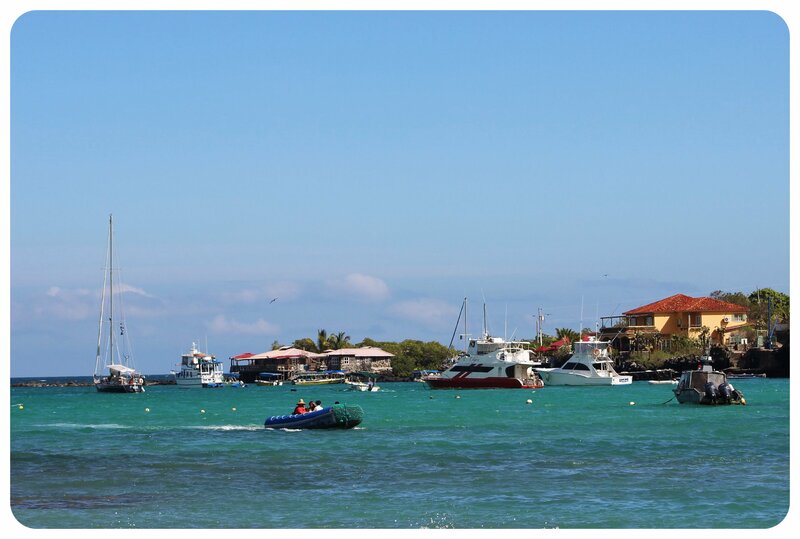 San Cristobal Island is home to 6,000 people, Isabela has 1,800 inhabitants, and a mere 100 people are living on Floreana Island. 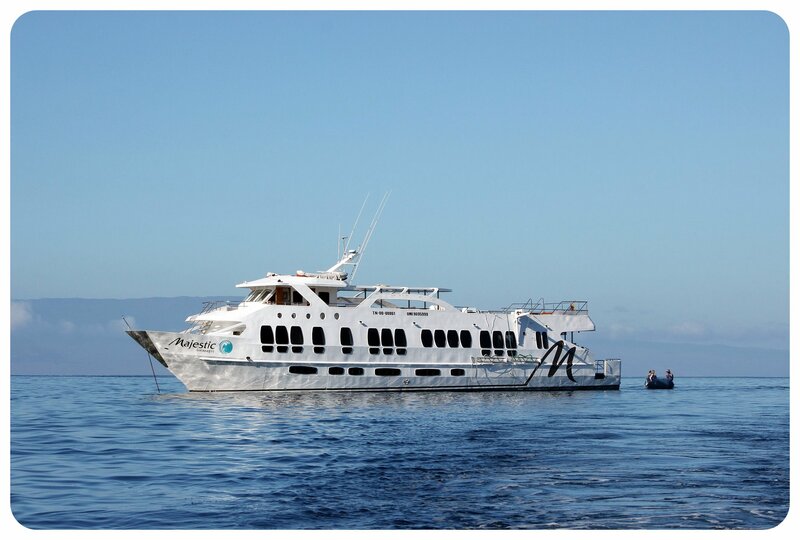 Before booking a Galápagos cruise, it is a good idea to ‘shop around’ a bit: compare prices, see what’s included in the trip and what isn’t, and read reviews of the tour company from previous customers. What’s the itinerary for the cruise? How many passengers are on board? Are there any additional fees you should be aware of? Are snorkeling equipment and wet suits included? 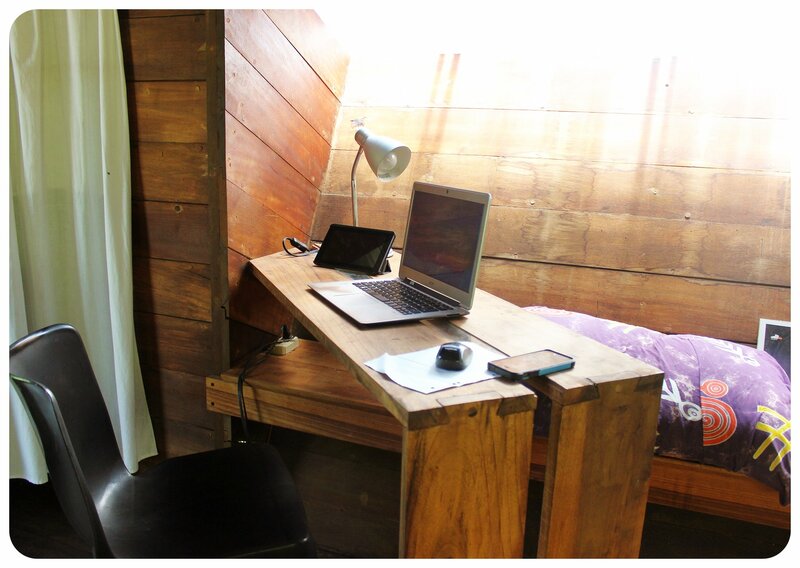 Will there be shared cabins (if you are traveling solo)? 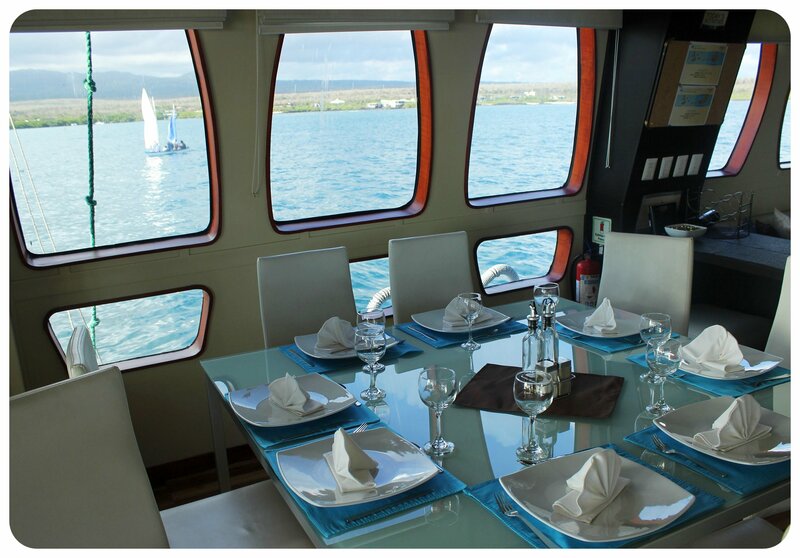 For a long time, the best way to see the Galapagos was to take a cruise, but in recent years it has become much easier to visit the islands independently. 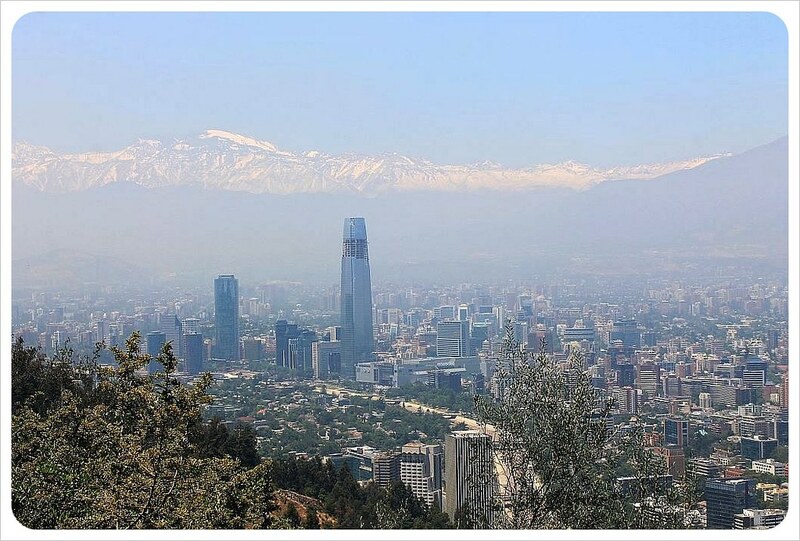 For one, flights from the mainland have become more affordable (the standard fare is currently around $280 for a return flight from Guayaquil, and $300 from Quito). There are more independent guesthouses and hotels on the inhabited islands, and thanks to Airbnb, people on the islands are now able to rent out private rooms or their entire apartment easily. 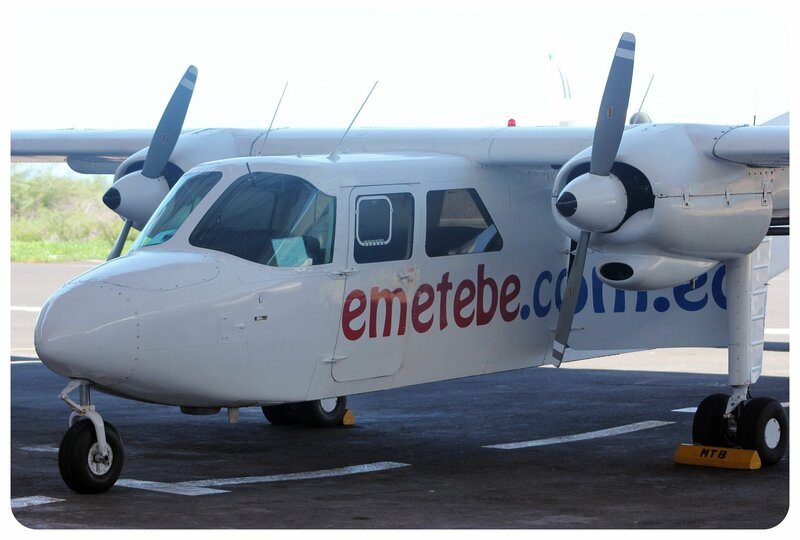 You don’t have to take a cruise anymore to visit the islands – you can simply fly into one of the two airports, Baltra or San Cristobal, base yourself on one of the four islands that are inhabited/have hotels or other accommodation (San Cristobal, Santa Cruz, Floreana and Isabela), and take day trips from there. This is especially interesting for those who’d like to experience this unique group of islands for longer than only a few days. On Airbnb, you can rent apartments for a month or longer, with monthly rentals for less than $1,000 – much cheaper than a week-long cruise. 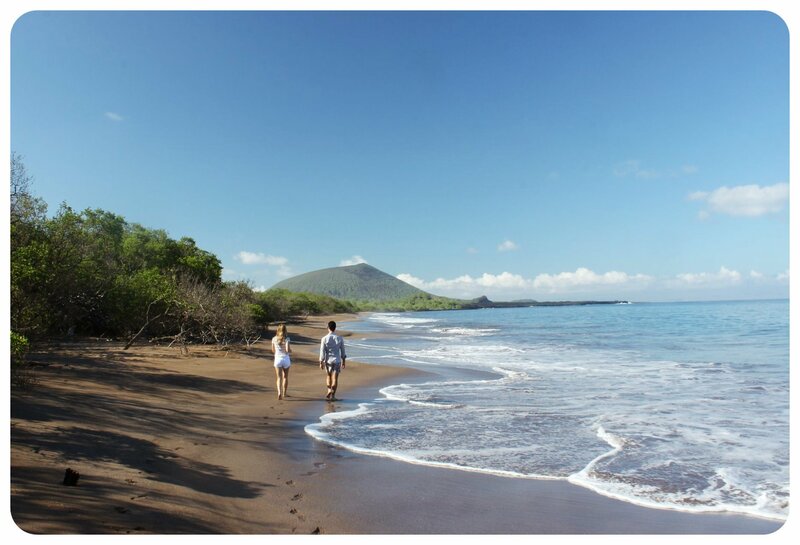 Yes, it is less costly to fly straight to the Galápagos Islands, base yourself there, and then take day trips to other islands or to some of the famous snorkeling spots. However, I greatly appreciated being on a cruise because there are several spots around the islands that are so far from the inhabited islands that it’s only possible to get there if you are on a cruise. If you don’t mind not being able to get to some of the more remote spots (which usually have plenty of wildlife), then basing yourself on the islands is a great way to experience the Galápagos without having to join a tour group (and being ‘stuck’ on a boat with people you may not like for a few days!). This is especially true on Santa Cruz Island, as it is easy to get around via taxi and bus or even just walking. 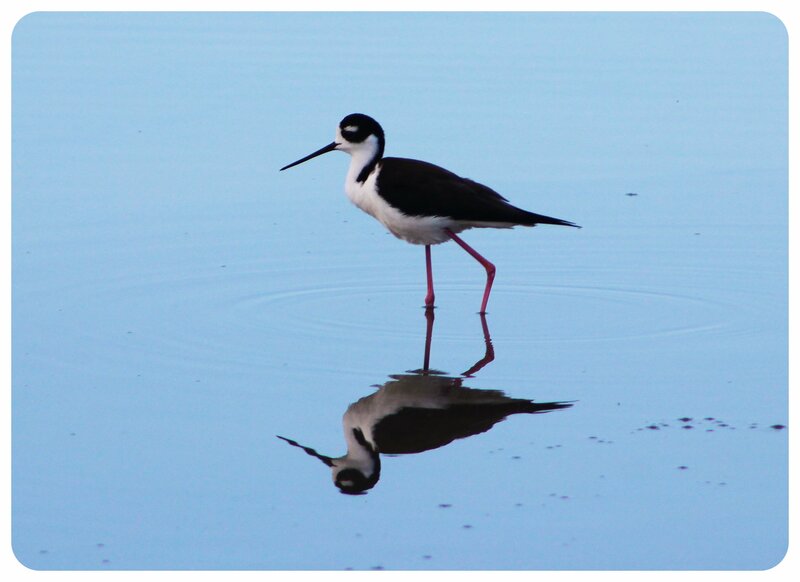 You’ll see wildlife in town (herons and other birds, and sea lions) and you can visit popular wildlife spots on the island. It is also possible to rent bikes to cycle to further away spots. 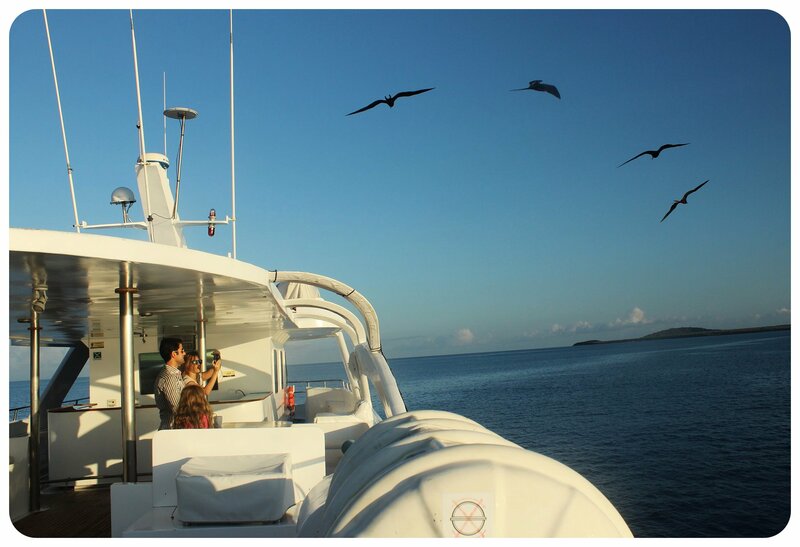 There are ferry services and flights between the inhabited islands – see more details below in #11. 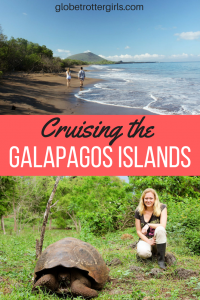 If you are planning to visit the Galápagos Islands as part of a greater South America journey or a trip around Ecuador, like I did, it is definitely possible to find last minute deals to the Galápagos Islands. The first guesthouse I stayed at in Quito had its own on-site travel agency that was selling last-minute deals for Galápagos cruises, and in Guayaquil most hostels, hotels and a number of tour operators sell Galápagos deals. 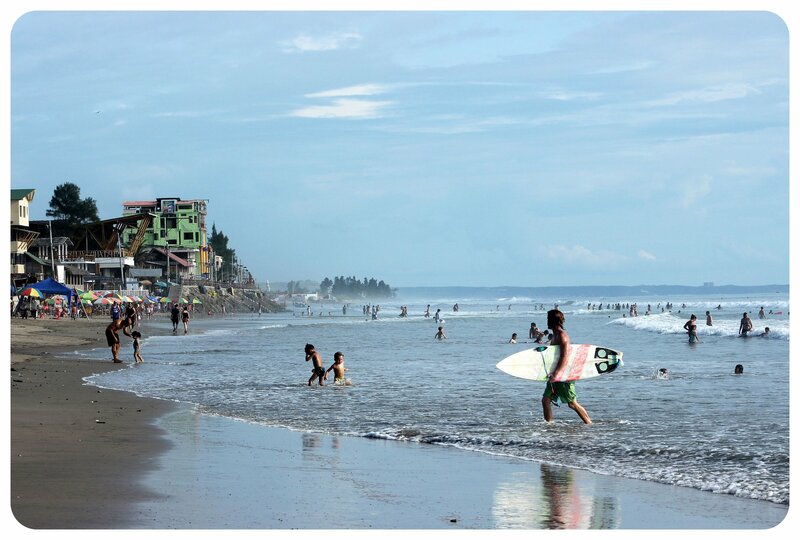 I even saw last-minute offers in Montañita and Cuenca, albeit to a lesser extent. 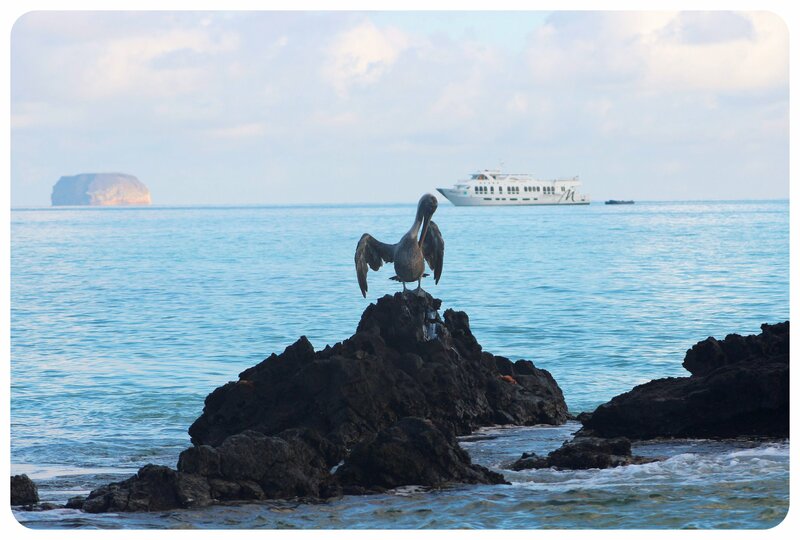 These deals can get you a Galápagos Islands cruise for up to 60% less than the original price of the cruise, it only requires some flexibility on your part – you may need to wait around for a few days for the cruise to leave. Remember that you still have to pay for your flight to get to the islands, which is usually not included in the deal, but which doesn’t go up in price as much as prices within the U.S. would if booked only a couple of days prior to your departure date. 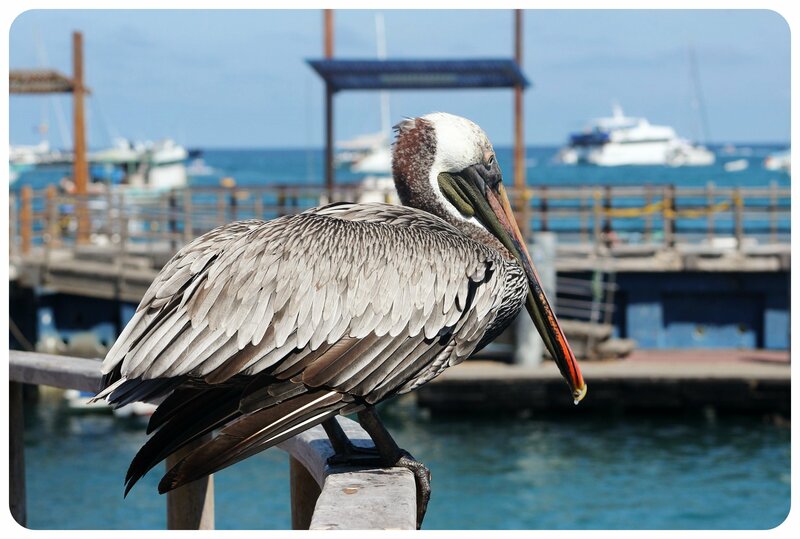 You can also fly directly to the Galápagos Islands and look for last minute cruises directly in Puerto Ayora, where the majority of cruises depart. 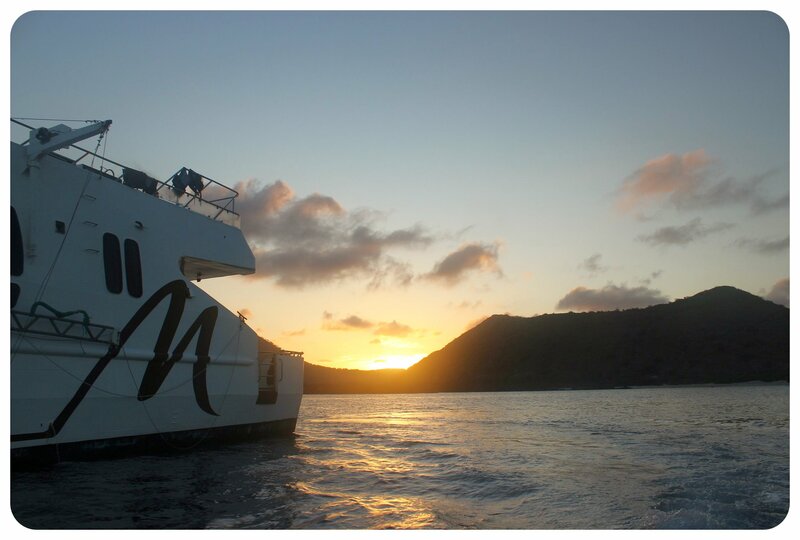 This has the advantage that you can see the boat before handing over the money and meet the guide that will be on board. Having a good, knowledgeable guide can make or break the trip. The prices for last-minute cruises range from $650 to $1,400 (depending on the length of the cruise and the quality of the vessel), but remember that the lowest price also means less comfort on the boat, not the greatest meals, and possibly a less interesting route, which is why it is important to inquire about all of these things before you commit to a boat (see #6). IMPORTANT: Don’t expect to find last-minute deals during peak season though, i.e. between Christmas and New Year’s and around Easter. If you can only travel during these times, you have to book a cruise in advance. This is especially important to know when you book a last minute deal. The prices of Galápagos Islands cruises vary drastically – there are cruises for as little as $1,400, and cruises for as much as $12,000 (regular price, not a last minute deal). Be aware that you’ll literally get what you pay for. What does that mean? Well, on budget cruises it is common to share a cabin with a stranger. A friend of mine who booked a last minute cruise for around $1,000 had to share a cabin with a fellow passenger – who happened to be a man. 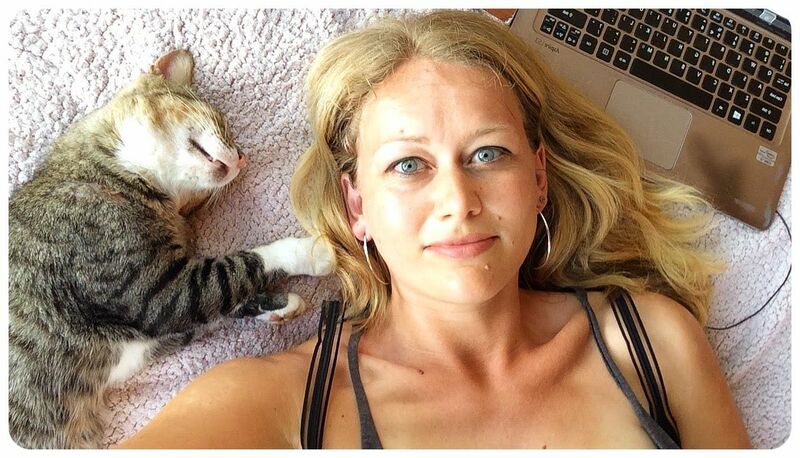 Luckily for her, it worked out well, but I know that not everybody would be comfortable in a situation like that. And I was spoiled on my luxury cruise with snacks after every snorkeling trip and land excursion, as well as buffet-style lunches and dinners, with plenty of vegetarian options, but budget cruises have a more limited selection of food, no snacks in between meals, and the quality of the food can be disappointing. Budget cruises also may not have the best quality equipment for snorkeling and diving, or charge an extra fee for wet suits / snorkeling equipment. WikiTravel has a comprehensive list of Galapagos cruise operators, from budget to splurge, along with some more tips what to look out for when booking a cruise. Cruises range from four to eight days. But be aware that if you take a four-day tour, this includes flying in and flying out, which means that essentially you will only have three or a max. 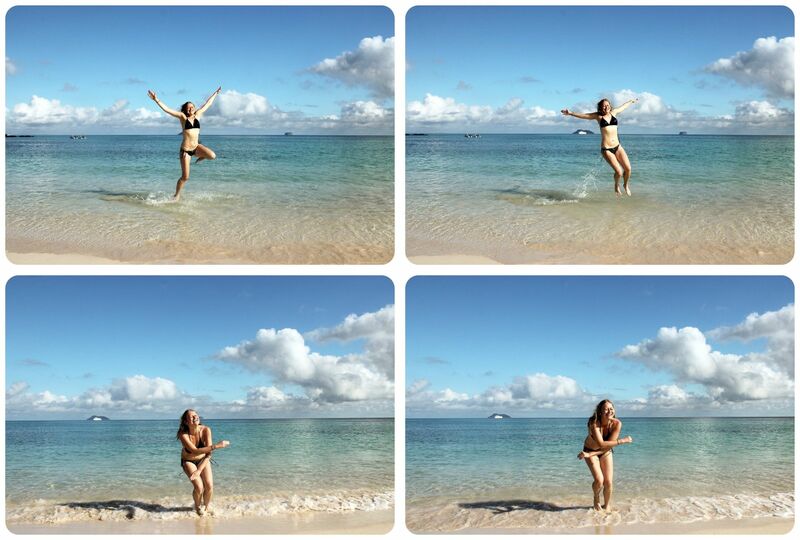 of three and a half days on the islands. I’d recommend at least a five day cruise, but if you can afford an eight day cruise, definitely go for it. Boats range from 16 people yachts to 98 passenger boats. Mid-sized boats fit 48 passengers. It makes a big difference if you are on a small yacht where all passengers can go on land and snorkeling excursions together, or if you are on a big boat where people have to take turns and do the excursions in smaller groups. Basically, you’ll have to be okay with spending time on the boat just waiting until it’s your turn if you choose a larger boat. There’s also less of a ‘remote islands’ feeling to a cruise with 97 other passengers. 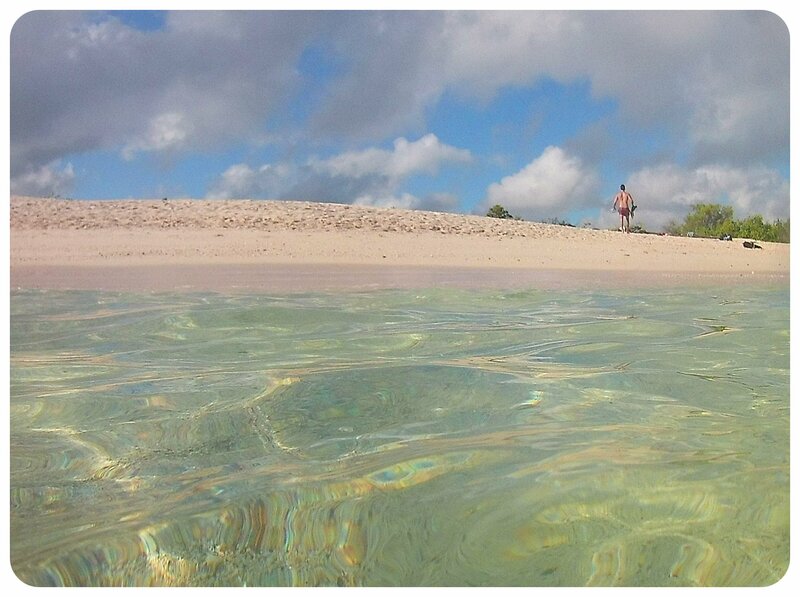 When my small group went on an island excursion, it truly felt like we were the only ones there, and I loved not having to take turns when snorkeling. I was a bit worried about getting seasick, considering how far out in the open ocean the islands are, but I visited during dry season (January – June), when the seas are generally calmer than during wet season (July – December). During my first night, I did feel a bit dizzy when the boat started moving, but luckily the feeling passed quickly. To be safe, I’d recommend wearing a seasickness wristband, which some of my fellow passengers were using. If you are prone to seasickness, try not to cruise the islands between August and October, when the ocean is the roughest. Sailboats generally move more than wider motorboats and catamarans, so check what kind of boat you’re traveling on. 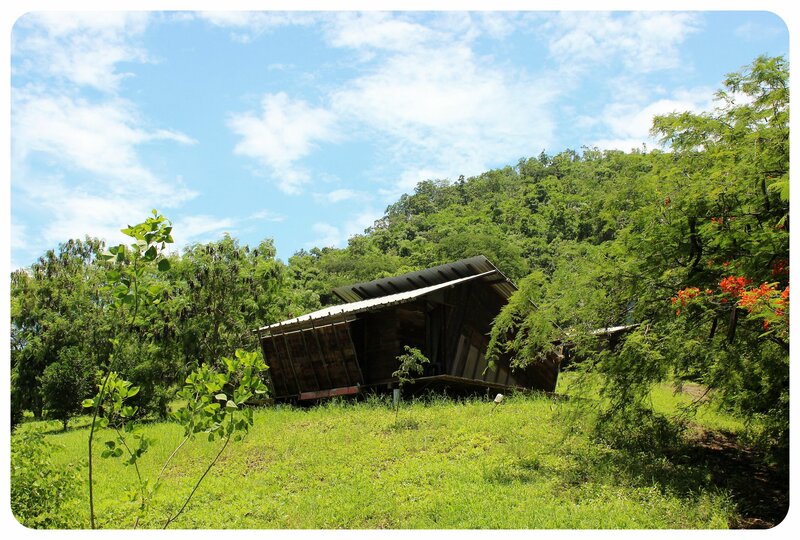 The location of your cabin does play a role too. Ask for a cabin located in the middle of the boat, away from the motor and as low as possible (lower deck, if there are two decks). 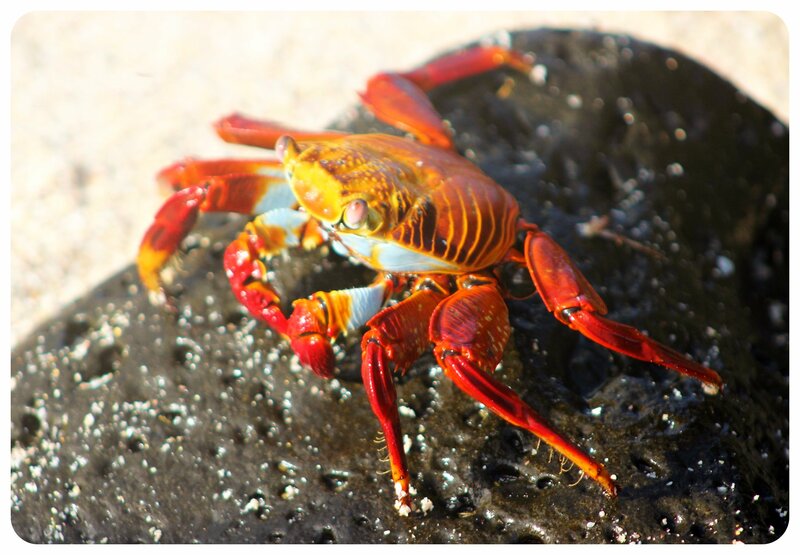 11 What Does it Cost to Visit the Galápagos Islands? Between June and December, during wet season, cruises are 15% to 20% cheaper. You have to tip your guide and crew (budget $10 – $20 per day for tipping, depending on the price you’re paying for your cruise. 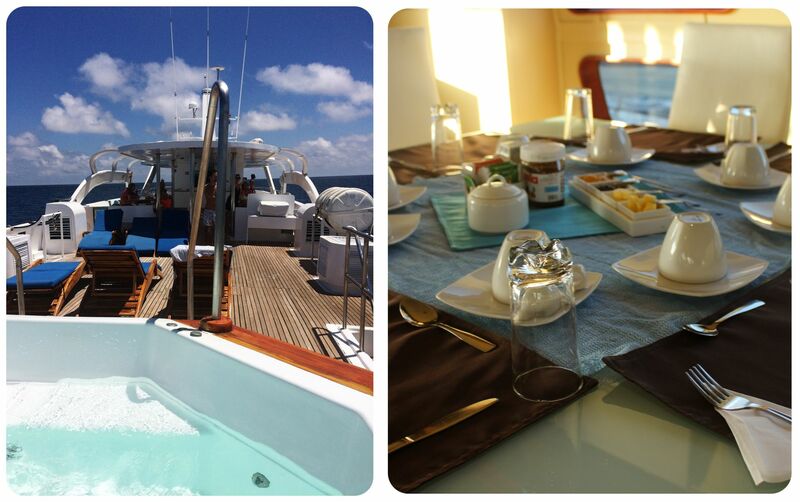 As a rule of thumb – the nicer the boat, the higher the amount is that you’re expected to tip). If you visit the islands on your own, you can find a private room in a hostel, guesthouse or Airbnb for around $30 per night. Entire apartments start at $50 per night. Booking.com has plenty of double rooms for less than $40 a night. Ferries in between the islands are around $30 per person, and there are flights between Baltra, Santa Cruz, Isabela and San Cristoba, which are around $160 one way. Tours range from $60 to $180 per person, depending on the length and scope of the tour. On the topic of money, it is noteworthy that there are very few ATMs on the islands, and if you are not basing yourself on one of them, taking a cruise instead, you may not even come across one – we wouldn’t have stopped in a port with an ATM at all, had the national election not taken place during my visit, which meant the crew on our boat had to visit land to vote, and we had some free time in Puerto Ayora. Ecuador introduced the U.S. Dollar as its official currency in 2000. All ATMs give U.S. Dollars, or if you are visiting from the U.S., make sure to bring enough cash from home, because not a lot of businesses take credit cards. 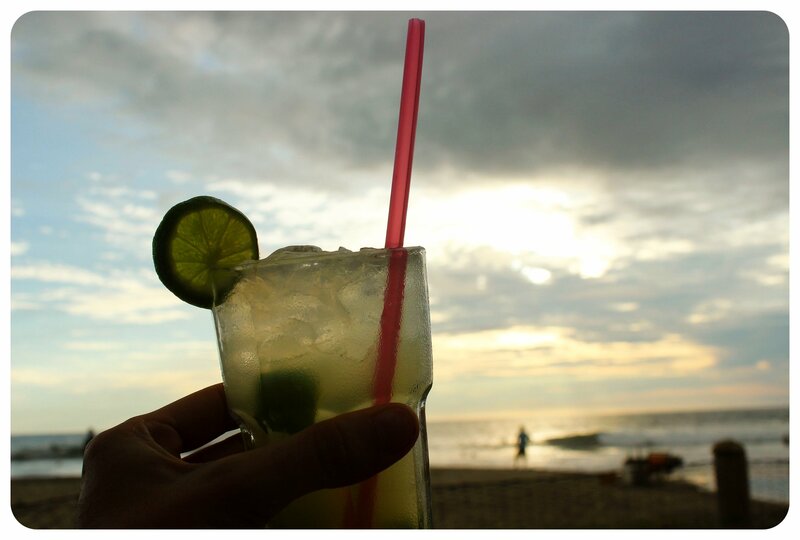 You’ll need cash for alcohol on board, to tip your crew, and if you stop at a bar or restaurant in Puerto Ayora or San Cristóbal, where cash is king. Note that most places do not accept $100 bills. 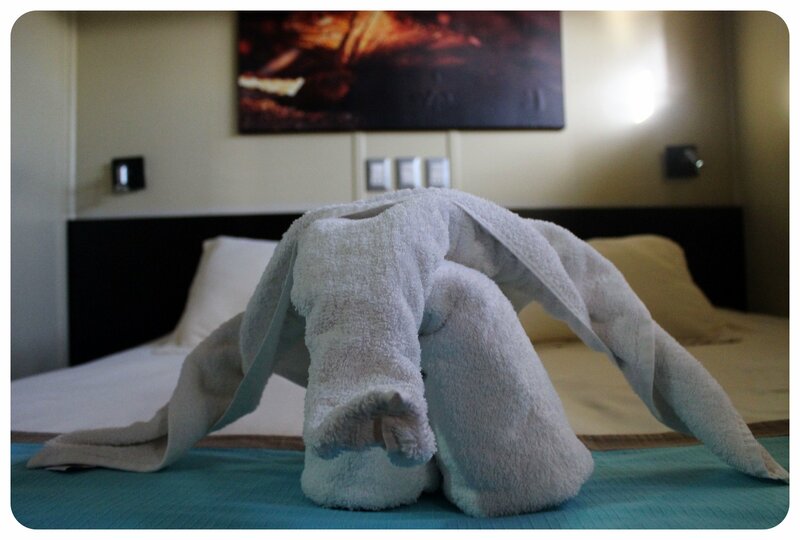 The amount you’re supposed to tip varies, depending on the level of luxury of your cruise, but note that you have to tip both the naturalist guide on board as well as the crew. 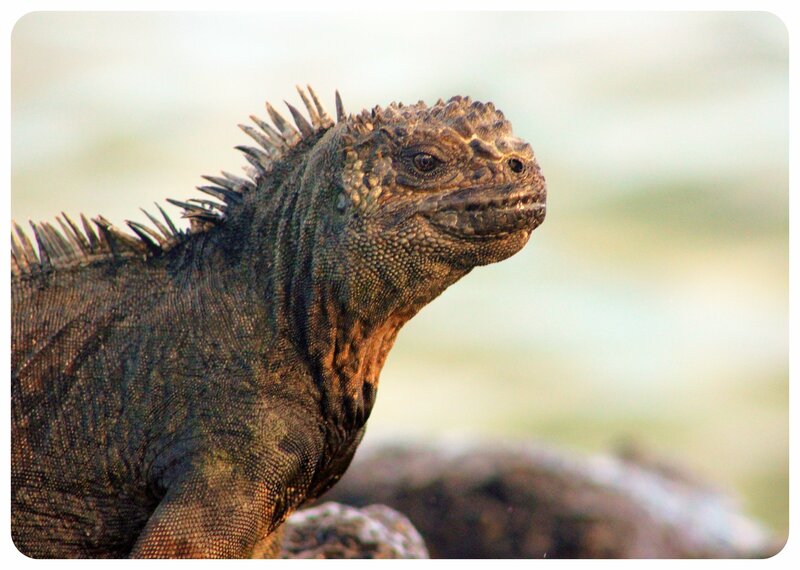 Amounts range from $140 to $250 for a week-long cruise – don’t forget to factor this in when calculating your Galapagos budget. 13 Can you Connect to WiFi? 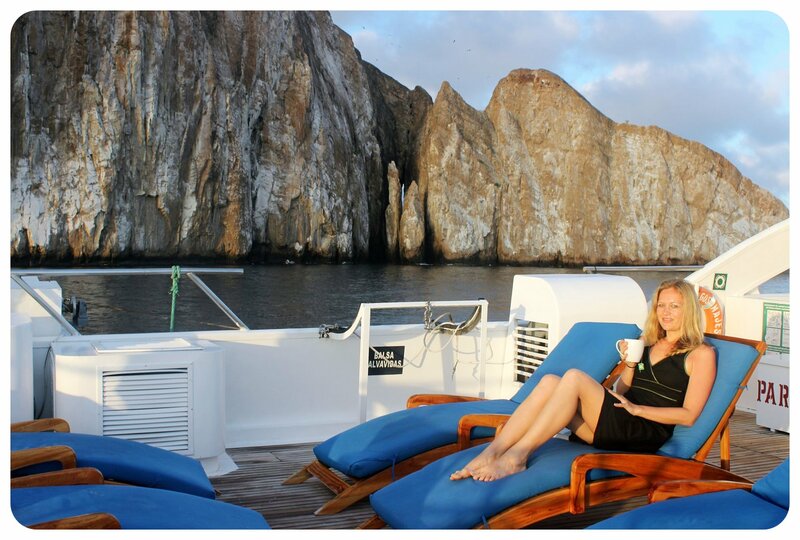 If you book a Galapagos cruise, you most likely will be offline the entire time. Even though I had an Ecuadorian SIM card, I did NOT have reception on the boat about 90% of the time, and my SkyRoam wifi hotspot didn’t work in Ecuador. Since we had a couple of hours on land one day, I was able to quickly check my email in a restaurant on Santa Cruz Island, but the WiFi was painfully slow there. If you decide to base yourself on one of the islands, don’t expect great internet speeds. 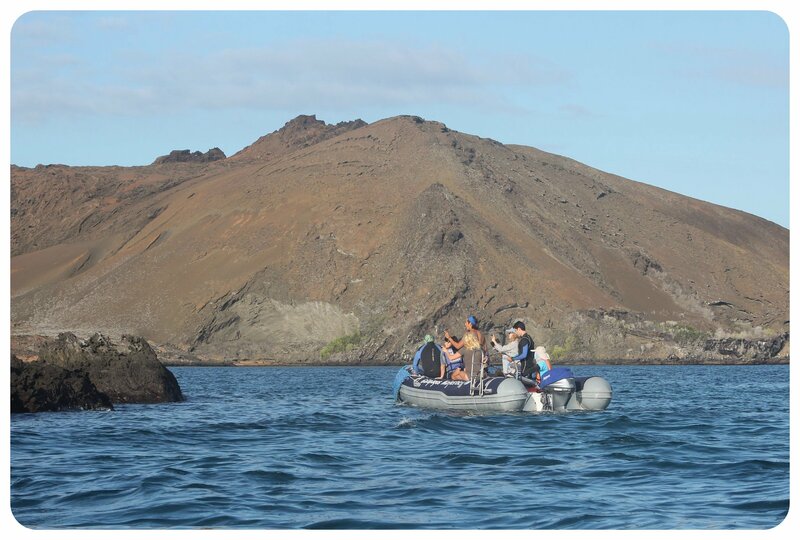 It is a rule of the National Park that you can’t tour the islands on your own – you always have to be accompanied by a licensed Galápagos National Park guide. 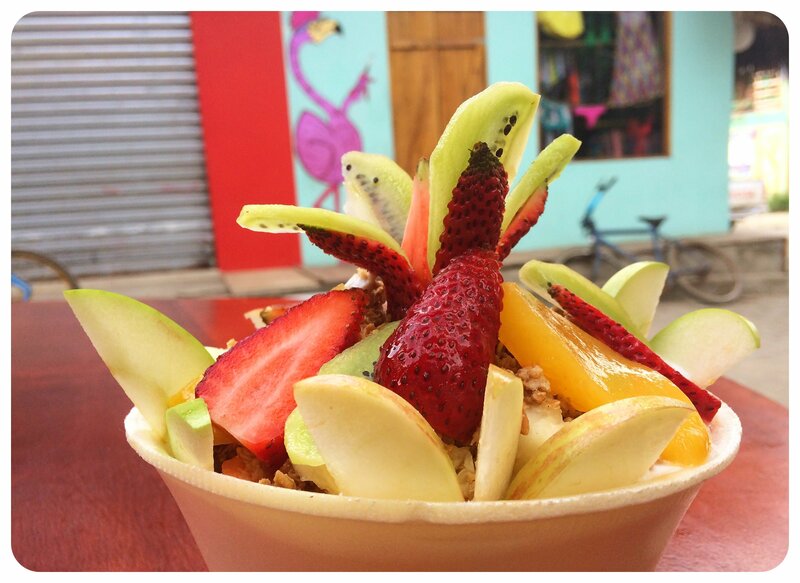 Don’t forget to budget for this when planning day trips on the islands. If you visit the islands on a cruise, the guide is already included in the price of the cruise, but you still need to tip him. The good thing is that you’re only allowed one checked bag and one carry-on bag on flights to the Galápagos Islands, so you can’t really overpack. Sunscreen – If you think you can pick up sun block on the way to the islands, be aware that it is pricey at the airport. My friends paid $30 for a bottle of sun block at the airport in Guayaquil, and it’s about the same price on the islands. Underwater Camera – I watched Nomadic Boys’ underwater footage from their Galapagos trip before I left on my trip and decided I needed to be able to film underwater, too. I felt like I’d miss out not having an underwater camera. 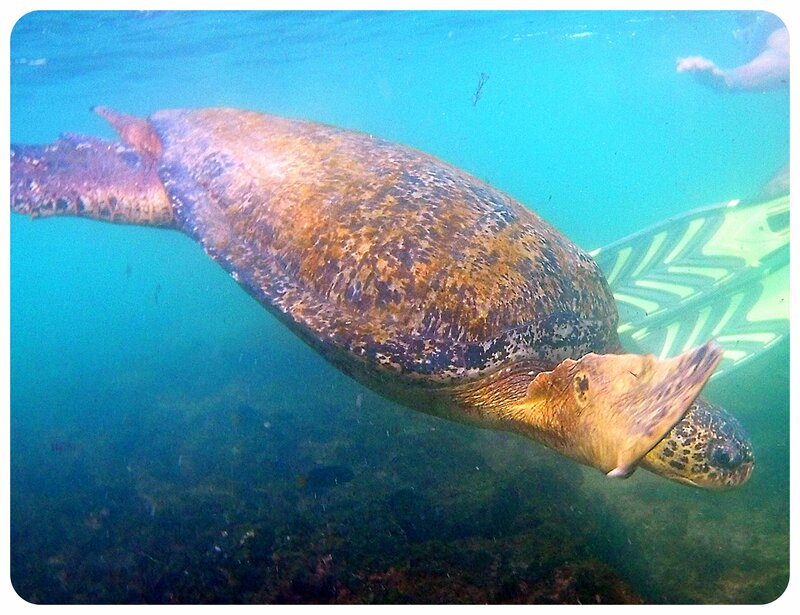 Since I wasn’t sure to what extent I’d use the camera beyond the snorkeling trips on the Galápagos Islands, I didn’t want to invest in a GoPro, and I am glad I didn’t. I think the footage I took with my AKASO turned out okay for first time underwater filming, and I have barely touched the camera since I returned from Latin America. A GoPro is quite an investment, but looking at the The BucketList Family’s footage from our trip, it is definitely worth it, if you are into filming. Swim suit/Swim shirt with UV protection – Wearing a wet suit for the snorkeling trips is optional, and you might end up snorkeling in your swimsuit most of the time, like I did. So make sure to pack comfortable swimwear. If you don’t want to deal with getting in and out of a wetsuit but prefer to snorkel in swim gear, you might want to pack a long-sleeve swim shirt with UV protection to avoid getting sunburnt. Sandals – For me, my flip flops were sufficient, but be aware that the outdoor floors on the boat are often slippery. If you feel more comfortable doing the wet landings (getting in and out of the dinghy in knee-deep water) in shoes, I recommend waterproof sandals or some sturdy Teva’s. (I did them barefoot and it was fine). 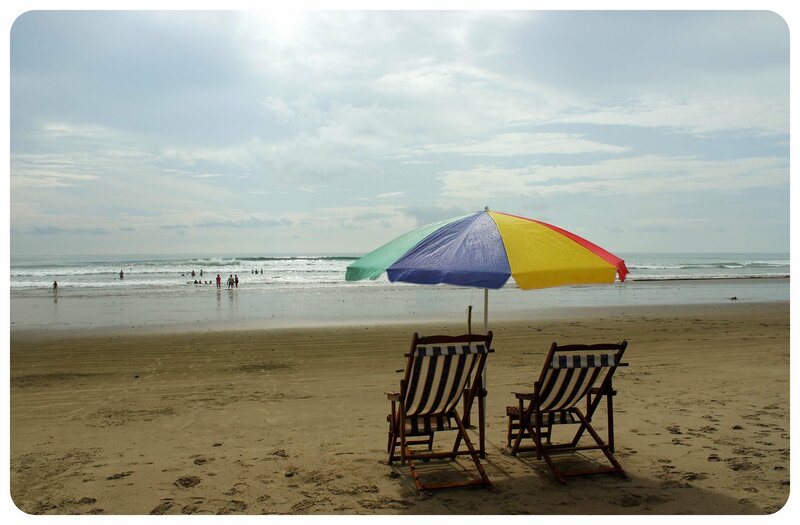 Windbreaker – This is especially important if you visit the islands between June and December, the so-called ‘wet season’, when cool winds occur regularly. I personally love my Columbia windbreaker/rain jacket, and this was the only jacket I brought on the trip, btw. Camera with Zoom Lens – Many of my fellow passengers on the boat told me during the trip that they regretted not having bought an additional zoom lens for the trip – and I was beyond grateful that I had packed my 300mm wildlife zoom lens. 300mm is not a lot, but it made a huge difference in the pictures I was able to get throughout the trip. 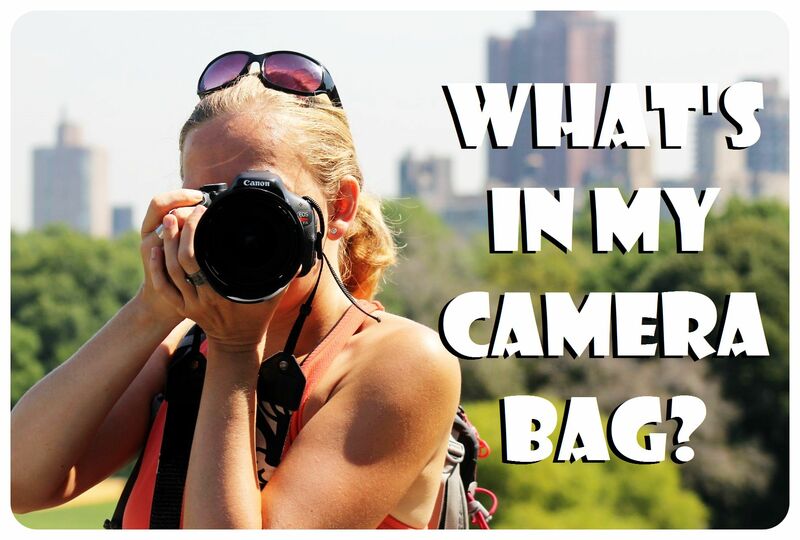 Waterproof Bag – When we took the dinghy to go on land excursions, I always packed my camera and phone in my waterproof bag to keep them dry. I did the same when we went on snorkeling excursions and I brought my (non-waterproof) dSLR camera to snap some pictures above water. With the waterproof bag, I could just leave it on the dinghy while we were snorkeling without having to worry about the camera getting wet. Reusable Water Bottle – The authorities have very strict laws in place to protect the environment on the Galapagos Islands. Bring a reusable water bottle to keep your carbon footprint to a minimum. The boats usually provide drinking water which you can fill in your bottle. Motion Sickness Pills – If you are prone to seasickness, pack some Dramamine or even a Seaband wristband. Better safe than sorry! 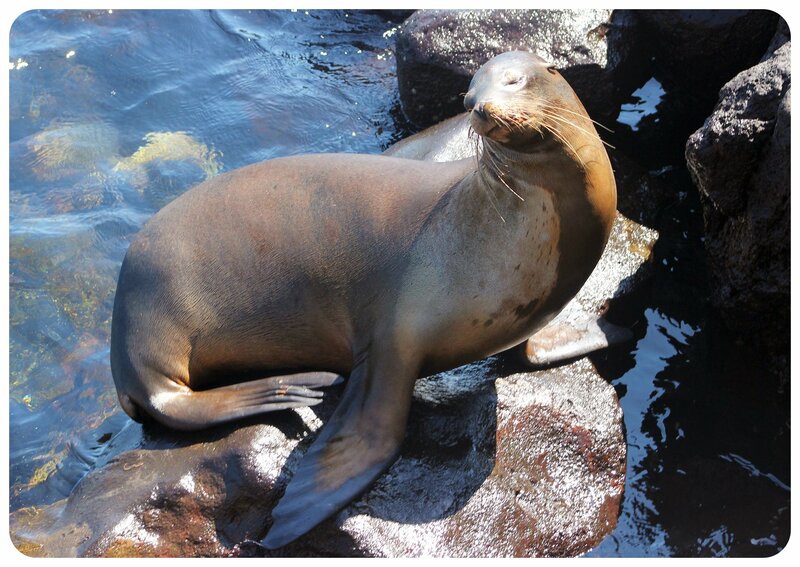 See above for more information on seasickness during a Galapagos Islands cruise. First Aid Kit – If you’re taking a cruise, remember that you’re on a boat with limited access to pharmacies and medical care. I recommend packing pain killers such as Ibuprofen or Tylenol, diarrhea medicine, and Pepto-Bismol, if you have a sensitive tummy. Pack some band aids in case you cut yourself on an underwater rock, an antiseptic, and everything you usually have in your first aid kit. Padlock – If you are on a boat where you share the cabin with a stranger, you might want to bring a padlock to be able to lock your valuables in your suitcase. 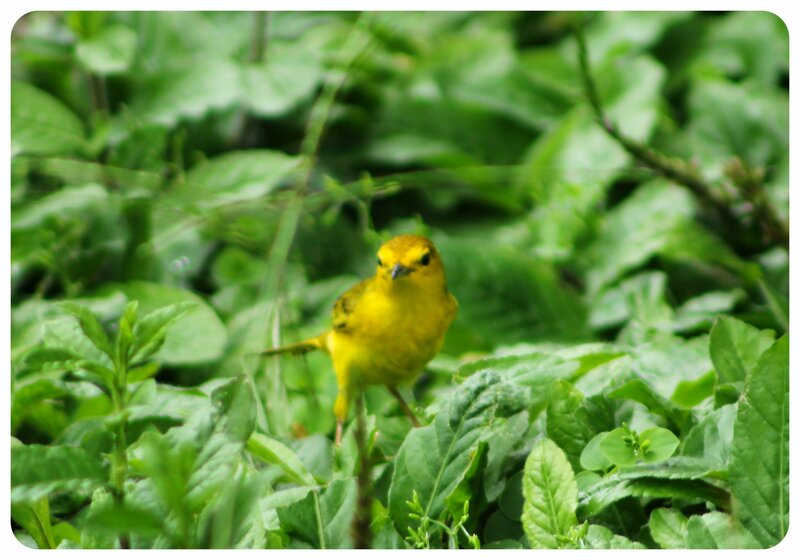 Binoculars – Especially if you’re a bird watcher! 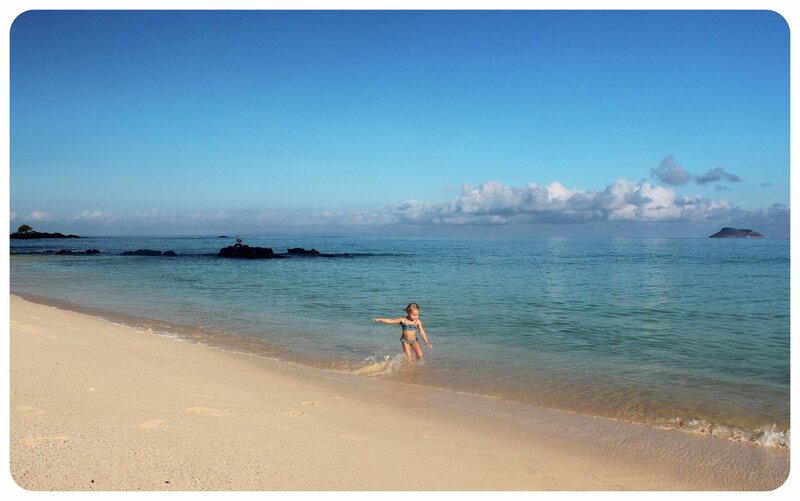 Since you’re far out in the ocean, in the event of a medical emergency it is likely that you will be flown back to the mainland for medical attention. 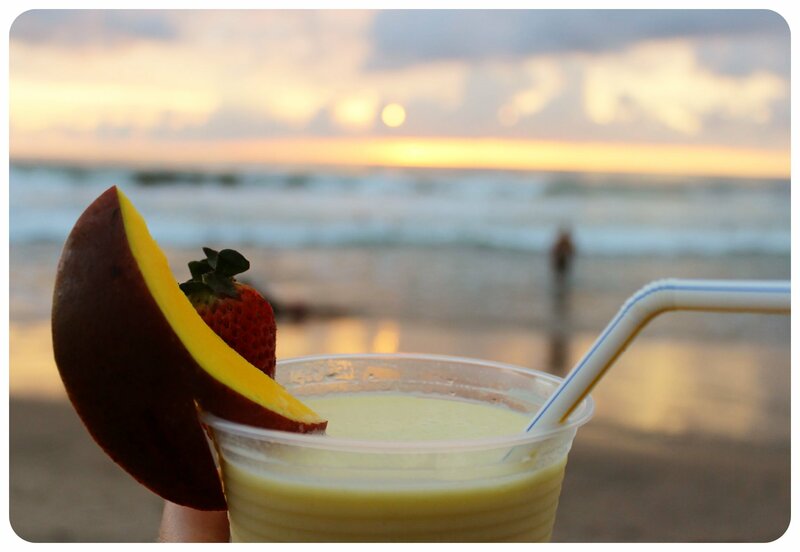 This can get pricey – so make sure to buy travel insurance for the duration of your stay in Ecuador. I opted for World Nomads‘ slightly more expensive Explorer policy instead of the Standard policy, because the Explorer option covers diving and snorkeling. Got any questions that I didn’t answer in this article? Ask away in the comments! 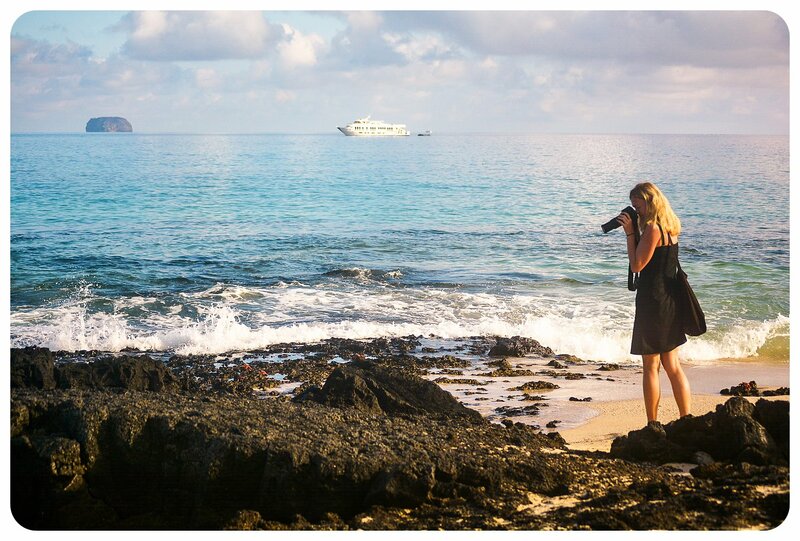 The Galapagos Island have been a dream destination for me for as long as I can remember. I had this image in my head of remote islands with stunning volcanic landscapes and free-roaming tortoises and giant iguanas. I pictured the islands to be mainly uninhabited, and if there were people living on them, they would be outnumbered by wild creatures. I knew the best way to see the islands was to take a cruise, to sail around the islands for a few days, go on land excursions and snorkeling trips while enjoying life on the water in between. 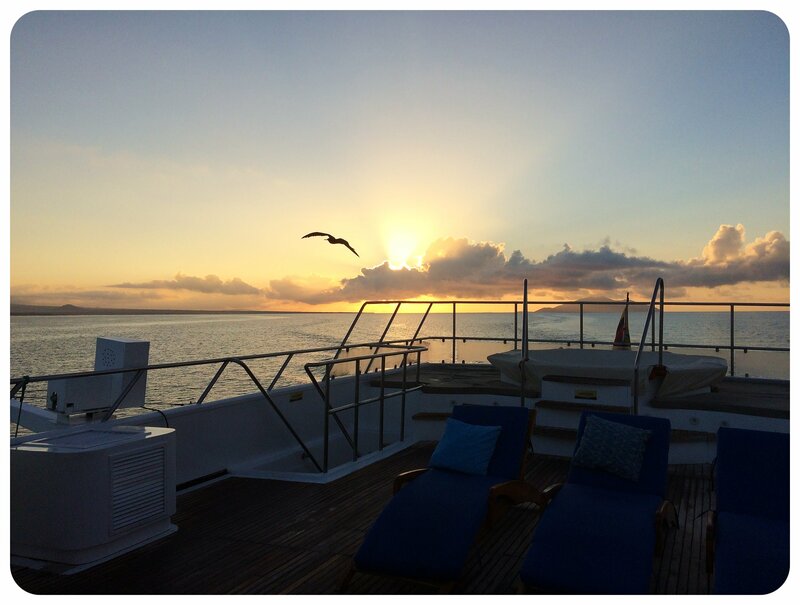 A few weeks ago, I finally boarded a plane to the Galapagos Islands and I was curious to see how the reality of a Galapagos cruise would compare to the picture I had in my head. 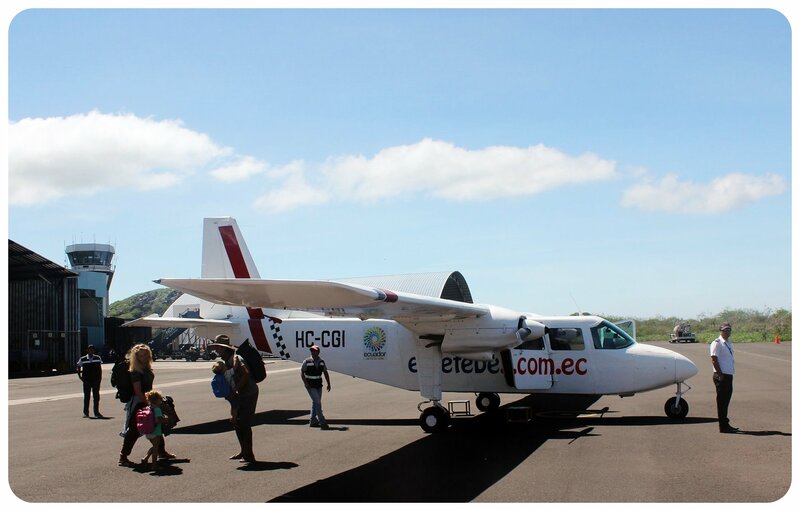 After a two-hour flight from Guayaquil, we arrived on the island of Baltra, a small island that, other than being home to one of two airports in the Galapagos, is uninhabited. Flying in, we could see barren reddish ground below us. Baltra is the world’s first “green” airport, which means it is running on renewable energy sources, such as solar energy, wind farms, and seawater desalination. Before we were allowed to leave the airport, we had to pay the $100 National Park fee, and our carry-ons were searched. I quickly learned that it’s not allowed to bring apples onto the islands – or any agriculture goods, for that matter. Later I learned that it is strictly prohibited to bring any food on land with us when we set foot on the islands for land excursions. 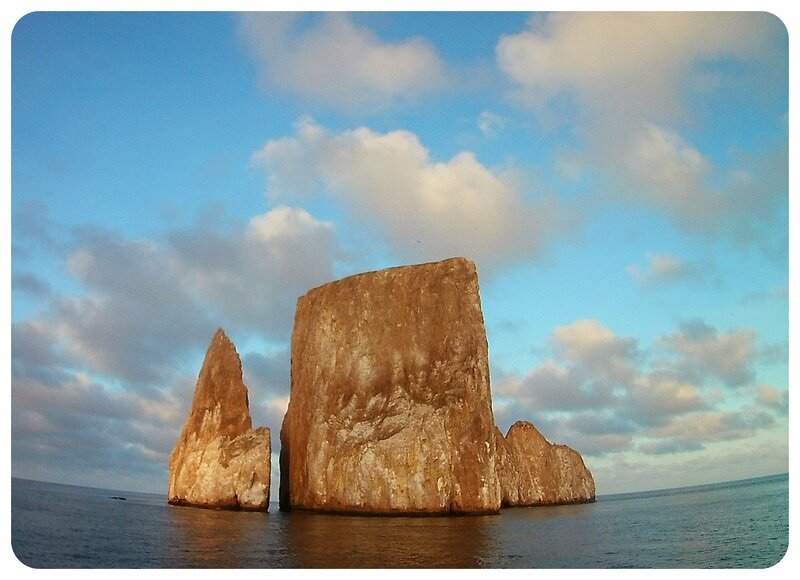 By now, we were on the Galapagos for 45 minutes – and was already completely smitten by the islands. When we arrived in Santa Cruz, we hopped on a bus which took us on our first land excursion, before we even boarded our yacht. 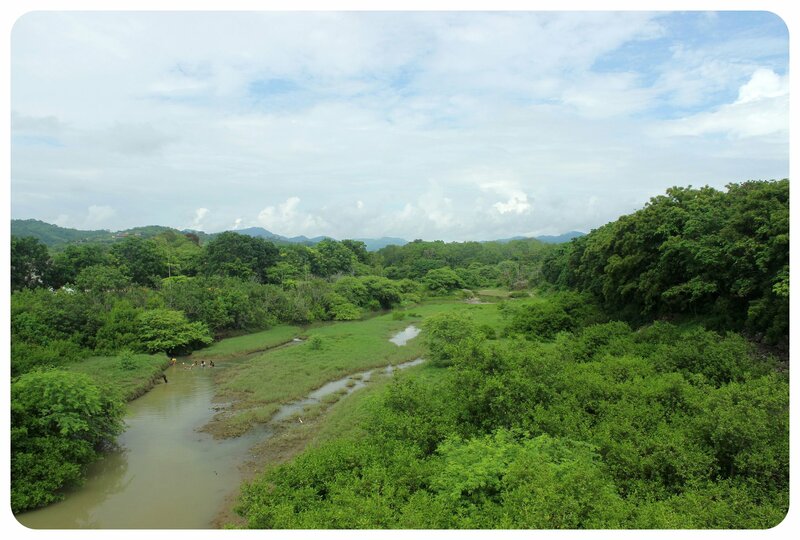 We drove towards the center of the island, and as we got further away from the shore, the grey, dry bushes and branches that cover the rocky ground were replaced by a lush green forest. 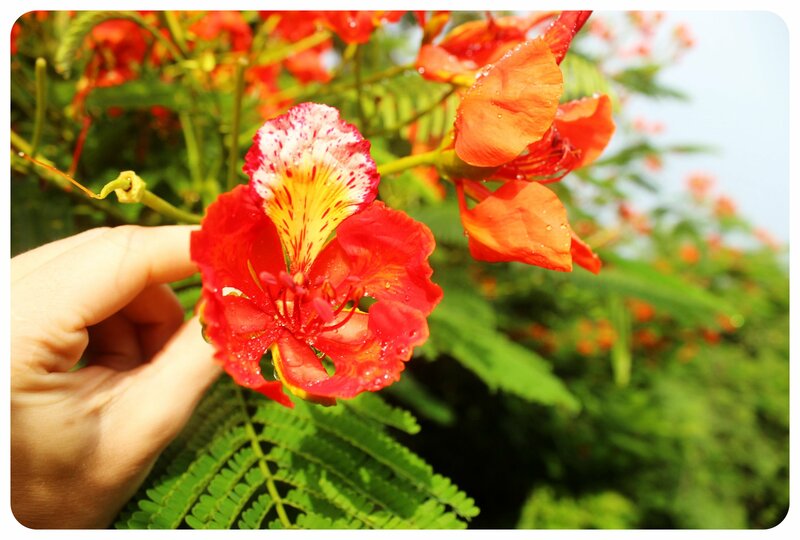 A rainstorm had just passed through the island and the smell of fresh rain mixed with the smell of the flowers and plants was mesmerizing. 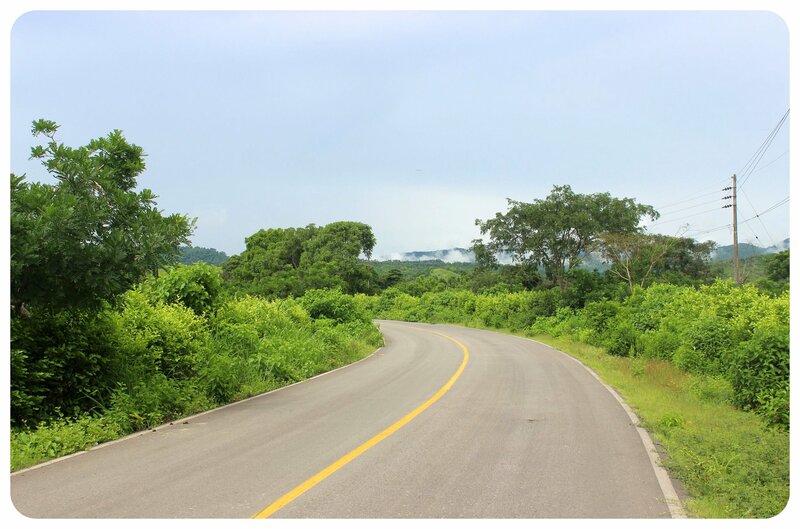 Other than the road that cuts through the green in a straight line, there was no sign of human existence anywhere. At some point, we passed through a village. Nothing more than a few little houses, each and every one flanked by banana trees; a donkey standing on the side of the road. Our destination? Giant tortoises! 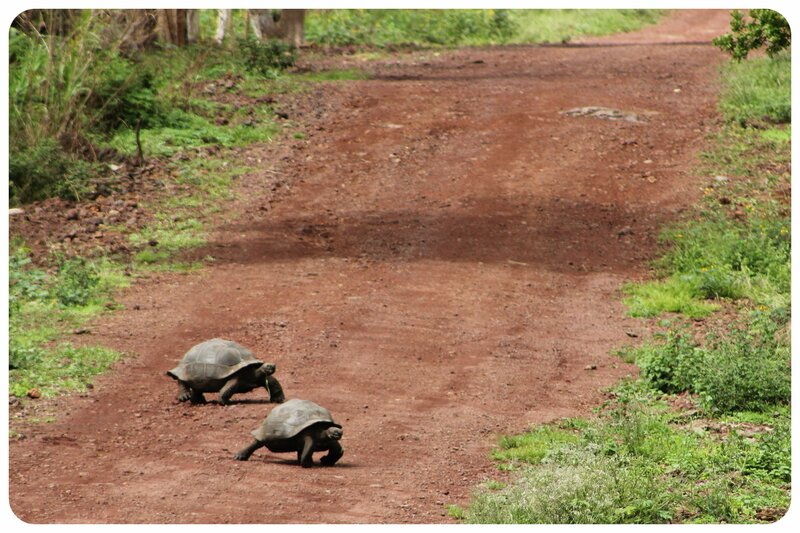 We were on our way to see tortoises in the wild, and when we turned off the main road onto a dirt road, my excitement grew. 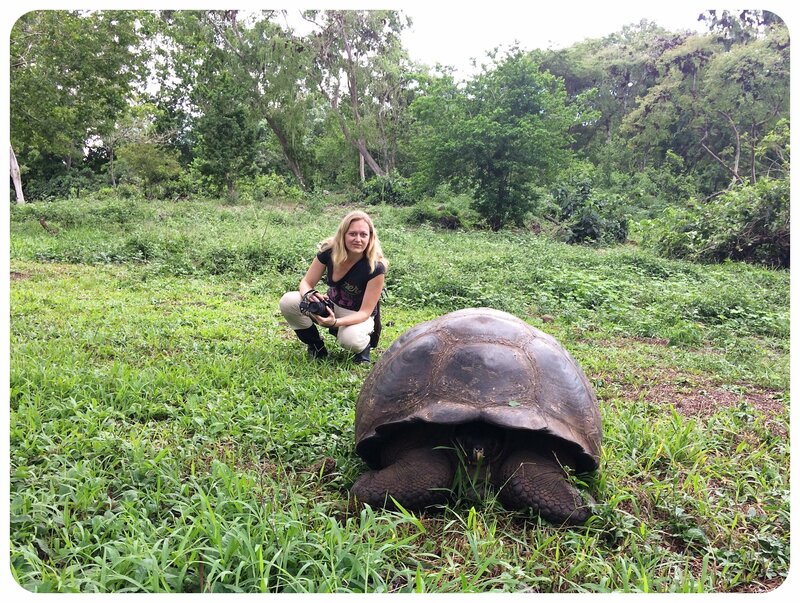 I knew that seeing Giant Tortoises would be a highlight of my trip. It didn’t take long until we started seeing giant tortoises in the grass next to us, and several times our bus had to drive around tortoises on the road. Could this place even be real?! While initially we all let out excited aaahs and ooohs every time we saw one of the distinctive big, unmistakable shells, the tortoise spottings became more and more regular until there were dozens of tortoises everywhere around us. 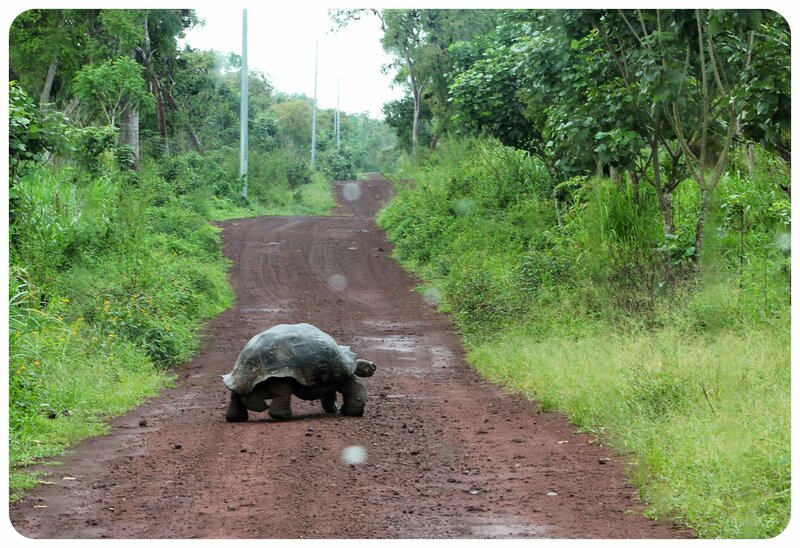 When we finally reached the end of the road, it felt like we were in tortoise paradise. We were surrounded by tortoises of all sizes who were sitting in the high grass, happily munching away on leaves and straw. They couldn’t care less about us, a group of camera-toting tourists, literally fresh off the boat. Before we went on a walk around the area, we had lunch at a small restaurant, Rancho Manzanillo, on an open terrace overlooking tortoise territory. As a vegetarian, I am always a bit worried about the available food options, but here, I had nothing to worry about: my vegetarian rice dish was scrumptious. Bellies full, we all put on wellies and headed down to a pond where the tortoises like to gather. 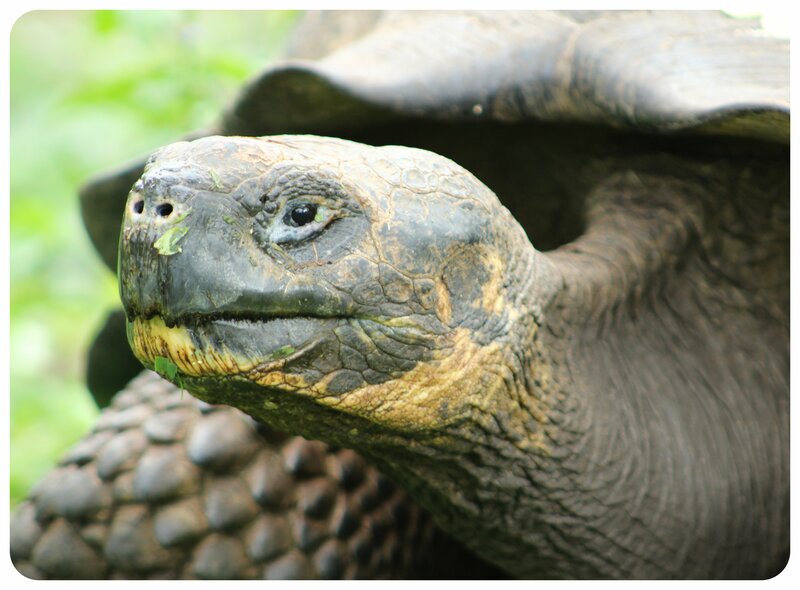 Our naturalist guide – obligatory on every Galapagos cruise – told us that giant tortoises are the longest-lived of all vertebrate species, easily reaching over 100 years. 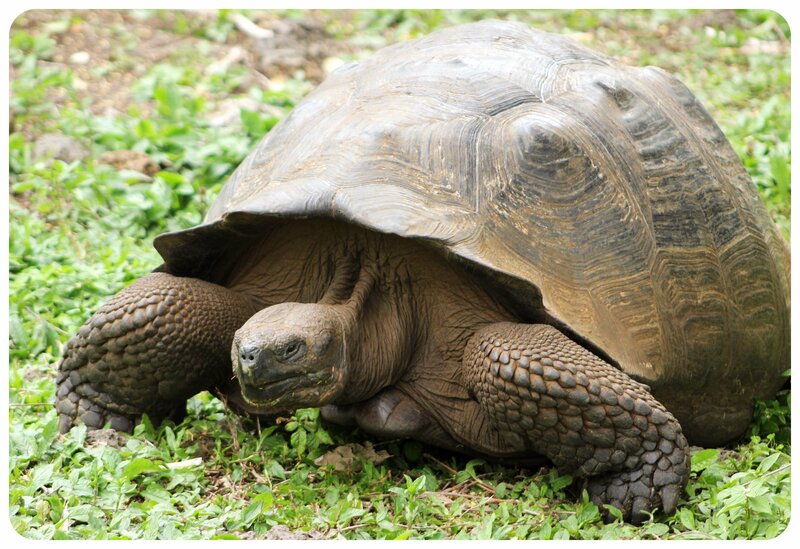 The oldest on record lived to be 152 years, but it’s not impossible that there’s a tortoise somewhere on the islands that was already alive when Charles Darwin stopped in the Galapagos in 1835. 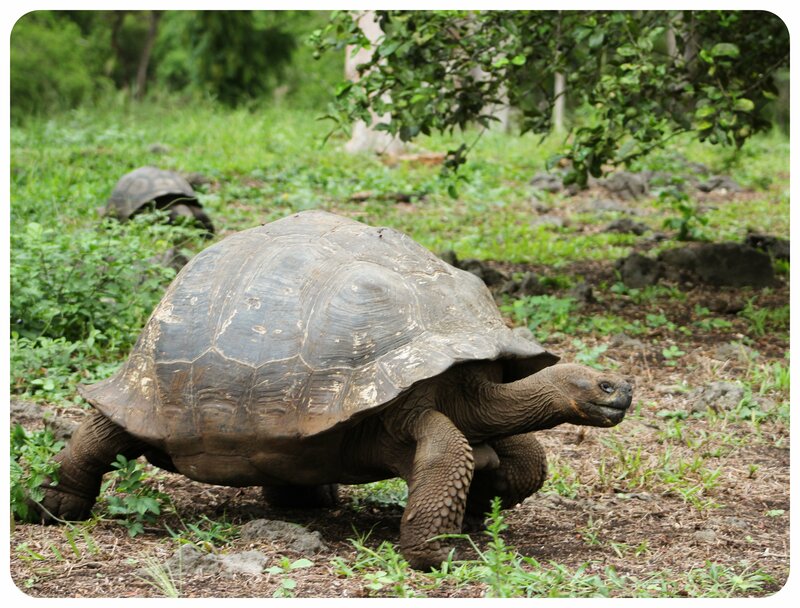 When Darwin arrived, there were 15 different kinds of tortoises on the islands, now the number is down to 11. Hundreds of thousands of tortoises were killed when whalers and pirates stopped at the islands in the 17th and 18th centuries. 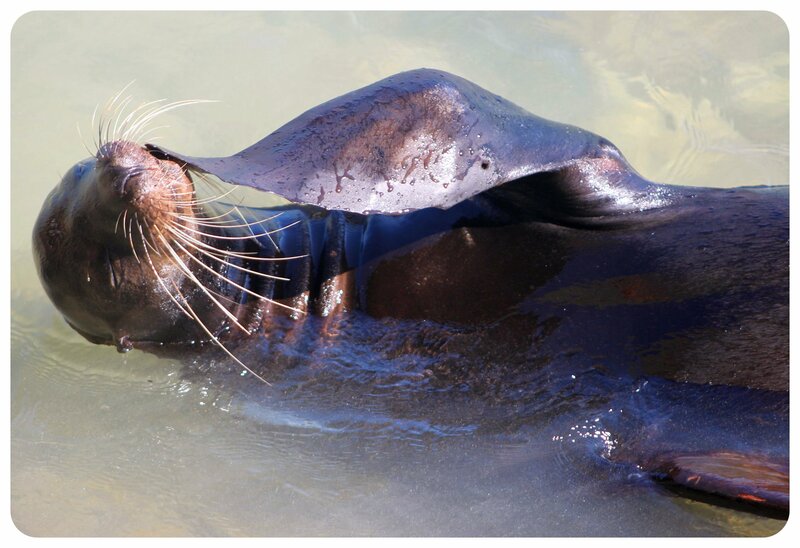 They are not on the brink of extinction anymore – but still an endangered species, there are only 15,000 of them left in the Galapagos, which is a tiny number. 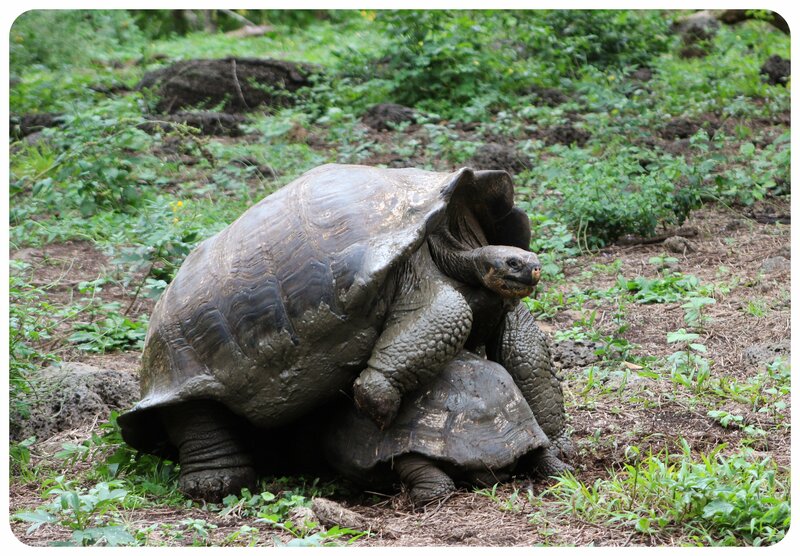 We learned that there are only two places in the world where giant tortoises live: in the Galápagos Islands and in the Aldabra Atoll in the Seychelles in the Indian Ocean. And the word ‘giant’ is the perfect word to describe these massive creatures, which often exceed five feet (1.5 meters) in length and reach up to 550 pounds (250 kilograms) in weight. 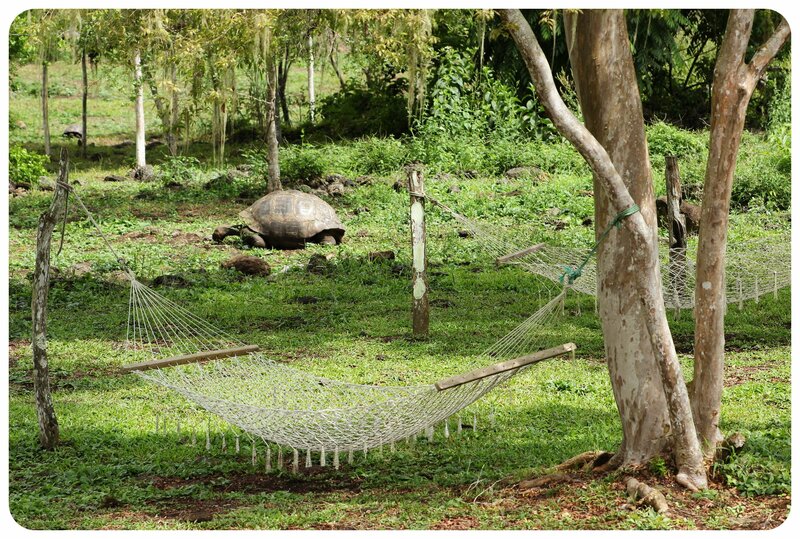 We spent a couple of hours with tortoises, which let us watch them eat, chill and even mate, and the two hammocks in between a couple of trees provided a perfect place for that. 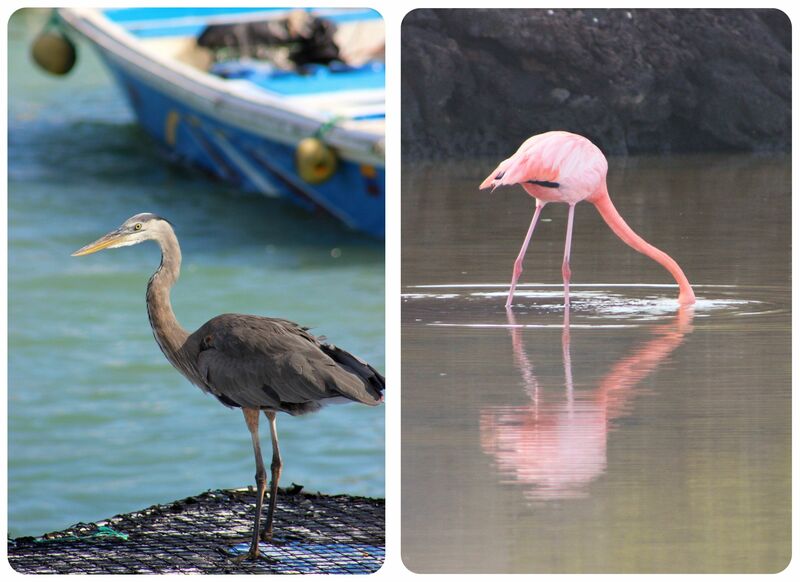 After saying goodbye to these gentle giants, we made our way to the port of Santa Cruz, Puerto Ayora. 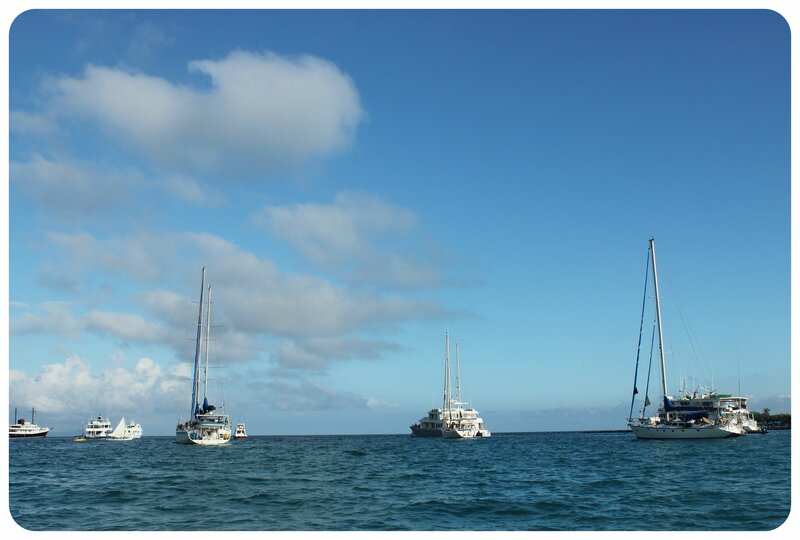 This town is the most populated urban center (population 12,000) in the Galapagos Islands and this is where the yacht that would take us around the islands over the next few days was waiting for us. 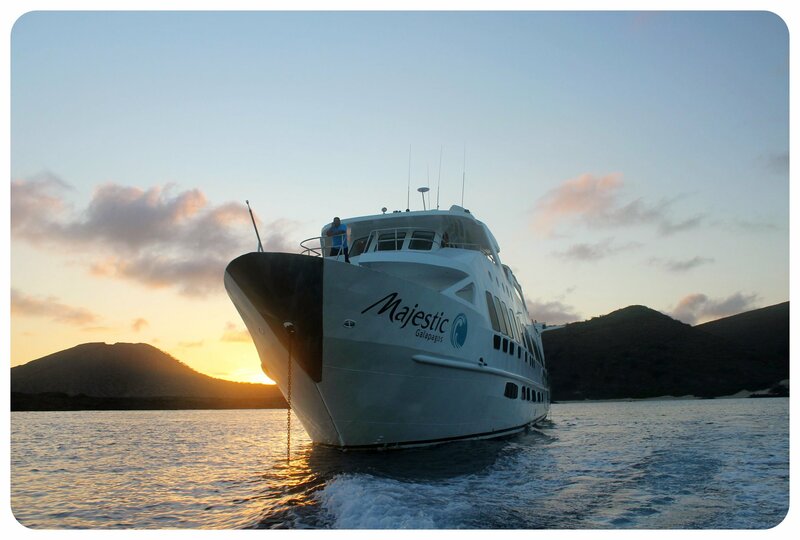 The 16-person aptly named Majestic was amazing: eight cabins for two people each, a gorgeous sun deck with Jacuzzi and sun chairs, and a beautiful dining and lounge area. We got a quick introduction to our floating home over a welcome cocktail before we changed for dinner. My cabin wasn’t big, but it didn’t feel crowded. And most importantly: it had a big, comfortable bed. The nights are the time when the boat is moving from one place to the next, so you want to have it comfy. After our first Galápagos sunset and a delicious buffet dinner, we stayed up and chatted for a while, but most people retreated to their cabins around 9pm. It was a long day and we would have an early start the next morning. At 6am, I woke up after a mostly well-slept night. 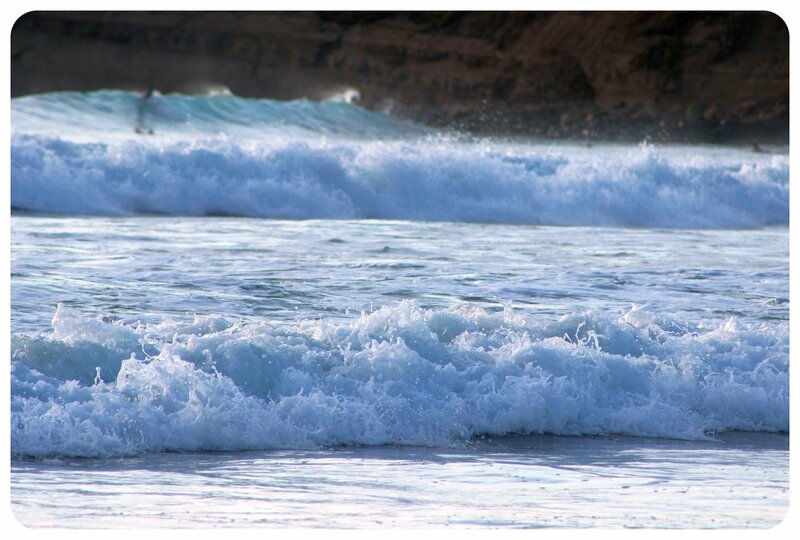 I woke up once around 2am, which was when the boat started moving, which made me feel a little seasick. Luckily that feeling passed and I was able to sleep for a few more hours. After waking up, I headed upstairs to the deck for a quick morning workout, and because I wanted to see where we were anchored. I got up to the deck just in time to see the sunrise. I saw an island to my right and an island to my left, Santiago and Isabela. A bunch of birds were flying right over my head, and they kept flying with the boat the entire morning. 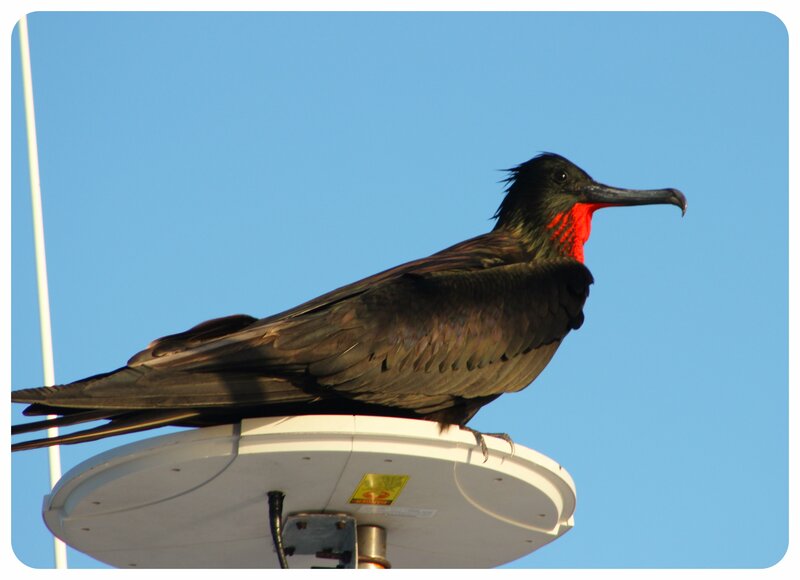 A frigate bird watched me from the navigation mast as I did some sit-ups. I could hardly believe how serene it felt. The Islands seemed uninhabited, there were no other boats. It felt like our boat was the only one cruising around the archipelago, but I knew that there other boats out there, somewhere. After a generous breakfast buffet of pancakes, eggs, breads, cheese, ham, yogurt, porridge, muesli and fresh fruit, it was time for our first wet landing. This means, taking the dinghy to an island near us and getting wet up to the knees while disembarking the dinghy. Our first stop of the day was Santiago, which was inhabited by a small colony of fisherman until the 1950s, but has been uninhabited since the last of them left to join a bigger settlement on one of the other islands. 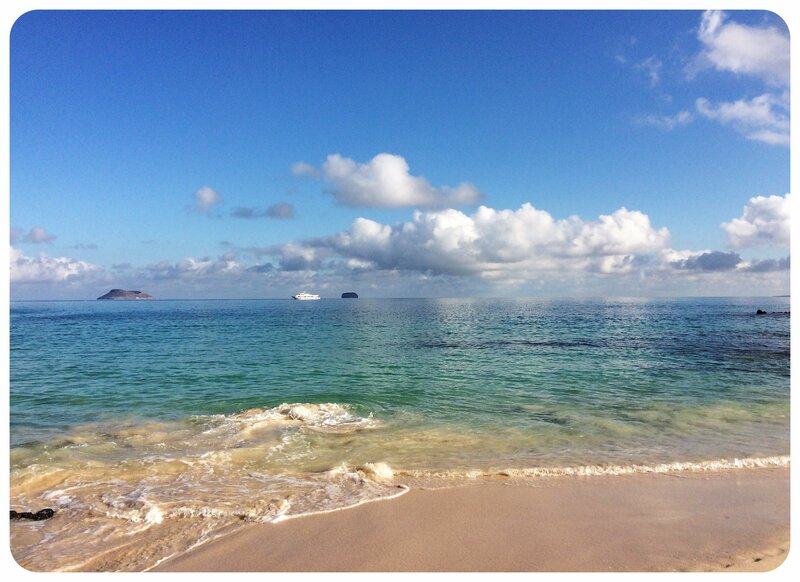 When we jumped out of the dingy and waded through the shallow water onto the beach, I thought to myself, this is how Fray Tomás de Berlanga, the Bishop of Panamá, must have felt like when he was blown off course during a voyage to Peru and landed in the Galapagos Islands instead. 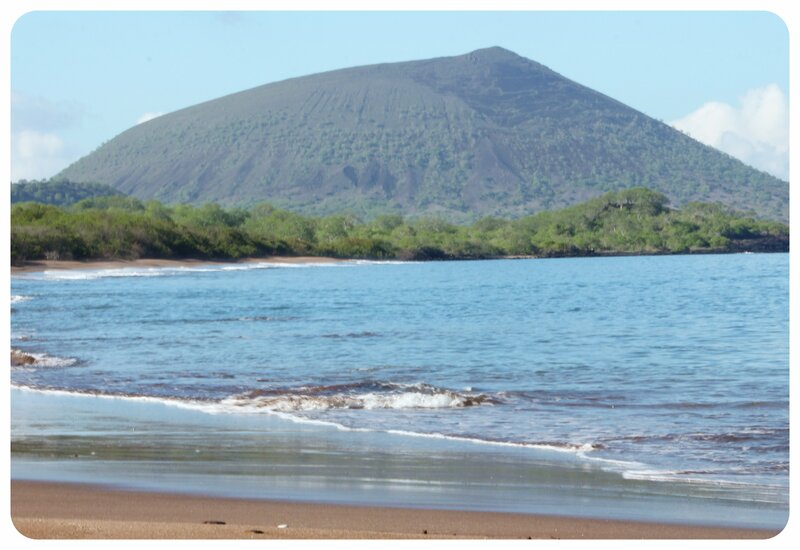 A deserted beach, lush green vegetation, a volcano looming in the background. The island hasn’t changed much since then. 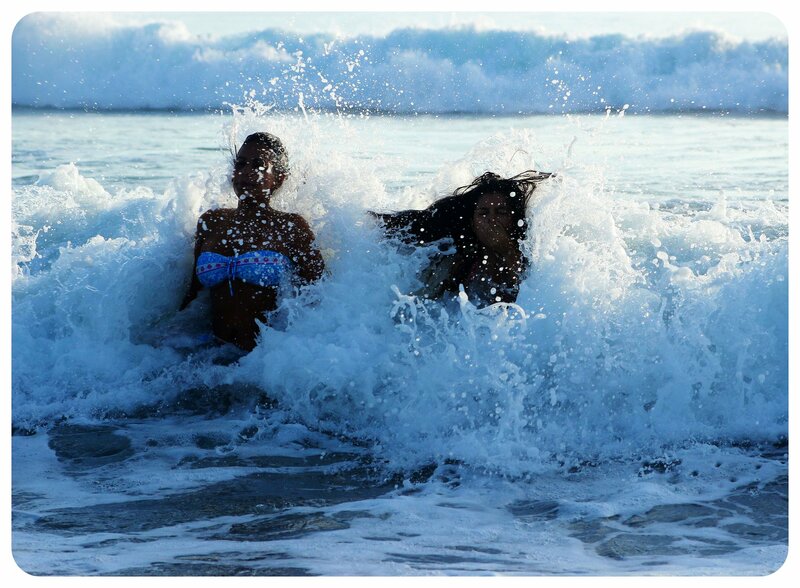 The beach we landed on is called Espumilla Beach because of the foam (espuma in Spanish) that is created as the waves crash against the shore. As we walked down the beach, our feet sinking into the soft golden sand, we saw several turtle nests, and several turtles in the ocean, their heads peeking out of the water every now and again. Being able to visit such a remote place made me appreciate the fact that I was cruising around the Galápagos Islands rather than trying to explore them from an ‘island base’ – because it’s secluded beaches like this one that you just can’t get to unless you are on a cruise. We watched the ghost crabs quickly moving into their sand holes every time we got too close, pelicans and blue footed boobies dive bombing for food with a sudden plunge – head first – into the ocean, and an American Oysterhunter enjoying the solitude. 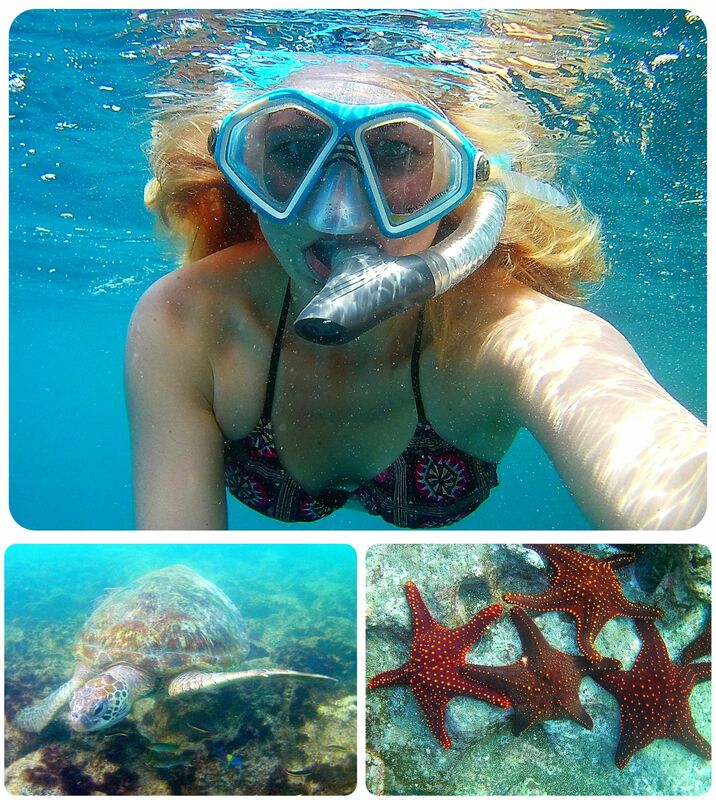 Our second stop for the day: snorkeling! 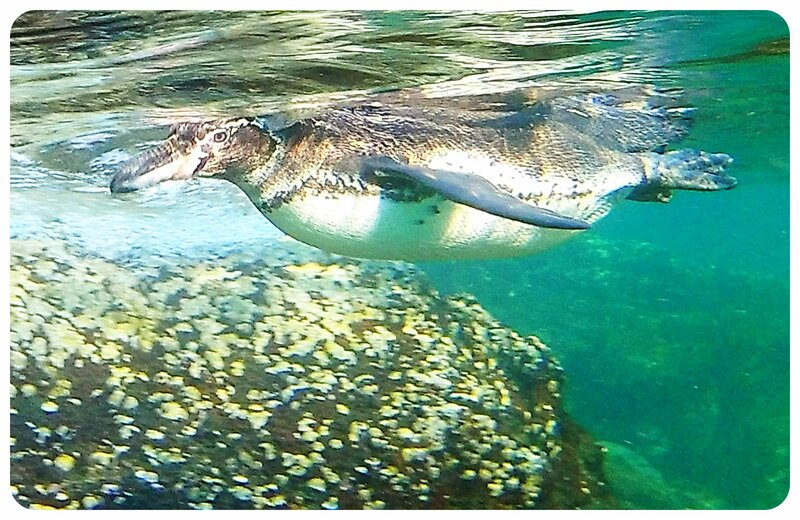 Our first exploration of the underwater world of the Galapagos took place just off the coast of Santiago. As soon as we jumped into the ocean we noticed how clear the water was, and we were surrounded by colorful fish immediately. 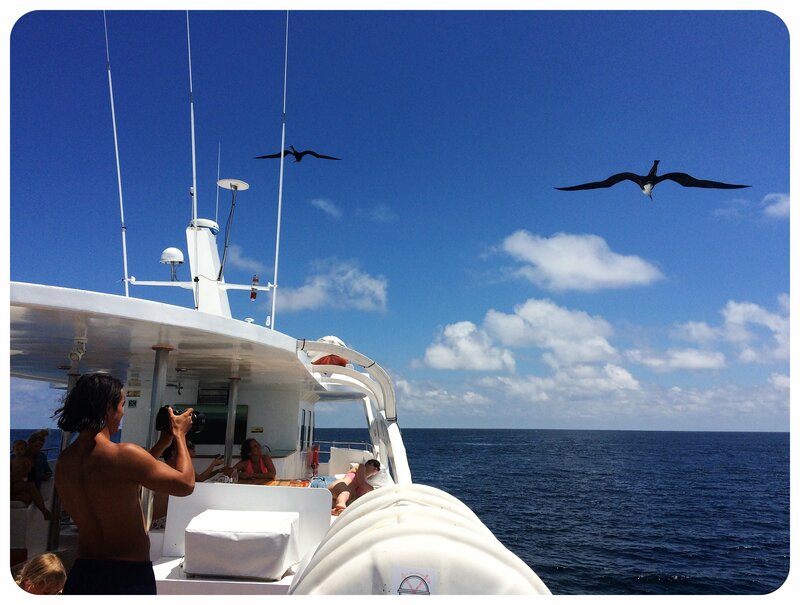 On this first snorkeling trip we saw a small shark, a sea turtle and a spotted eagle ray. Not bad for a morning of snorkeling! Next on our agenda was kayaking. We got to see the same coastal area we just explored underwater, except that we are now above water. We kayaked along the rocky cliff side of the island, watched some seals lazing in the sun and some blue footed boobies sunbathing on the rocks. Whenever I turned around, I saw nothing but the open sea. It truly felt like we were the only ones out there. So far, I still had not seen a single other boat. We got back to the boat and had lunch, and right after we polished off our plates the boat started its engines to bring us to our next stop. 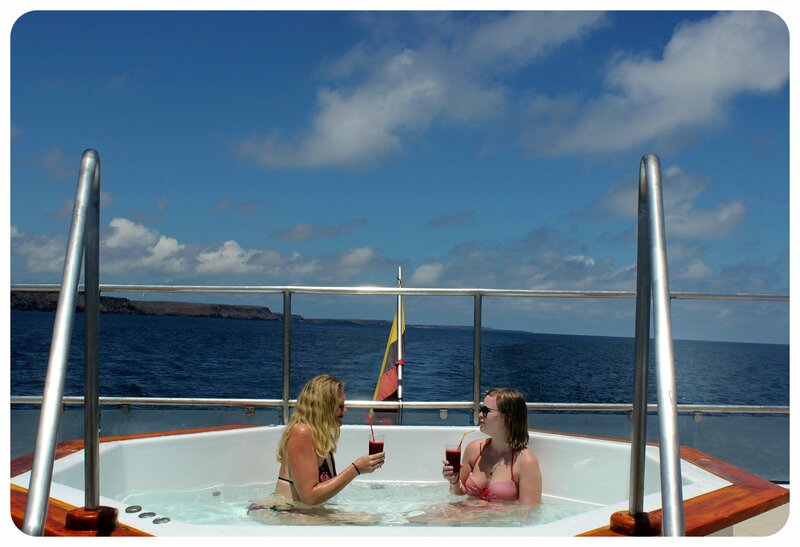 While we were cruising, we had time to make use of the sun deck and the jacuzzi. 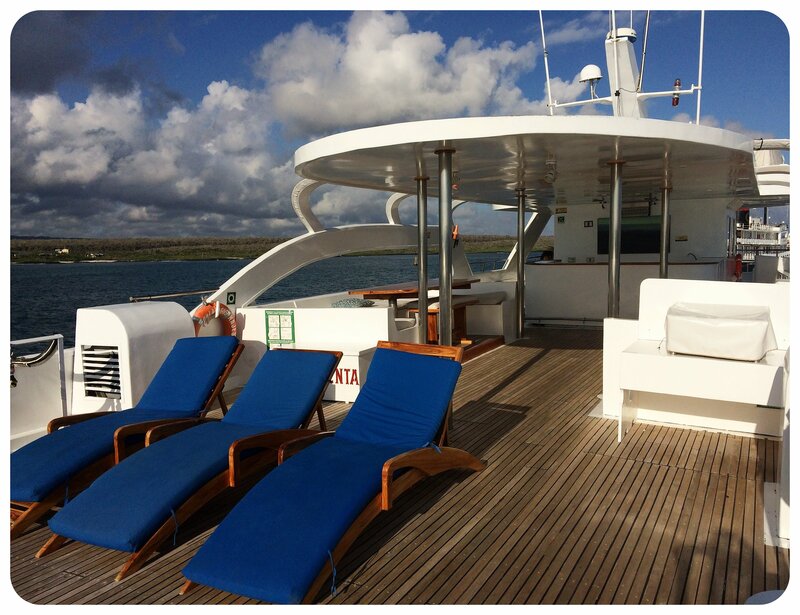 The luxury yacht is just as much a part of this experience as the landscapes we passed and the wildlife we saw. A couple of hours later, our stop for the afternoon came into sight: nothing more than a barren rock in the ocean, surrounded by smaller rocks, all bleak, without any sign of life on them. 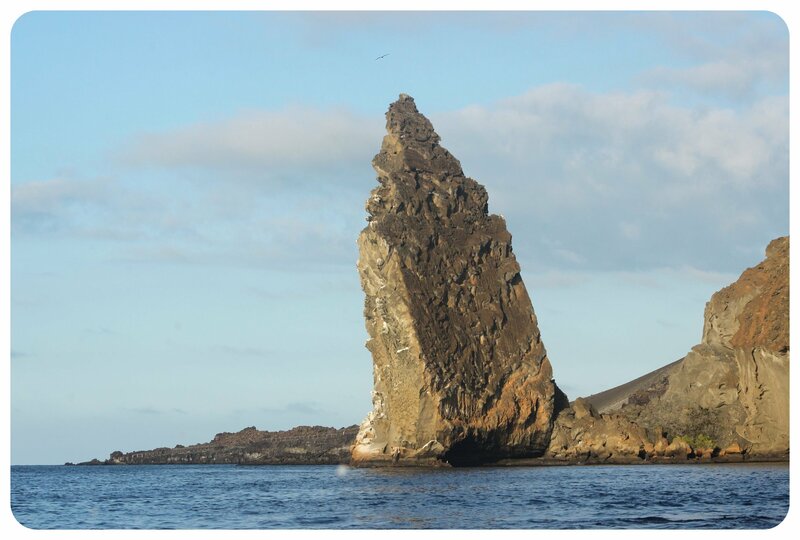 There were, however, four or five other boats anchored here, and we soon learned why: Bartolome Island is home to some spectacular lava formations, the most remarkable one being Pinnacle Rock, a rock formation that rises high into the sky. 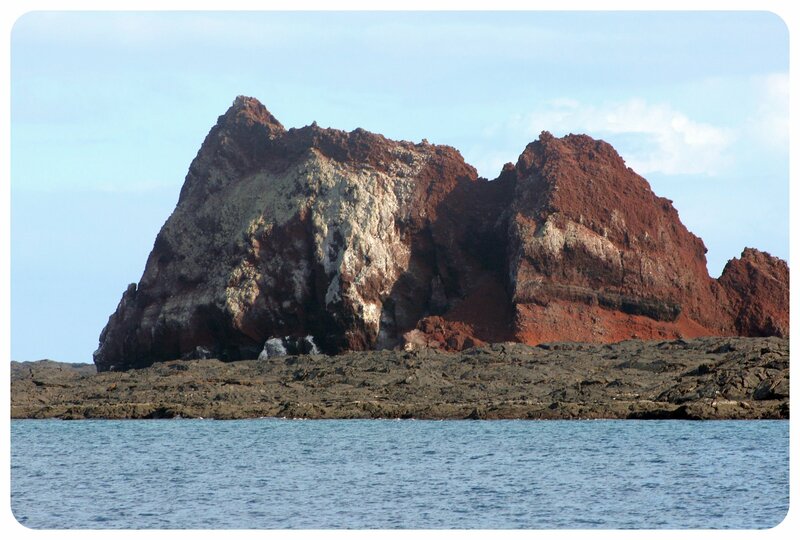 The tiny island is said to have some of the most beautiful landscapes of all of the Galapagos Islands, including a tuff cone of an extinct volcano that can be climbed that offers stunning views over Bartolome and the other islands, and a variety of red, orange, green, and black volcanic formations. Sadly, we had frolicked in the water for too long during our morning excursion that we ran out of time to climb the volcano before sunset, but there was still time for another snorkeling session. 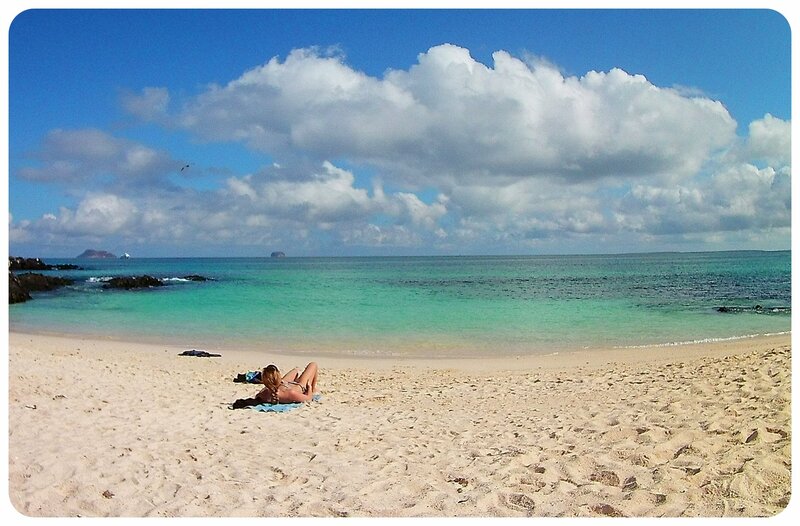 What the island lacks in plant and animal life is more than compensated by the surrounding sea. 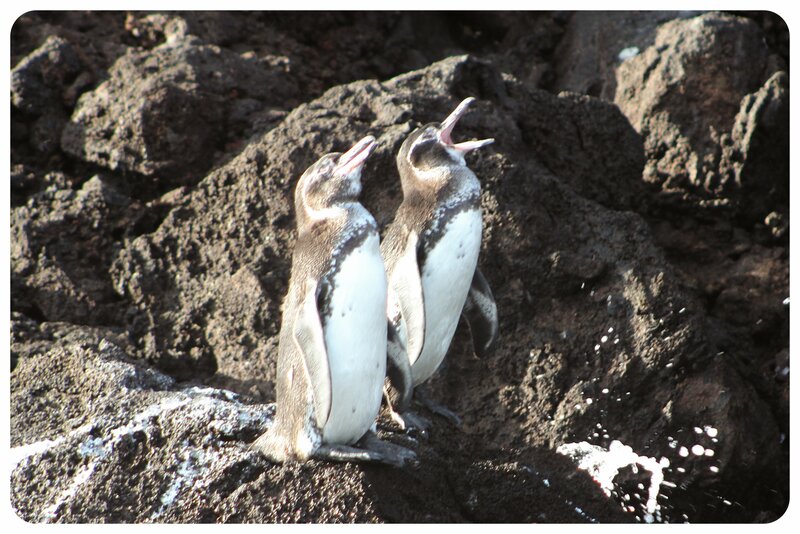 This is a popular spot for Galapagos penguins, and sure enough two playful penguins joined us on our swim for a while. Watching them whiz around us and chase each other was highly entertaining. 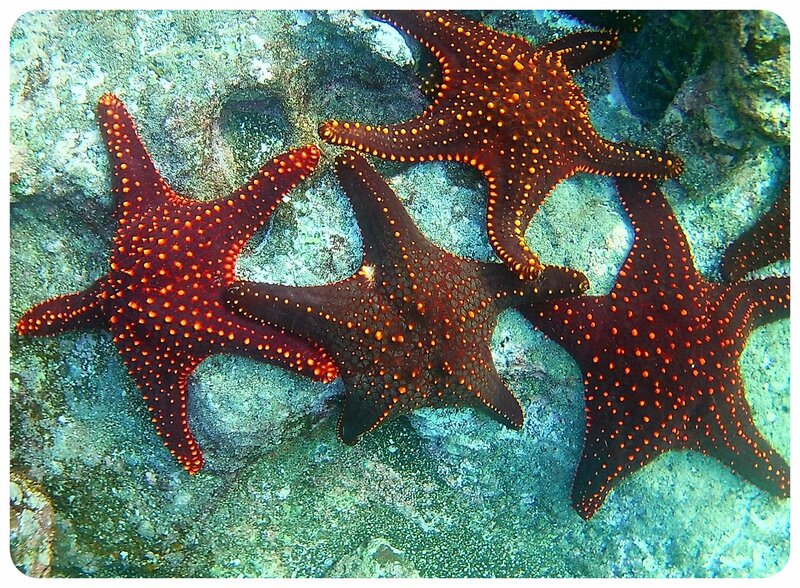 After they left, we swam slowly along the rocks on the shore and spotted several sharks, spotted eagle rays, star fish and a myriad of colorful fish. 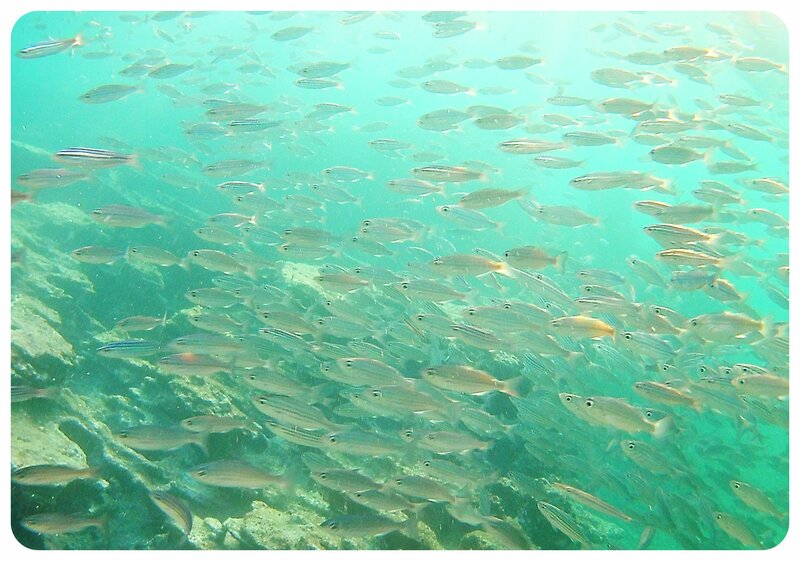 We all agreed that this snorkeling session was better than in the morning – and that one had already been amazing! Back on the boat, we had just enough time to change into some dry clothes before we set off on a short sunset ride in the dinghies to see the penguins again, this time on shore, and take pictures of the lava rock formations. After our sunset excursion, we had our nightly briefing for the next day and were told that we’d have breakfast at 6am. Another early start, and since we had such an action-packed day, everyone retreated to their cabins as soon as we finished another scrumptious dinner. 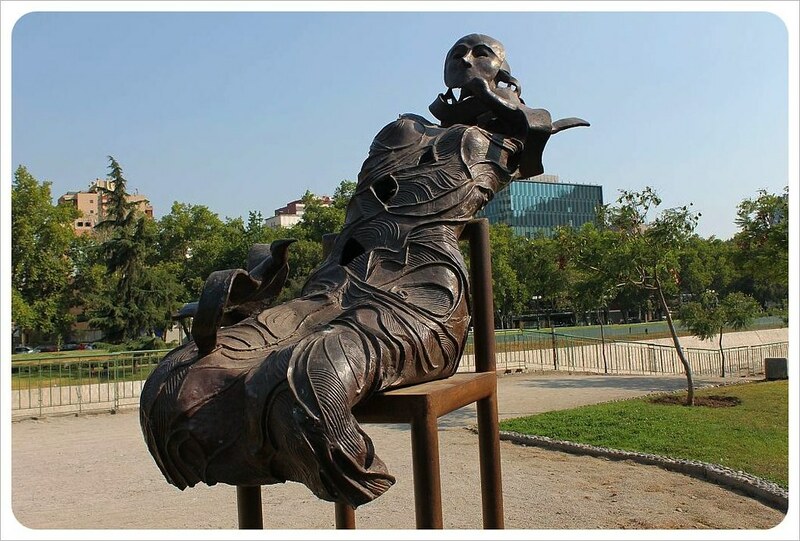 When my alarm went off at 5.30am the next morning, I was everything but ready to get up. My skin burned from too much sun and too little sunscreen the previous day. We fueled ourselves with a filling breakfast and at 6.30am we were already on our way to our first stop of the day: Las Bachas Beach on Santa Cruz Island. 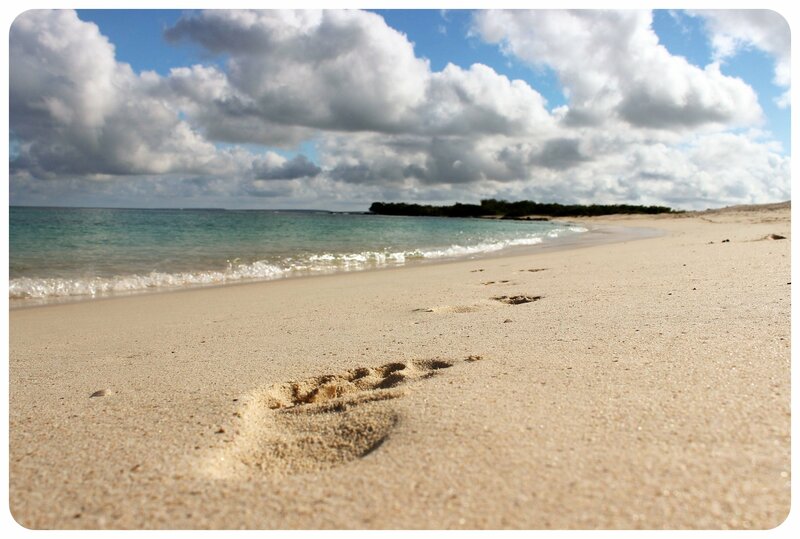 Again, we arrived on a completely deserted beach, the only sign of life were the fresh traces of sea turtles who came onto the shore to make their nests in the sand. Looking at the traces, our guide commented that we must have just missed them, that’s how fresh the tracks were. 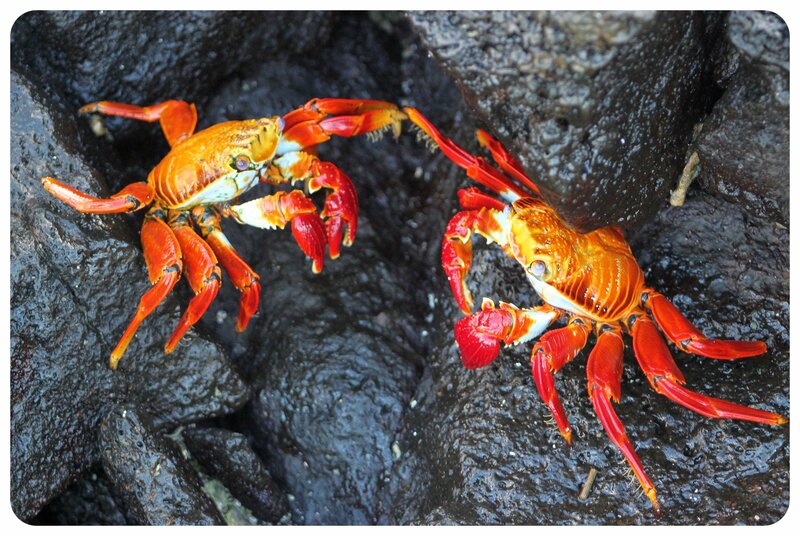 The only ones who joined us on our morning beach walk were the hundreds of Sally Lightfoot Crabs that move quickly on the rocks along the shore, already visible from far away, thanks to their bright orange/red bodies. 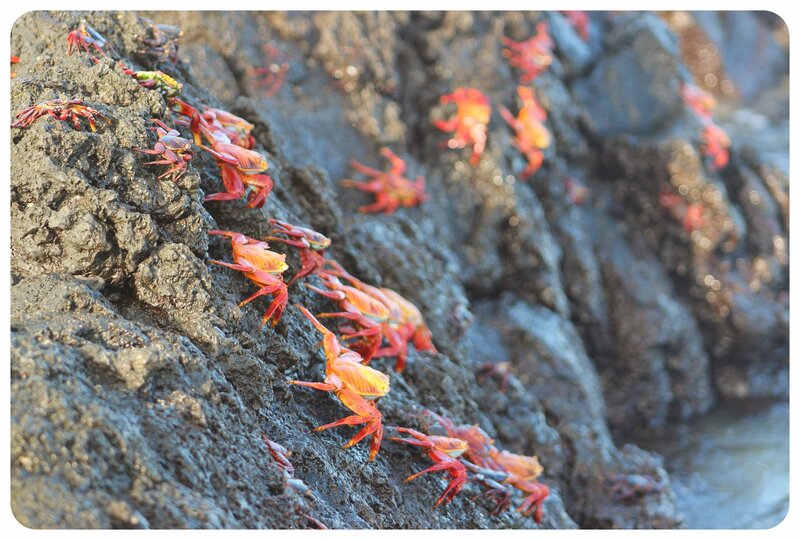 These agile little crabs were supposedly named after a Caribbean dancer, and the way they can climb up rocks on vertical slopes and run in four directions, I can see why someone said they resembled a dancer. 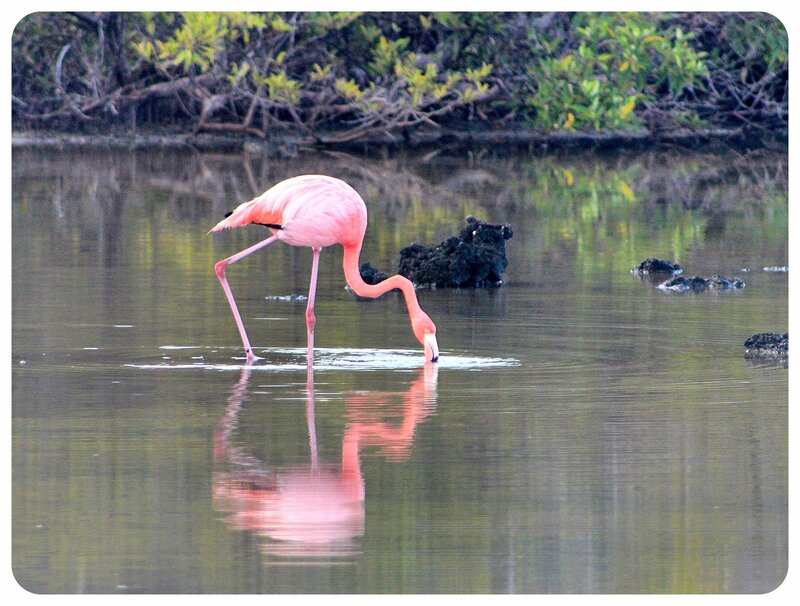 We walked over to a little lagoon which is known to be a popular feeding place for flamingos. 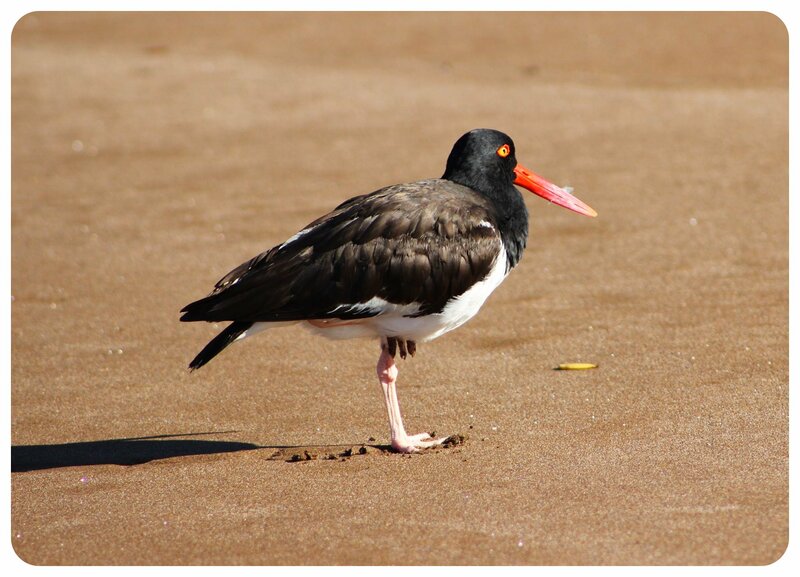 When we got there, we saw only one lone flamingo marching around the muddy water, but the flamingo population on the Galapagos is only 600, so even seeing just one of these distinctively colored birds felt special. Afterwards, it was time for another snorkeling session. This time, we got to swim with turtles! 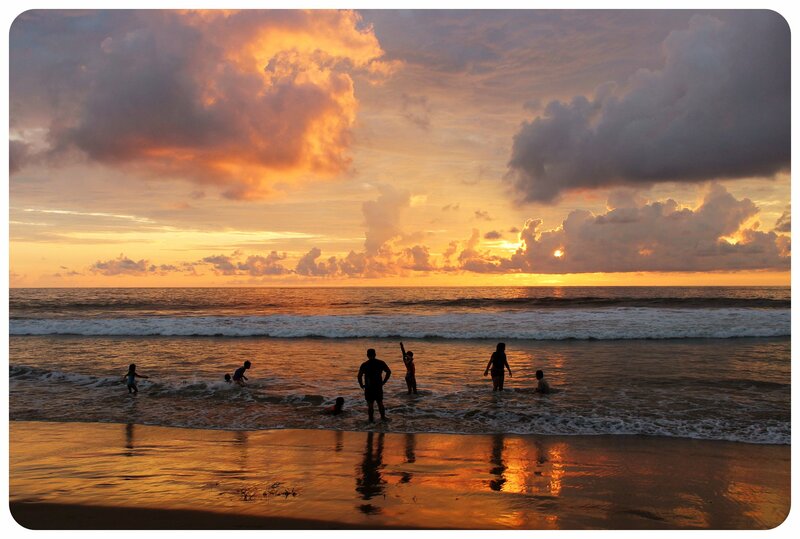 Even though I’ve swam with turtles in the Philippines and in Mexico, it never loses its magic for me. The species of turtles we swam with, the Green Sea Turtle, is the only kind of sea turtle that nests on the Galapagos Islands. Like many species of sea turtles, the Green Sea Turtle is an endangered species, their nests often destroyed by other animals, and the tiny hatchlings being eaten by birds before they can even reach the ocean. We followed these majestic creatures around the coral for a while, watching them feed on sea grass and going up to the water surface to get air every once in a while. For me, it was the perfect way to spend a Sunday morning. We returned to the boat where, as always when coming back from an excursion, we were greeted with fresh fruit juice and snacks. 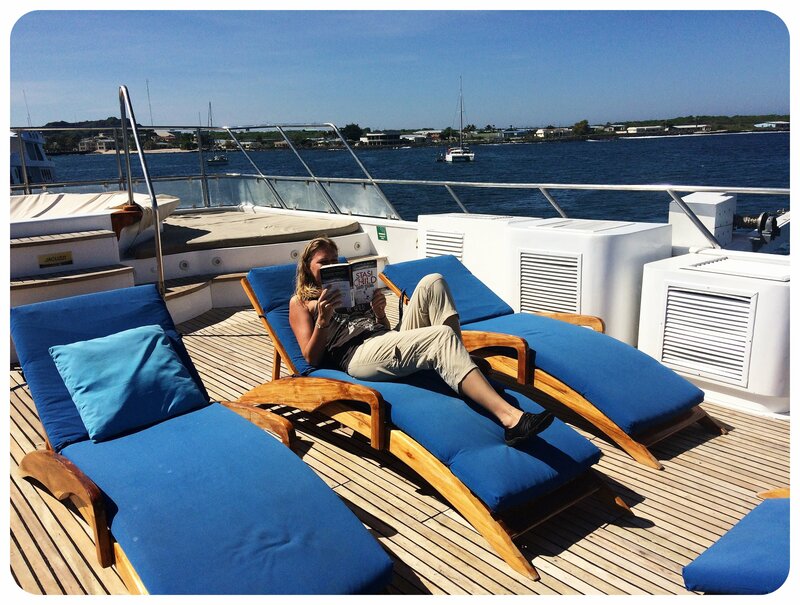 We spent the rest of the morning on board, enjoying the sun deck, reading a book, or just gazing out at the ocean. One thing I loved about the cruise was how well we ate. 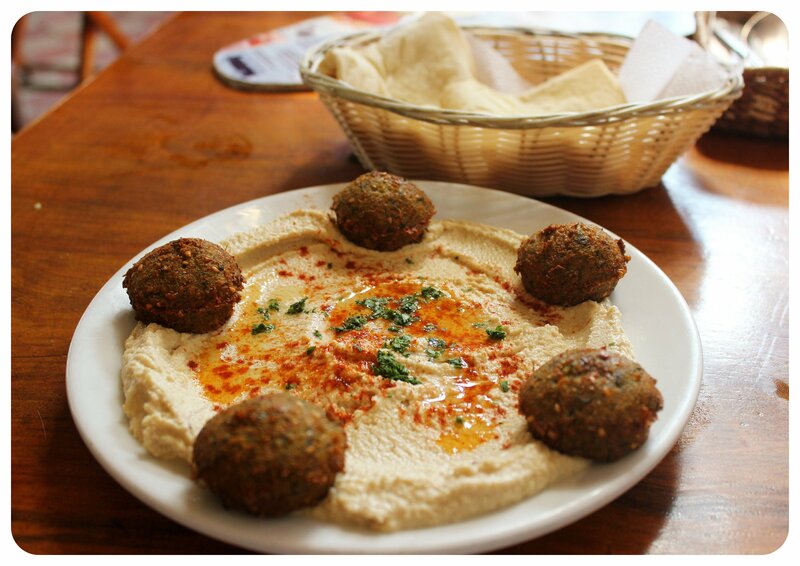 Sometimes it felt like all we did was eat – especially that morning. In between our post-snorkel snack and noon we got to try another tasty snack of cheese filled plantains and then it was already time for lunch. 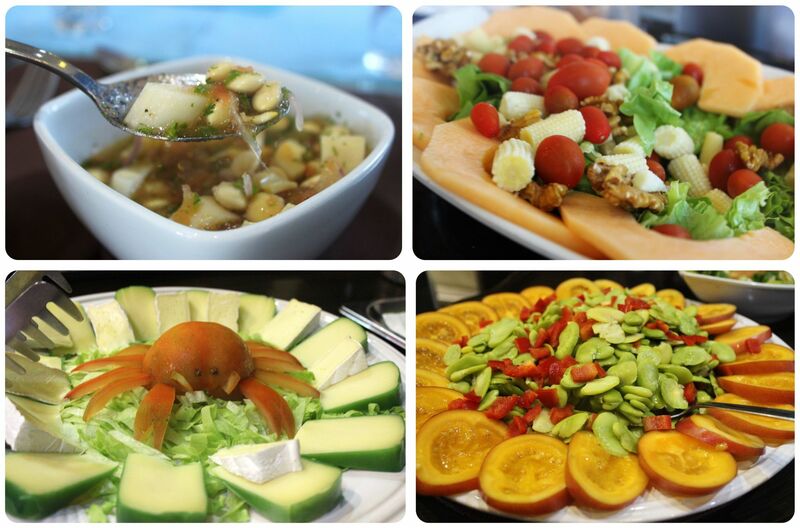 Lunch was always served buffet-style, including vegetables, rice, some kind of meat and a fresh salad. For me as a vegetarian our chefs prepared a special dish for each meal, including vegetarian ceviche (the rest of our group got ‘real’ ceviche). After a couple more hours on the boat we reached Santa Cruz where we got off the boat to spend the afternoon in the small town of Puerto Ayoro, to buy some souvenirs, have a drink, or to check our emails (there was no Wi-Fi on board). 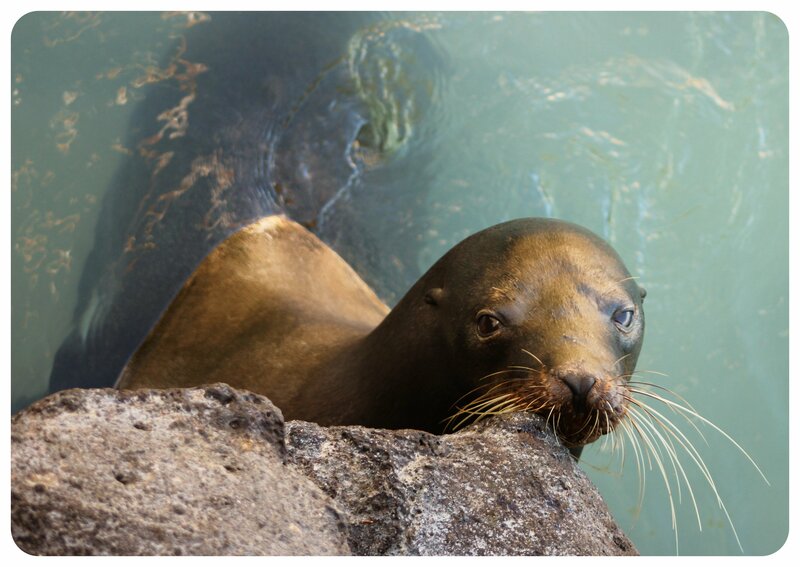 We all loved the sea lions that seemed to have taken over the town – they were lounging on an otherwise empty dock, frolicking in the water, and stretching out on some benches along the pier. Getting a glimpse of small town life on the Galápagos Islands was fascinating – can you imagine growing up in a place that remote? The town didn’t have much more than a bunch of souvenir shops and restaurants, a few small hotels and a big playground for kids to play. We got back to the boat just in time for another beautiful sunset, and then it was already time for our Farewell Dinner and Farewell cocktail. The days on the boat had gone by way too fast! The cruise was not quite over yet though: On our last morning, we got up early for one last sunrise snorkeling session around Kicker Rock, a rock in the middle of the ocean that is popular with hammerhead sharks. 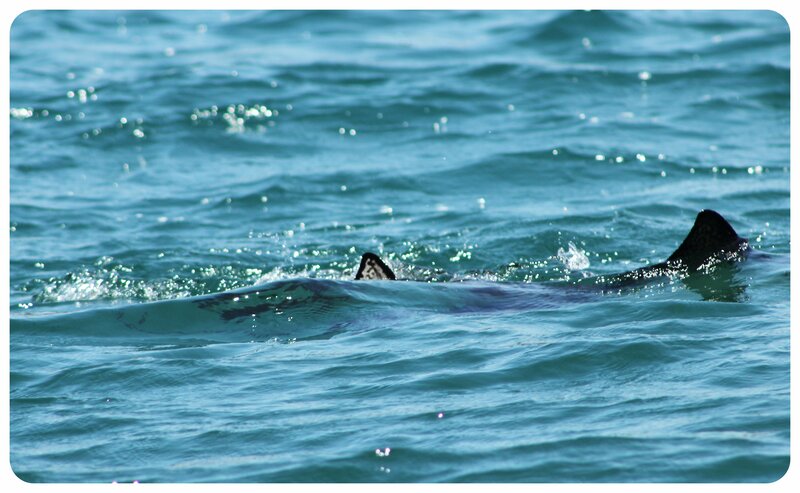 And yes, it didn’t take long until we spotted the first shark! 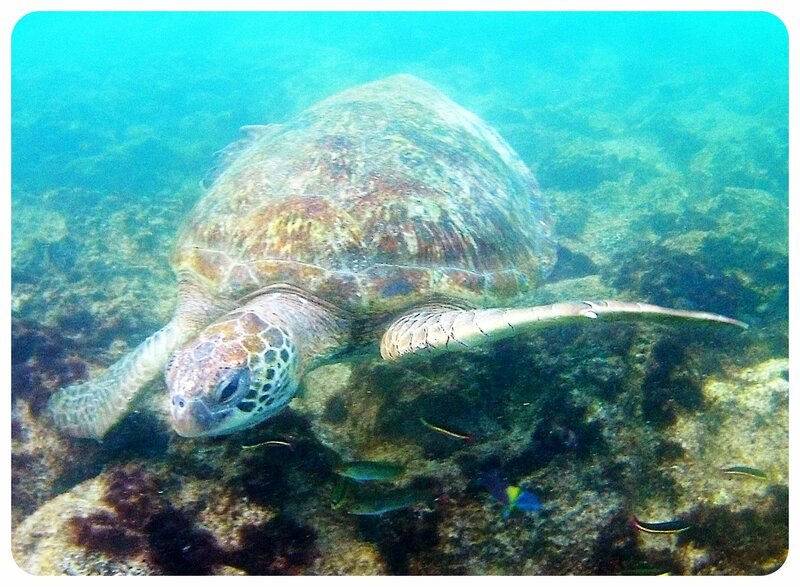 In addition to sharks, we were joined by a group of sea lions, a lonesome turtle and again, hundreds of colorful fish. A memorable end to our four-day cruise. After breakfast, we disembarked in San Cristobal where we were once again entertained by the local sea lions who take up every single free spot around the pier. One last moment with these adorable creatures, and then we were off to the airport, where one last adventure awaited us. Since our cruise ended in a different island than we departed from, we got to take a tiny 8-seater plane back to the main airport in Baltra. I ended up in the co-pilot seat, terrified at first, but quickly easing into the experience and enjoying the vast ocean views with a little island coming into view every once in a while. This was my first time in such a tiny aircraft, and having a front row seat for it made it even more exceptional than it already was. 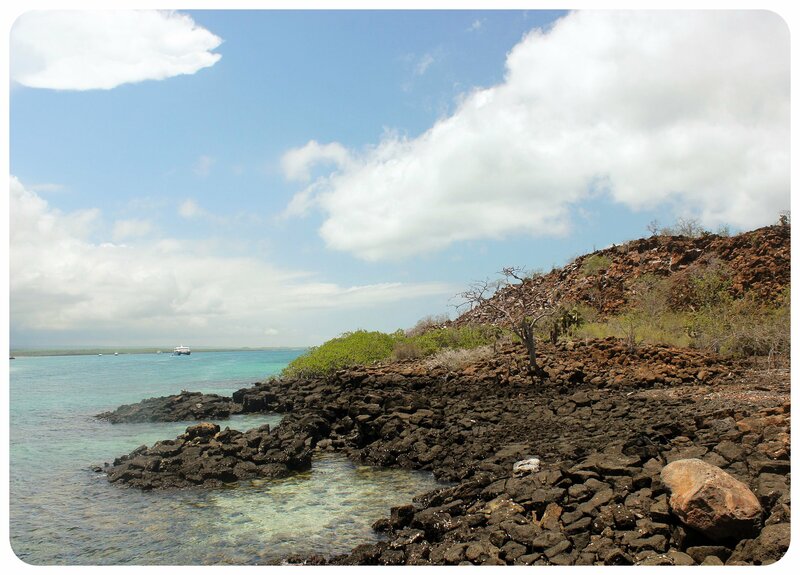 As we approached the airport in Baltra, where our connecting flight to Guayaquil was waiting, I felt the strong urge to skip the flight and stay longer in the Galapagos. I was not ready to get back to the mainland, where emails, work and deadlines were awaiting me. 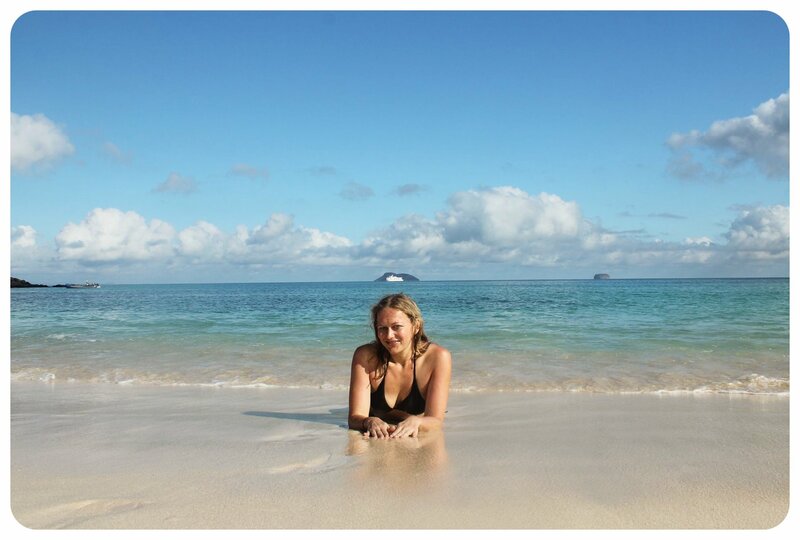 I wished I had more time in this remote paradise – the Galapagos Islands had captivated me in a way no other place has had a grip on me in a long time. I am not sure if I’ll ever get to return to the Galápagos Islands, but if I do, I’ll make sure to spend more than four days there – I already missed the Majestic, which we had left only a couple of hours before, and I wanted to explore the islands we didn’t get to see on our cruise – like Darwin Bay on Genovesa Island or the beaches of San Cristobal Island. 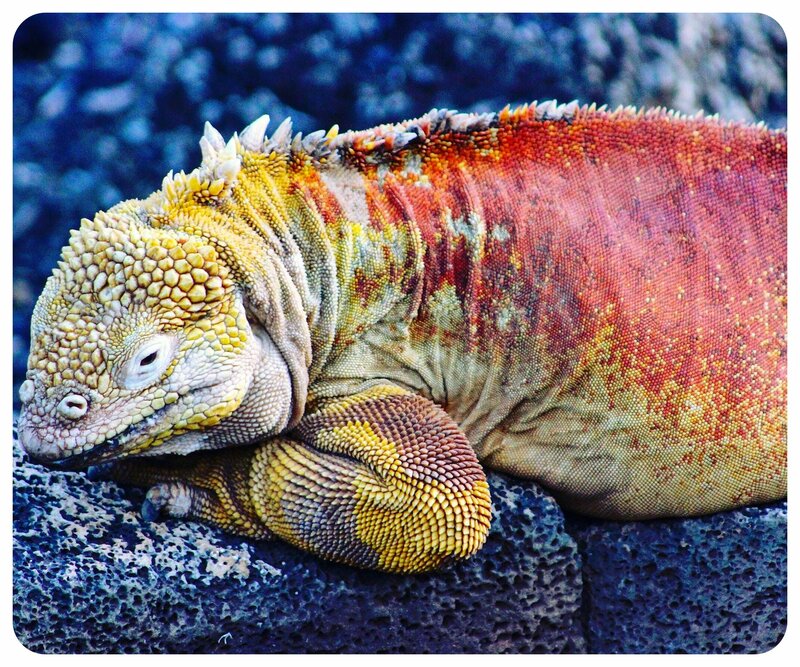 Stay tuned for a full article on how you can visit the Galapagos Islands – on a cruise like I did with Galapagos Luxury Charters, or independently. The place I was most excited to visit in Colombia after Las Lajas sanctuary was Cali, Colombia’s third largest city and the salsa capital of the world. 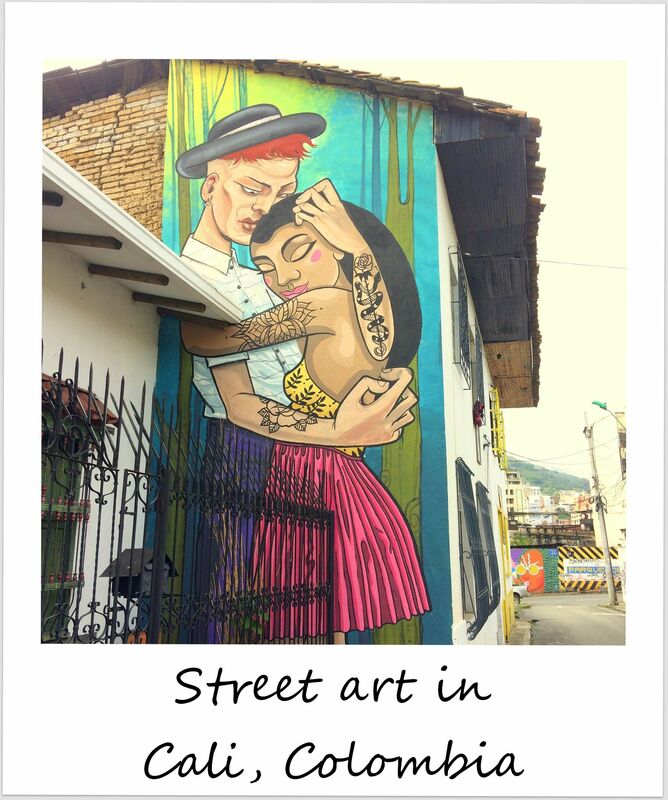 Last year, when I traveled through Colombia for nine weeks, I always saw myself stopping in Cali for a week or two to take salsa lessons – it’s almost a compulsory ritual for solo female travelers in Colombia it seems. You go to Cali and learn how to salsa. But then I flew to Mexico on a whim and never made it to Cali. 2016: Drive by robberies are frequent. A group of two or three motorcycles will pick a random passerby and surround her, pointing a gun at her and quickly emptying her pockets. The whole thing takes less than a minute. Apart from taking a taxi everywhere, there’s not much you can do about it, because they operate at daytime and even in “safe” neighborhoods too. Apart from common sense(which will minimize but *NOT* eliminate the risk of being robbed), empty your wallet of any unnecessary debit/credit cards, carry a photocopy of your passport instead of the original (If you have an ID card that can be easily replaced, it’s even better), don’t carry a lot of money. If you have an expensive phone, you might want to carry a cheap phone while in Cali. You could wear pants with hidden pockets, because the objective of this crime is to make a quick getaway, not to take a lot of stuff. That said, realize most tourists in Cali don’t get robbed. I was a bit freaked out, to be honest, and even cut my trip short, instead adding another stop to my tour of southern Colombia. 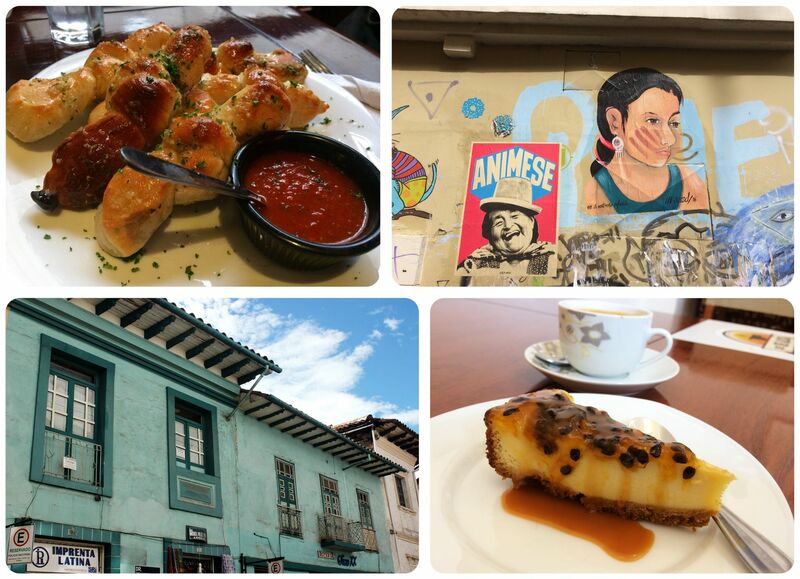 I’d stop not only in Popayan but also in the small town of Pasto. By the time I finally got to Cali, I had built up this image in my head of the city being a dangerous, gang-infested place where I’d get robbed for sure. Instead, I found a city I instantly liked, and which I didn’t find scary at all. 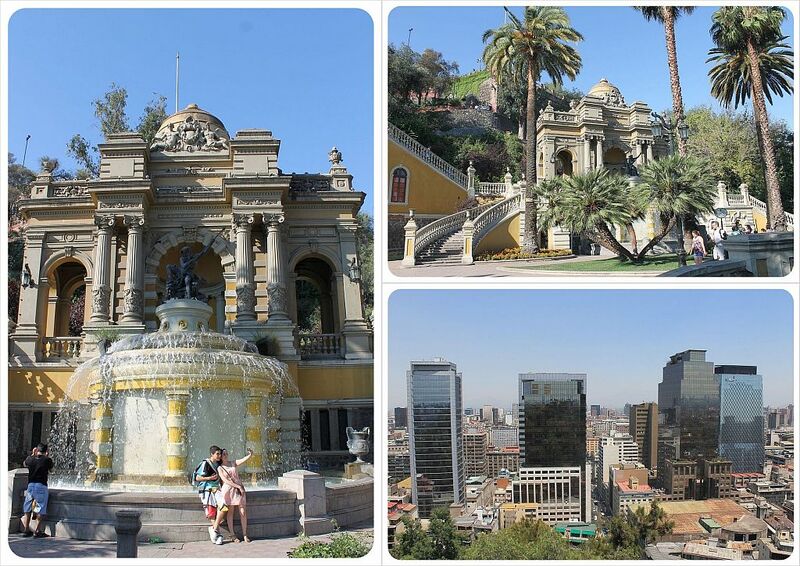 I went for runs along the beautiful river walk, I wandered around the downtown area, climbed to the top of Acueducto Park Hill for lovely views over Cali, I enjoyed strolls through Simon Bolivar Park while munching on fresh pineapple (for $0.17 a piece I developed an addiction quickly! 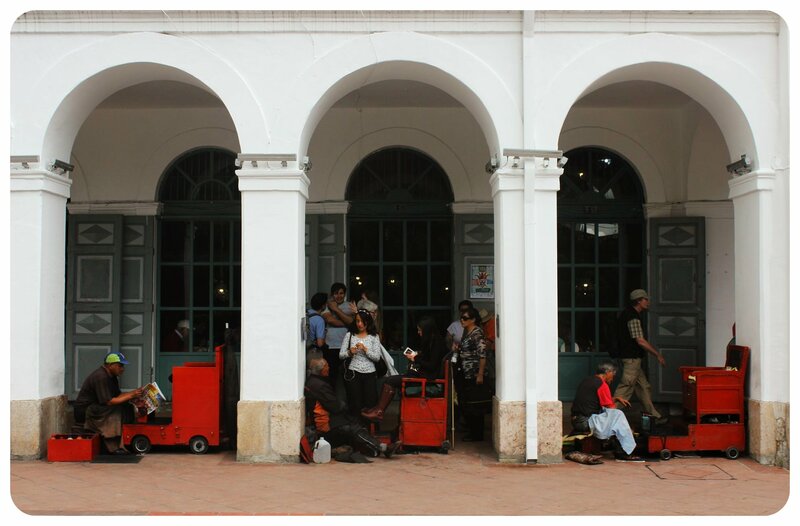 ), and I admired the colonial buildings as well as the awesome street art in the San Antonio neighborhood. 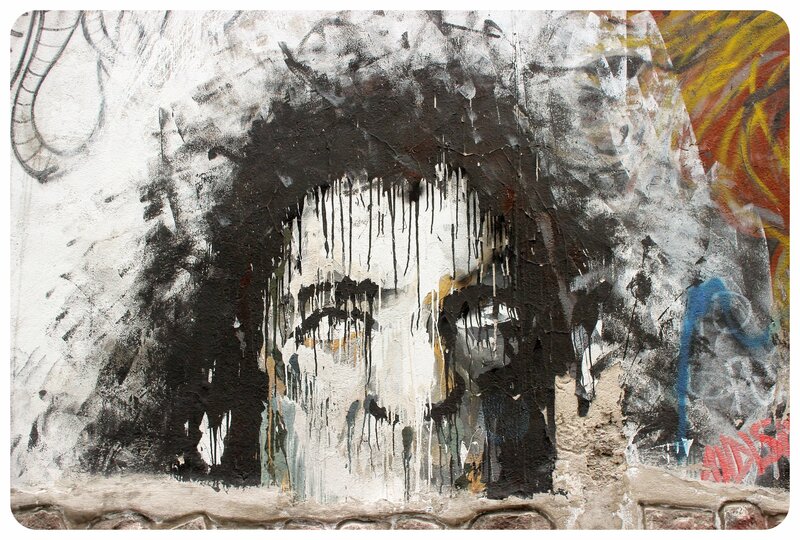 Speaking of street art – somehow nobody ever talks about Cali’s awesome street art scene. 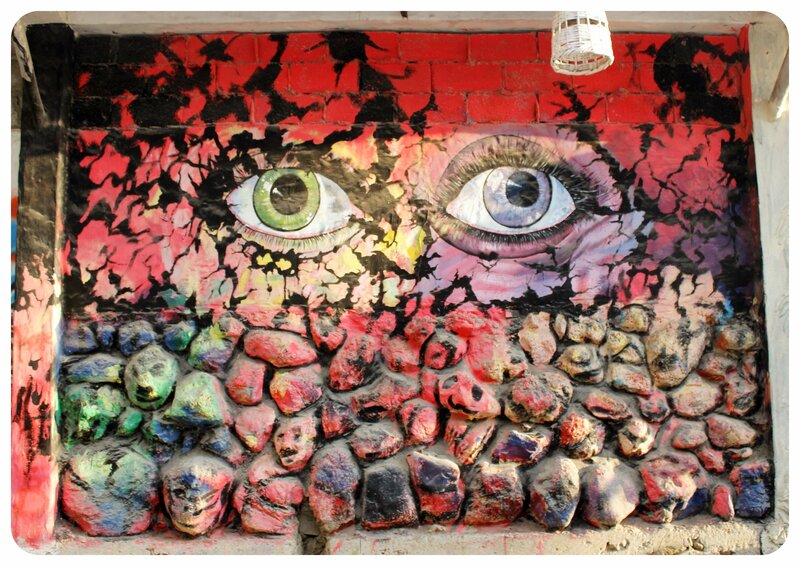 I’ve read several articles and blog posts on Cali that talked about the city’s churches and a cat sculpture park and salsa bars and museums, but no mention of the street art. 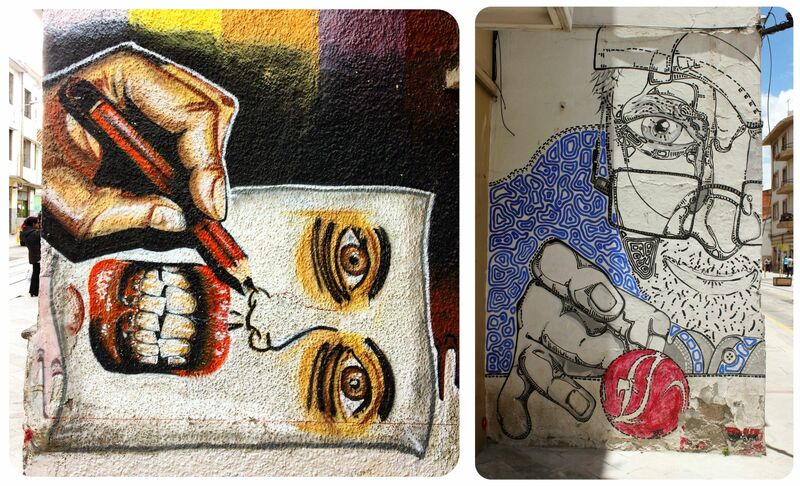 Hence I was surprised by the amount of street art I saw all over town – but what a pleasant surprise! 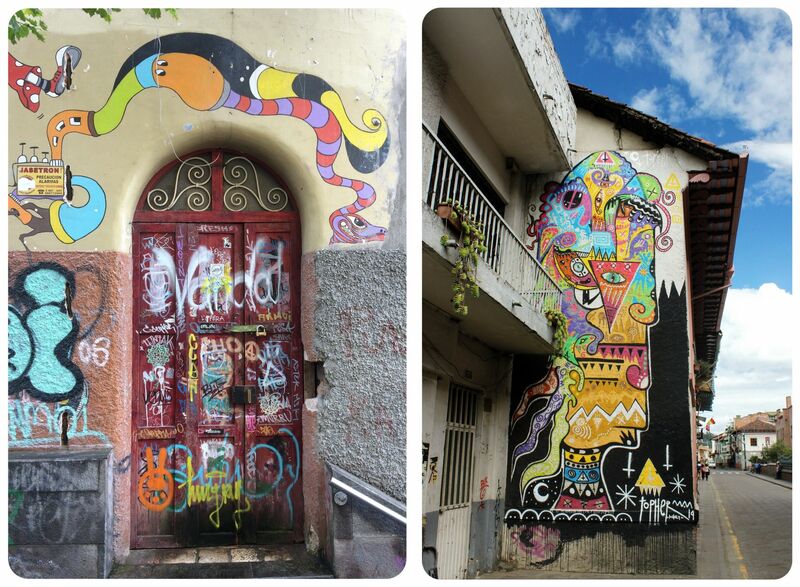 I loved the colorful murals and graffiti and couldn’t stop snapping away with my phone. The one thing I didn’t dare bring along on my wanderings around town after reading that little paragraph on Wikitravel, was my dSLR camera. I never felt unsafe taking my iPhone out until I was stopped by a local who told me I shouldn’t be walking around with my phone out, but always hiding it. Luckily, I never found myself in a situation that had me fear for my safety though. Instead, I had a lovely time in Cali. Next time, I’ll come back with more time and will stay long enough to learn salsa. I was surprised by what I was reading on my Kindle. 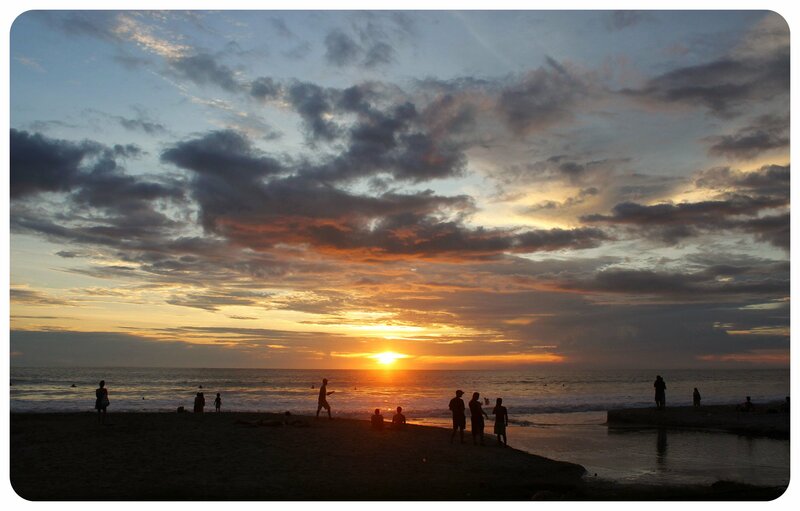 “Set in a picturesque valley some 2,800 meters above sea level, Ecuador’s lofty capital sits just 25km south of the equator. 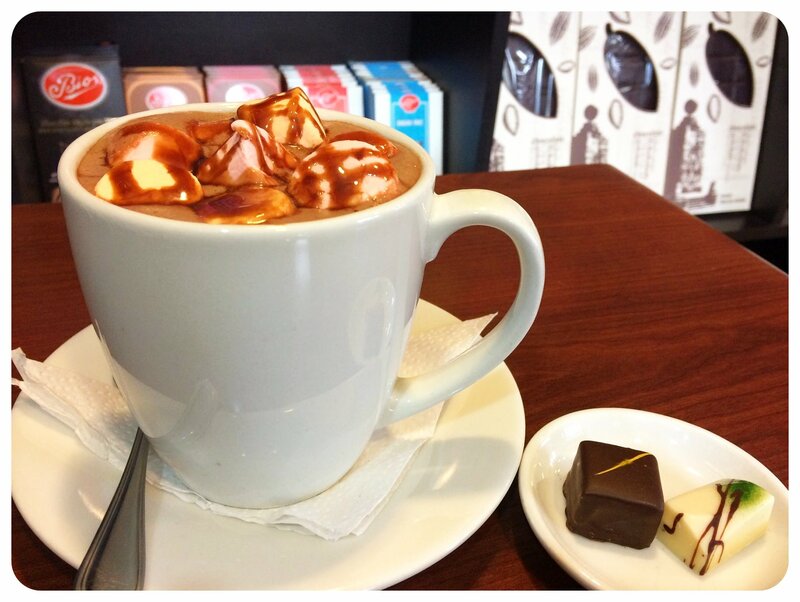 Its historic Old Town is a splendid maze of cobbled streets, colonial architecture and churches, dazzling attributes which helped it become UNESCO’s first World Heritage Site (along with Krakow) in 1978.”, marveled the author in the Independent article about Ecuador I was reading while enjoying my very first cup of scrumptious Ecuadorian hot cocoa. 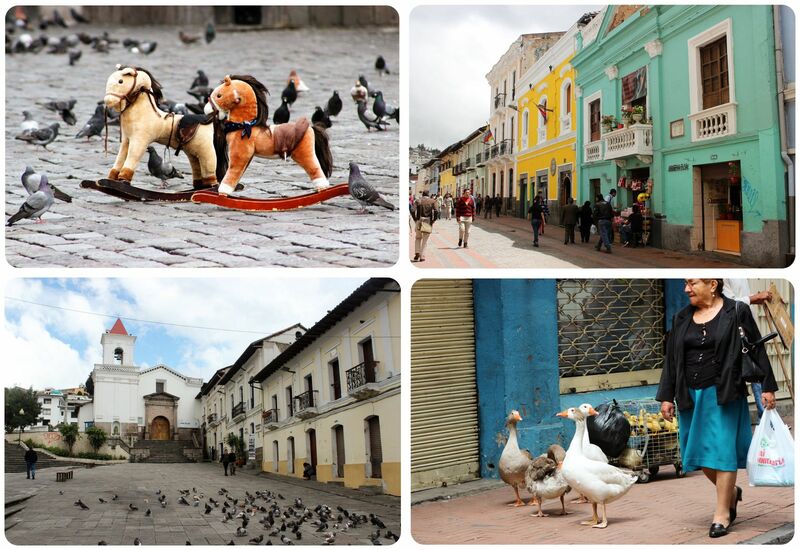 The article made Quito seem like a gem of a city, a town so beautiful that it would sweep me off my feet. The problem was, I just didn’t feel it. 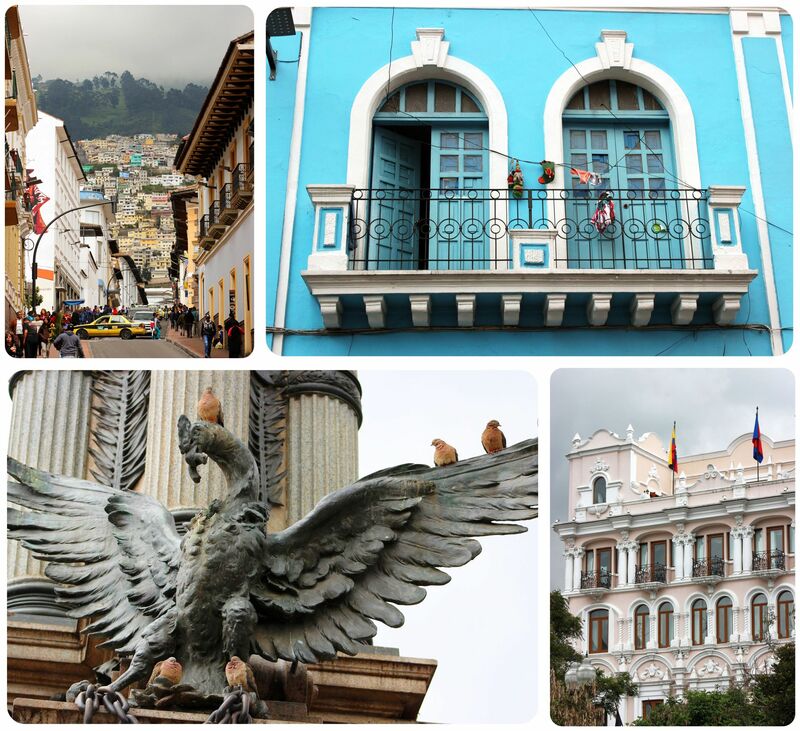 I had spent three days in Ecuador’s capital, my first stop on my trip through the country, which is usually enough time to make me fall for a place. But Quito and I, we just didn’t connect. I was a bit wary of visiting Quito, after hearing stories of robberies, people throwing feces from church towers to distract you so that they can take your belongings (see here, here, here, and here), and Quito being a bit sketchy all around. The cab driver who brought me from the airport to my hotel (a great opportunity to practice my rusty Spanish during the 45-minute ride) put me at ease, however. Quito had gotten much safer over the past few years, he assured me. I had nothing to worry about. 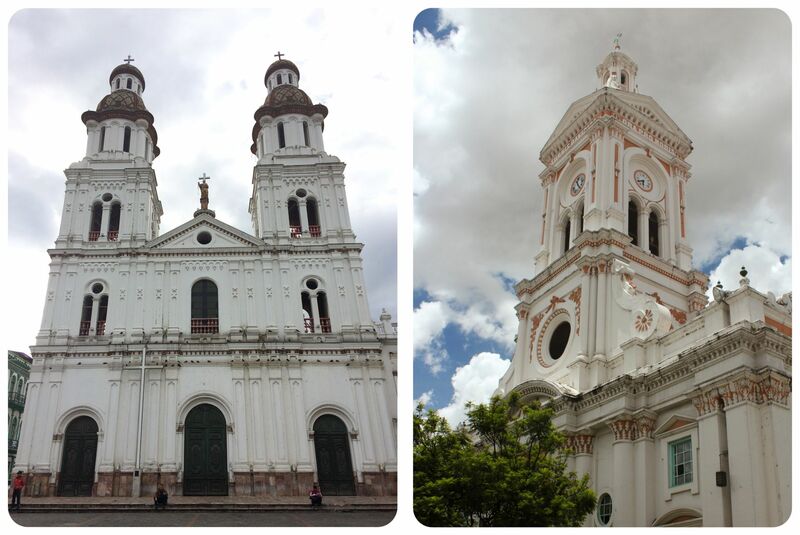 And so I excitedly took off on my first exploration of Quito, headed straight for the Old Town. And it was pleasant, yes – I just didn’t think the churches and the architecture that I saw there were ‘dazzling’, and I also wouldn’t call it a ‘splendid maze’. 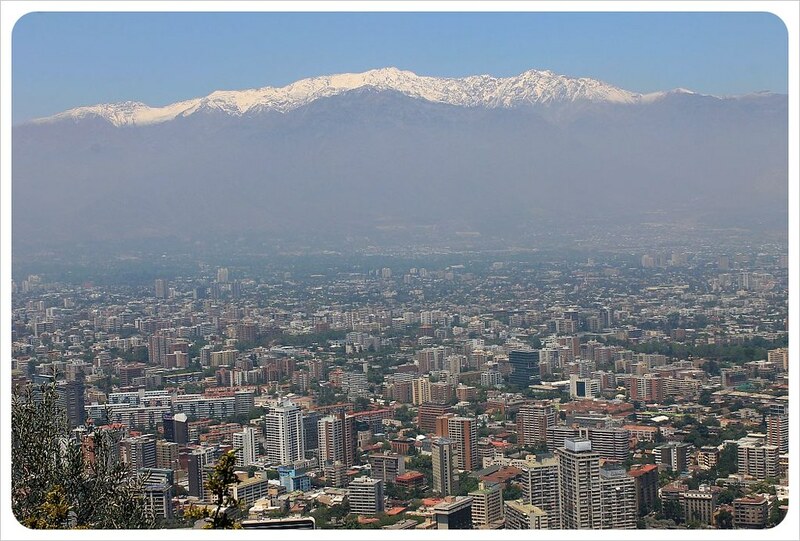 Lofty – yes, I could agree to that, because Quito is, at 9,350 feet (2,850 meters), the second highest capital in the world – only La Paz, Bolivia, is higher. Was I missing something? 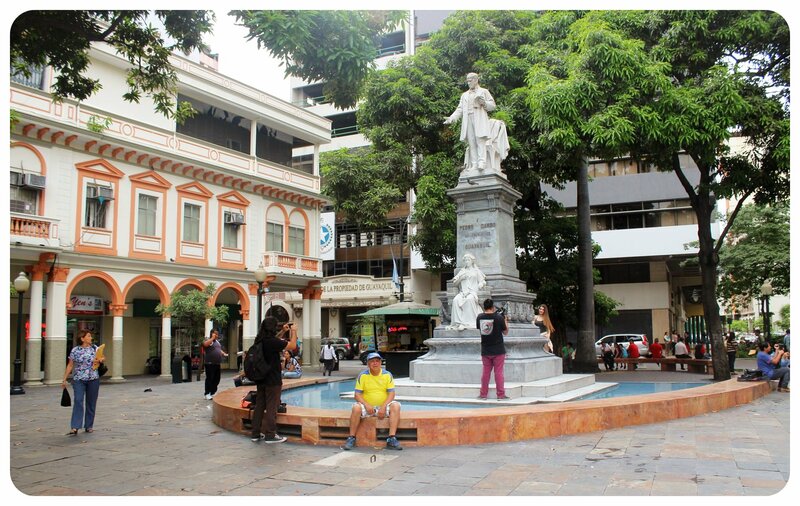 Upon returning to my hotel, I did some further research to make sure I wasn’t missing anything, and through Alex in Wanderland (who also wasn’t the biggest fan of Quito), I learned about a free walking tour. 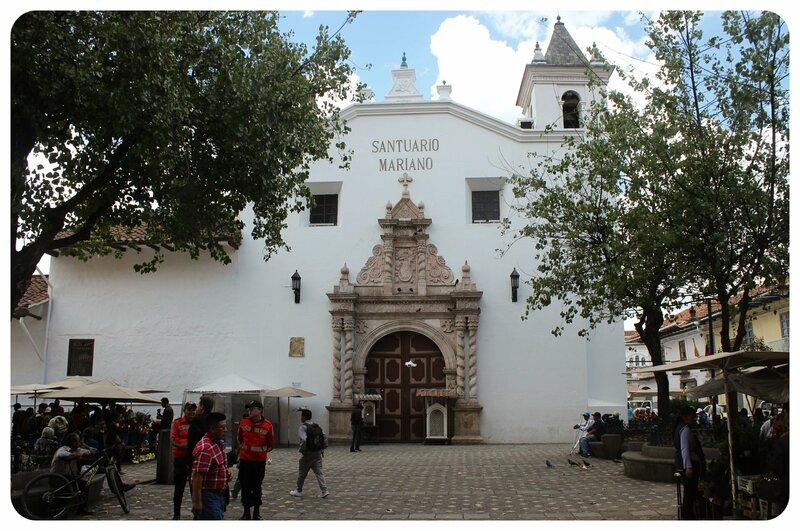 The next morning I joined about ten other travelers on a tour of Quito’s Old Town, this time with commentary from a local, and including a few spots that I had indeed missed. Did any of them wow me though? 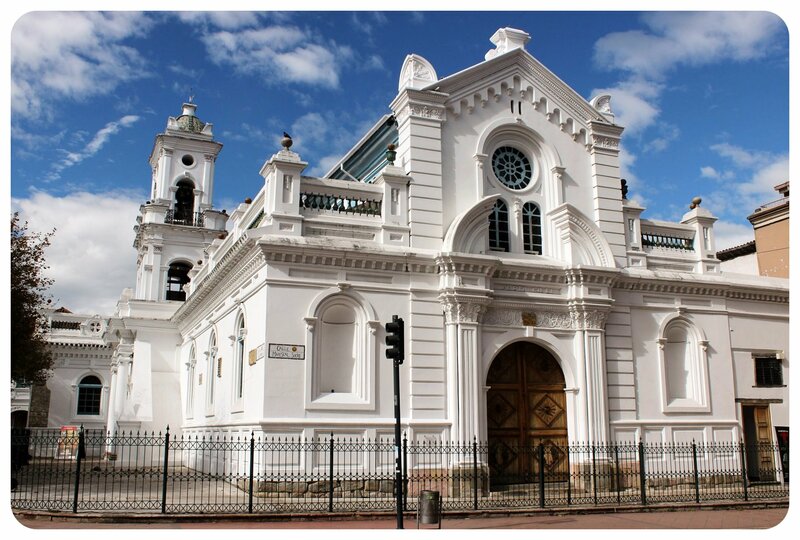 Unfortunately, I still didn’t love the city, but I have to say that I am glad I joined the walking tour because it gave me a much better understanding of the Ecuadorian culture and some insights into the life, history, and politics of the country. Our guide Andrea took us to the central market for example, where she gave us an introduction to the local fruits, and where I was excited to learn that one of my favorite Colombian fruits, lulo, grew in Ecuador, too, but was known as naranjilla here. Andrea introduced us to several other Ecuadorian specialties, whetting my appetite for the Food Tour the hostel offers once a week for only $10(unfortunately). 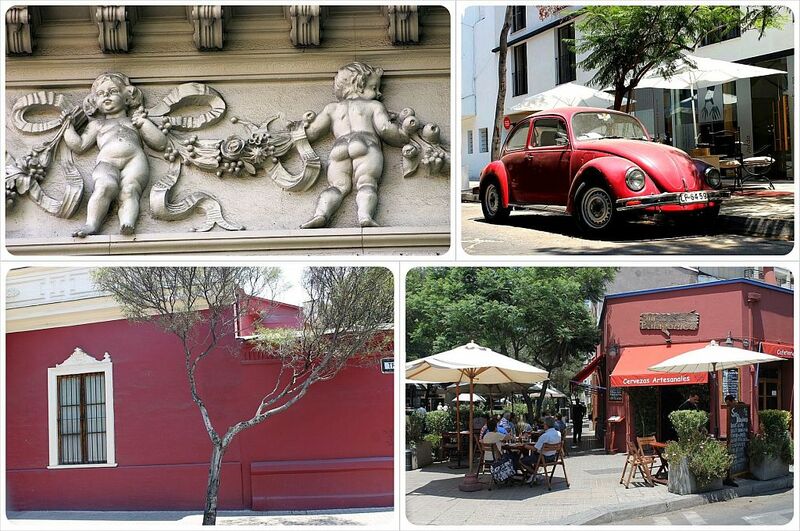 The walking tour also brought us to my biggest oversight: The bohemian La Ronda neighborhood with narrow cobblestone alleys and colorful houses, which I found more charming than any other part of the city I’d seen so far. 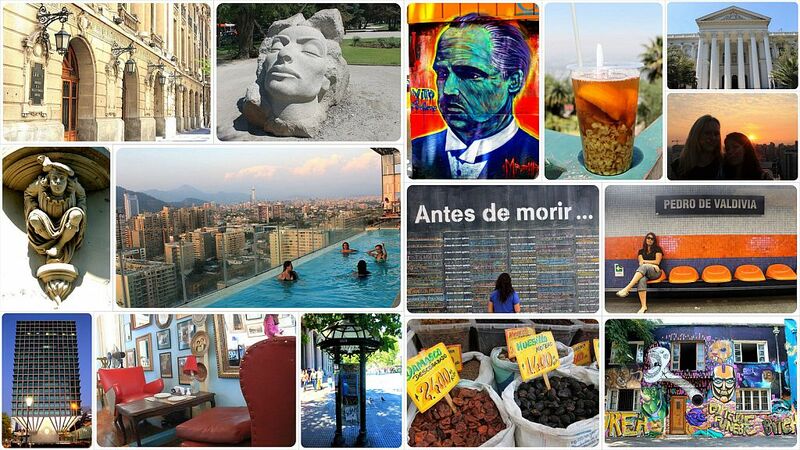 But even with Andrea’s lovely introduction to Quito, I still wasn’t too impressed. It didn’t help that it was raining every day during my entire stay, which means the city was always covered in a layer of clouds and the temperatures were in the 50s – too cold for me to be comfortable. Instead, I never left my guesthouse without my rain jacket and a scarf. 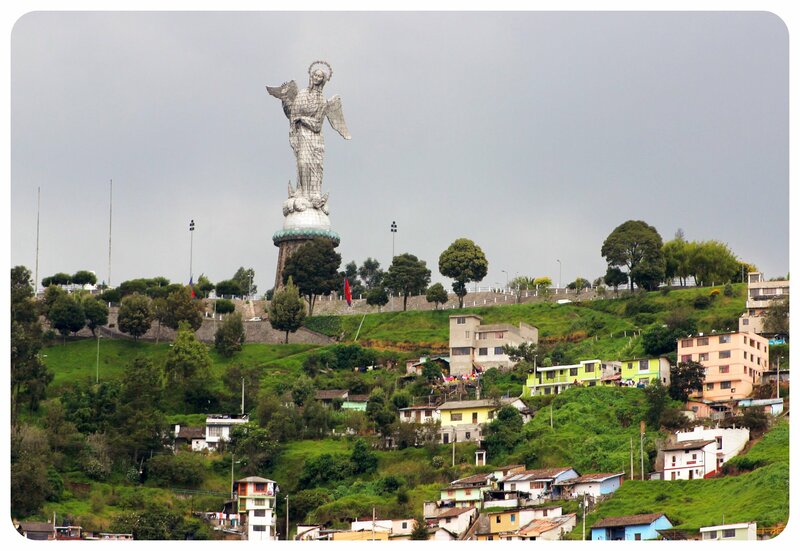 As for my taxi driver’s comment about Quito having become much safer, Andrea still warned us that it wasn’t a good idea to walk up El Panecillo Hill, on top of which the 45-meter-tall Virgin of Quito thrones over the city, (made of seven thousand pieces of aluminum!) a popular sight for tourists, but apparently not save to walk to. My guidebook had also warned to walk up this hill. Overall I felt like there was just not a whole lot to do in Quito. 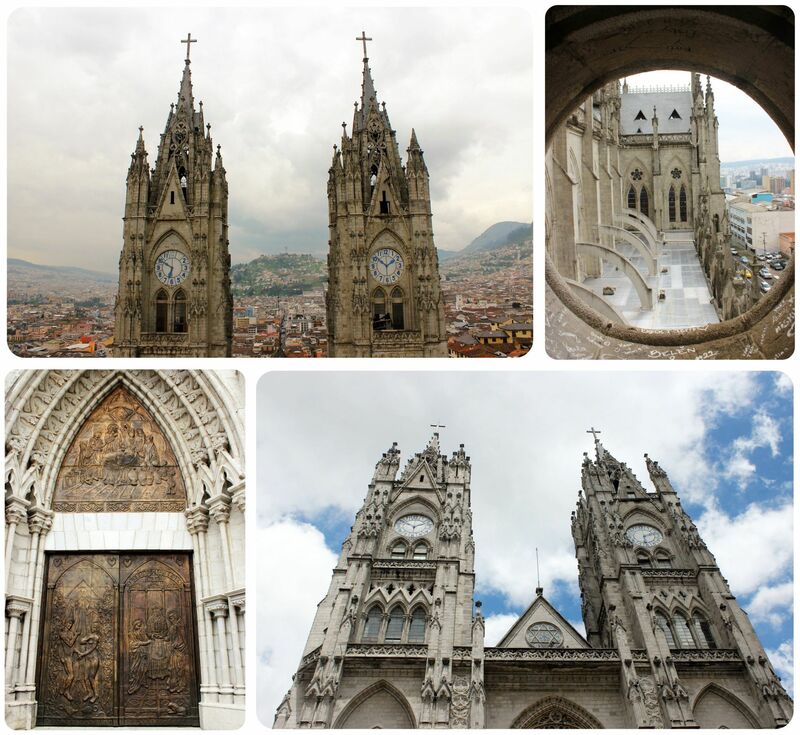 I visited almost all of the churches, including the beautiful, ornate Neo-Gothic Basilica del Voto Nacional which turned out to be my favorite, and where $2 bought me admission to the bell towers, which offered great views over the city, albeit the cloudy skies never went away for long enough to make it a truly stunning view. 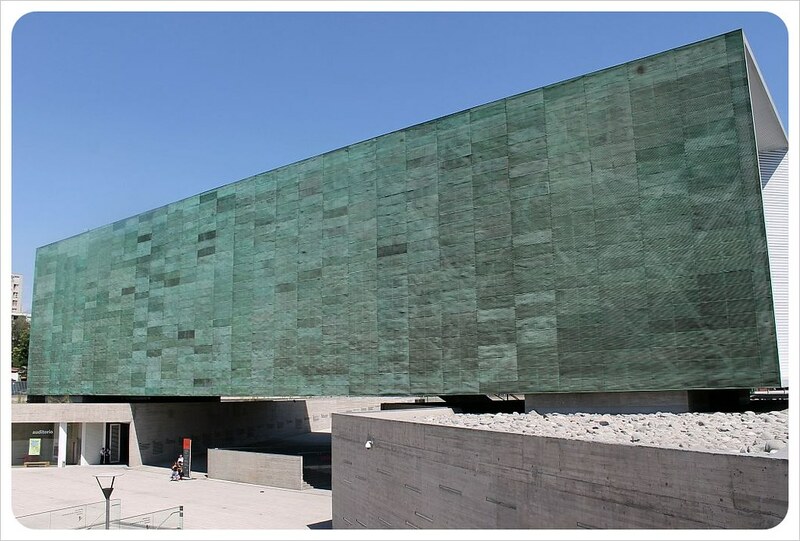 Just a short walk from the Basilica del Voto Nacional church was the Centro De Arte Contemporaneo De Quito, the Contemporary Art Museum, which, I was happy to find out was free to visit. 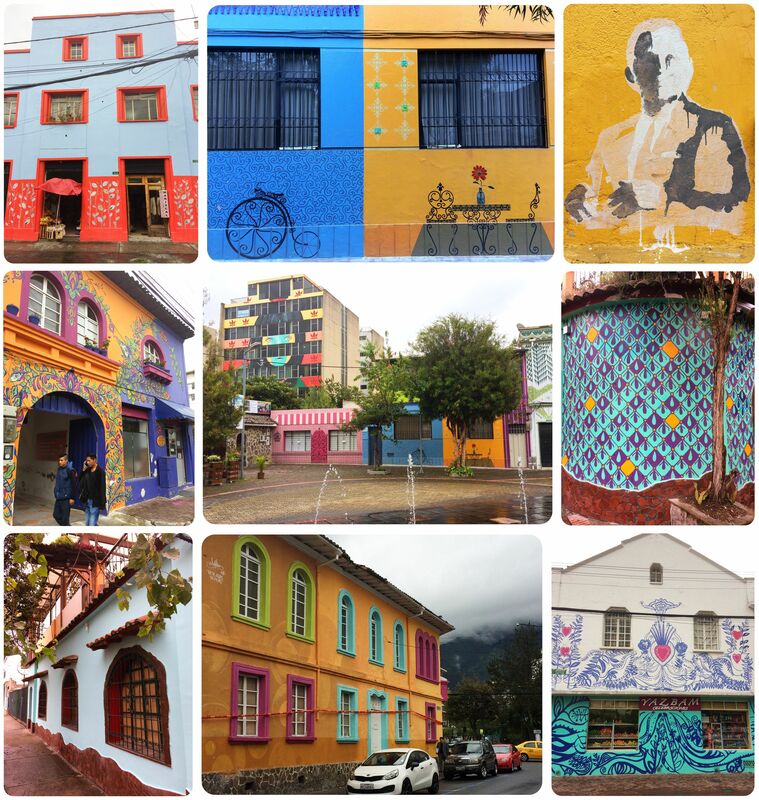 For an art lover like me, it turned out to be a highlight of my visit to Quito. During my visit they had a photography exhibit about a native group in the Ecuadorian Amazon, which was superb, as well as the ‘Tres mil leguas de algodón’ exhibit by Ecuadorian artist Fabian Patinho for which he photographed women who were comfortable in their bodies in underwear in an intimate setting and then turned them into acrylic paintings. 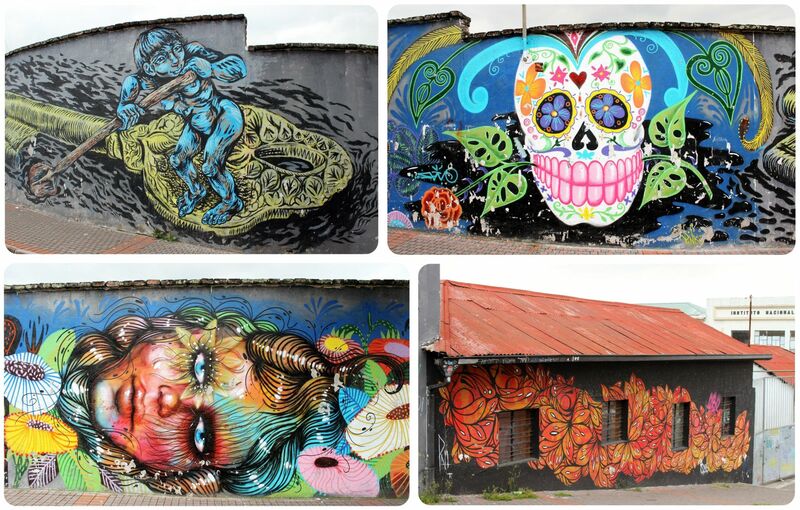 As I walked out of the museum, I noticed that the walls across from the museum were covered in murals and graffitis – the best ones I’d seen so far! The street art felt like an added bonus to this artsy morning. I almost made the same mistake Alex In Wanderland made to skip the ‘New Town’, but after reading in her article that she regretted waiting until her last night in town to check it out, I decided to head over there to see how it compared to the Old Town. Again, it didn’t blow me away, but it was nice to see that there was an area with lots of restaurants, bars and nightlife, something I hadn’t seen to the same extent in the Old Town, and as I ventured further away from Plaza Foch, the main square in the New Town, I found especially the little plaza Borja Yerovi with its colorfully painted houses and murals delightful. 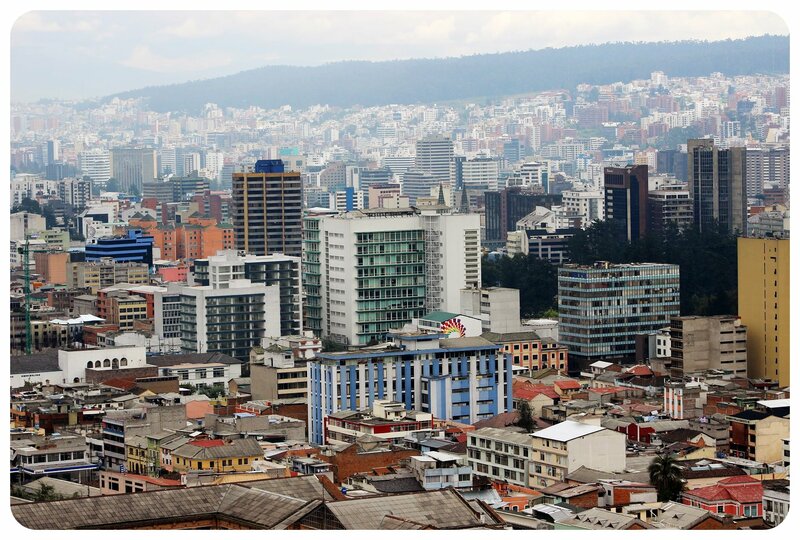 I even decided to stay in the new part of town upon returning to Quito so that I’d be right by some nice coffee shops and bars, and maybe check out the nightlife. 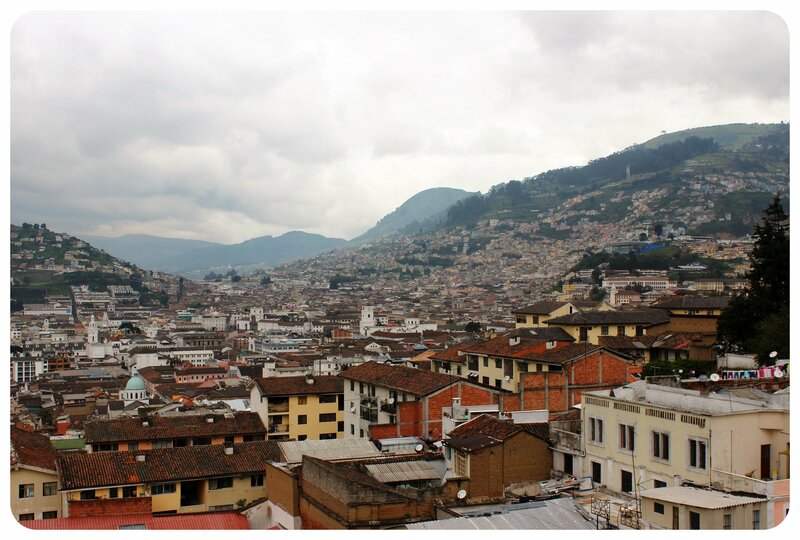 I congratulated myself on that decision when I stopped in Quito for the second time a few weeks later. 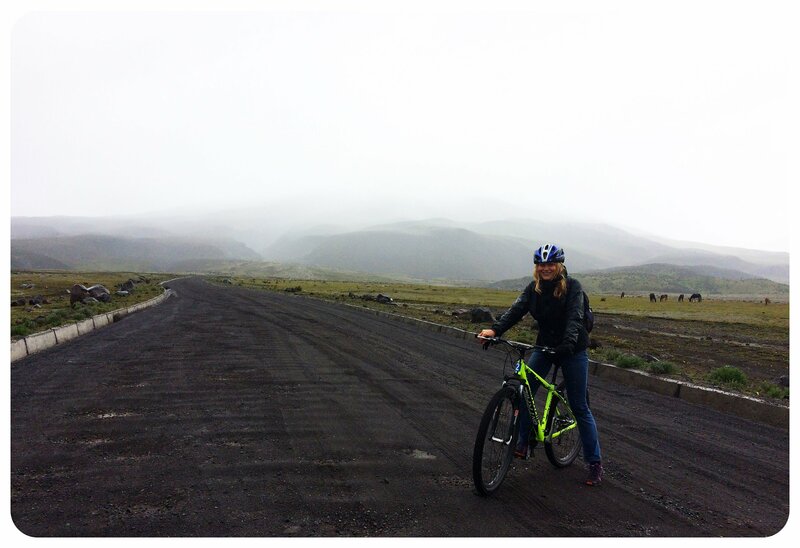 To be honest, I wouldn’t have come back to Quito had it not been for a mountain biking tour of Cotopaxi volcano I wanted to do. Since this particular tour only runs on weekends, I didn’t get to do it during my first visit, but I really wanted to climb at least one volcano in Ecuador, so why not go for the second highest active volcano in all of South America? 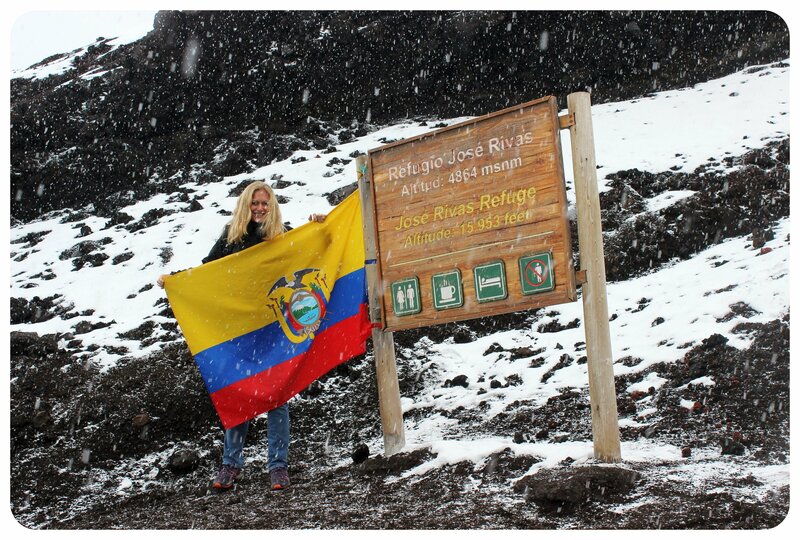 Cotopaxi is one of the highest volcanos in the world, reaching a height of 19,347 feet (5,897 meters). 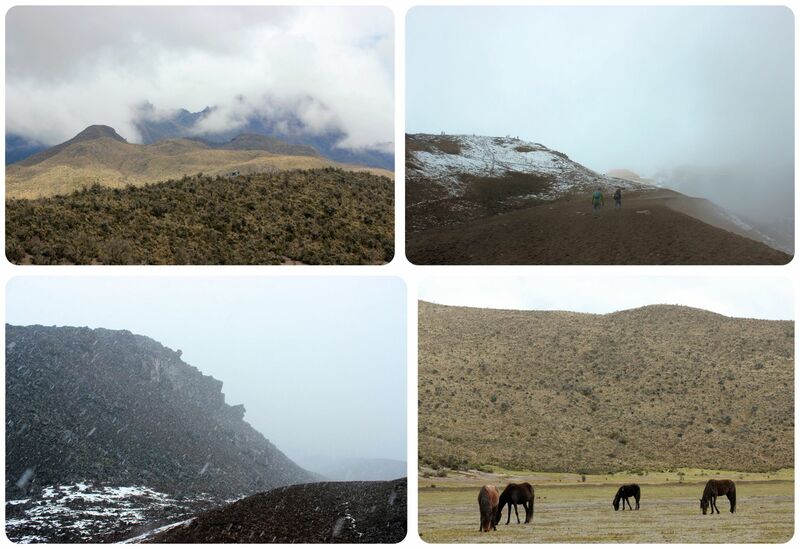 Again, the weather gods weren’t on my side when I returned to Quito, but I tried to make the best of my volcano tour. 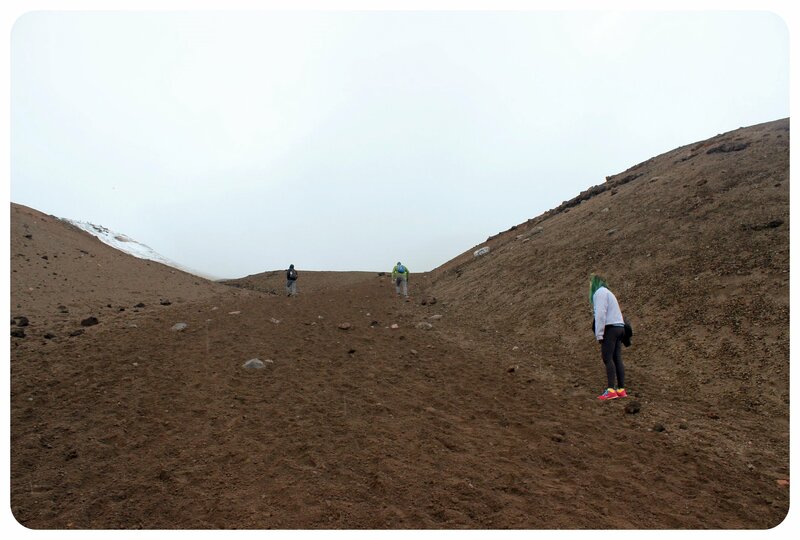 On a grey and rainy day, our group of six piled into a minivan, and when we arrived in Cotopaxi National Park, the volcano was hiding behind a massive cloud. We drove up until a parking lot to do a short climb up to Refugio Jose Rivas at 15,953 feet / 4,864 meters – the highest point you can climb to at the moment. Summiting hasn’t been possible since August 2015, when the volcano woke up and started spewing ash again for the first time in thirteen years. As we were making our way to the Refugio, it started snowing, and what started out as light snow turned into a considerable snowstorm by the time we reached the top. The snow turned into rain when we descended again, ready to hop on the mountain bikes, ruining the experience I had been very much looking forward to. We arrived at Laguna Limpiopungo at 12,566 feet (3,830 meters) completely soaked, muddy and chilled to the bone. The flora and fauna of the Altiplano, which I had admired when we were driving through the Altiplano that morning, was barely visible in the rain, and I couldn’t even bring myself to take out my camera and snap a picture of the lagoon, which is popular with birds and would have made for the perfect place to end our tour at. This was certainly not the mountain biking adventure I had been hoping for, but I guess you can’t be lucky all the time. 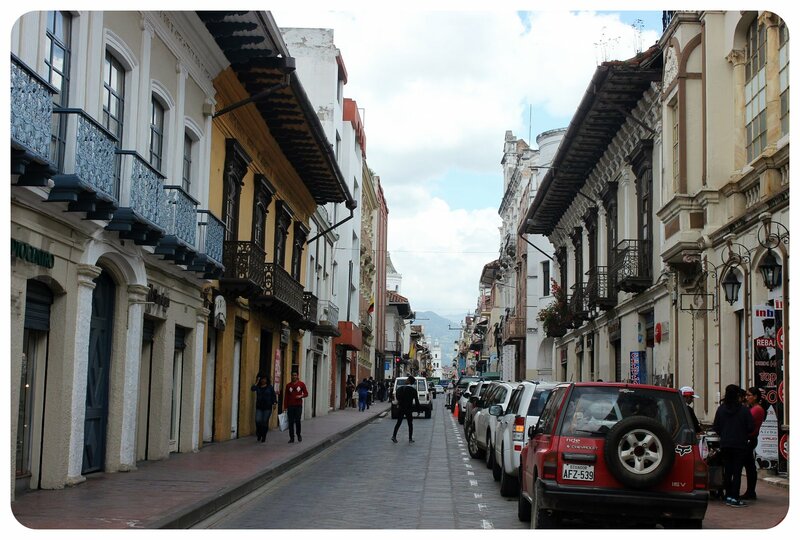 When I was dropped off in Plaza Foch, the center of the bar scene of Quito’s New Town, after the tour, I knew I had made the right decision to stay in this part of town: the plaza, which had been quiet the night before, was bustling with people, the coffee shops and restaurants were all busy. 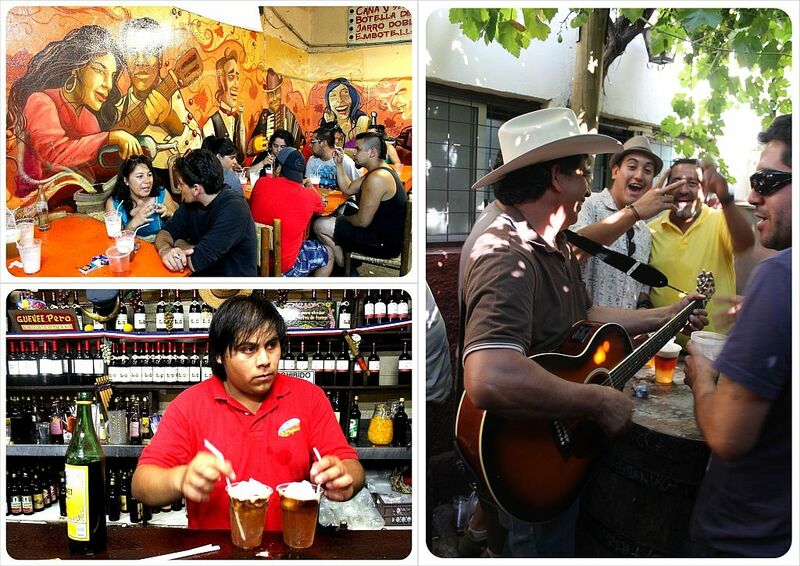 It was Friday night and I was determined to make my last night in Quito a memorable one. I found a lovely vegetarian restaurant, El Maple, and right across the street from it, a fantastic artisanal German micro-brewery, Cherusker Cerveceria. On the same street (Joaquin Pinto), I checked out The Lucky Charm Pub, and around the corner Finn McCool’s Irish Pub, which happened to be right next door to Radar, a gay and lesbian bar. So while I didn’t grow fond of Quito during my two visits, I felt like I ended them on a good note with a little taste of Quito’s superb nightlife. 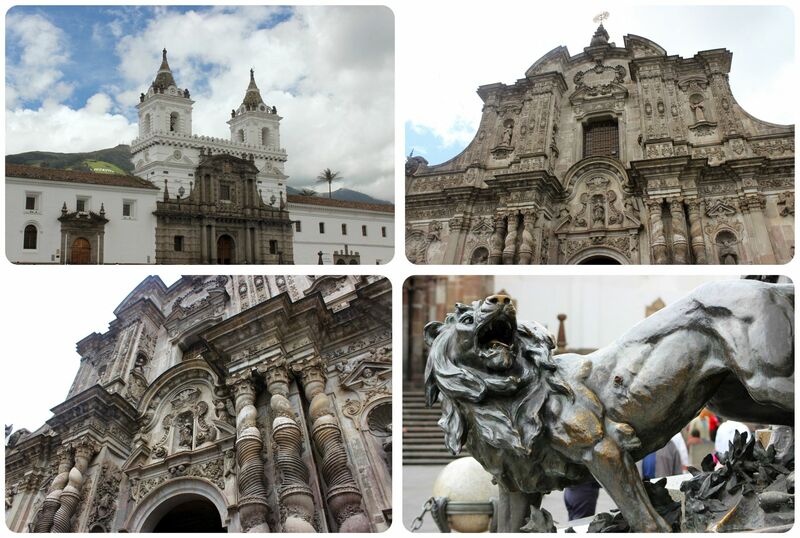 Have you been to Quito? 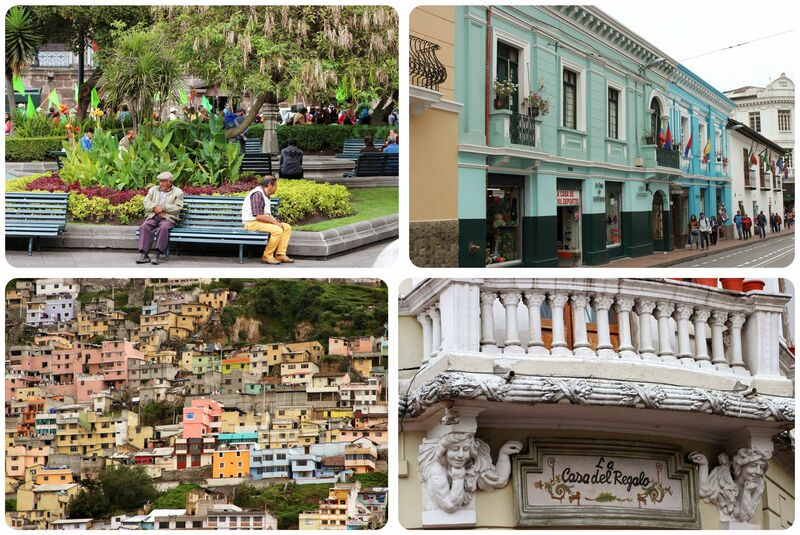 What did you think of Ecuador’s capital? There are landmarks and monuments that you see a picture of and you just think: ‘Wow! This place looks amazing! I want to go there one day.‘ I feel that way every time I see a picture of the pyramids in Egypt, the Taj Mahal, the rice terraces in Bali, but also lesser known places like the ‘Swing at the end of the World‘ (where I made it to last month). And Las Lajas. You might not have heard of Las Lajas, but maybe you’ve seen a picture? The first time I saw a photo of it was many years ago, before I even started my round-the-world trip in 2010. 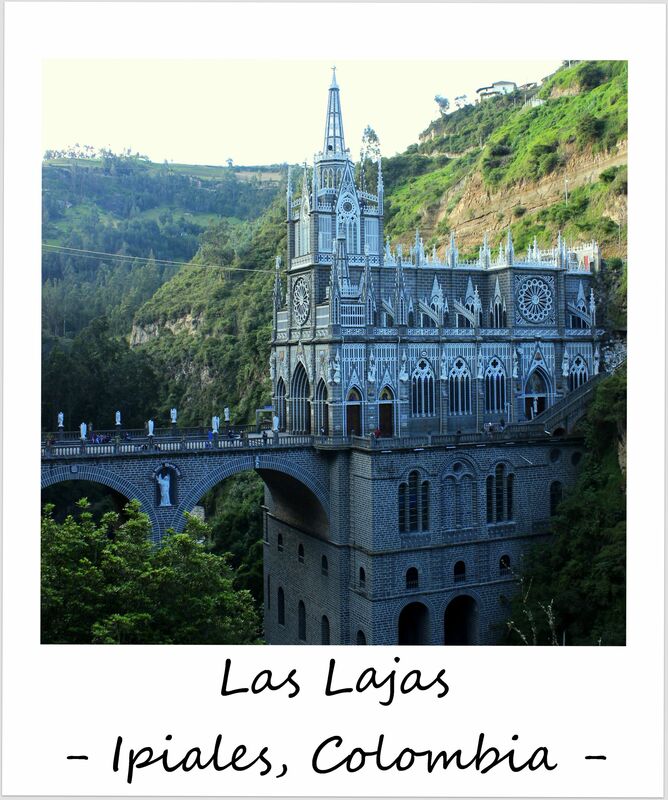 When my partner and I decided to make our way south from Mexico all the way to Argentina, I put Las Lajas on the itinerary. I didn’t even know where exactly it was, I only knew that it was in Colombia. And then we stopped our travels south in Panama, made a detour to Europe instead of continuing on to Colombia (back then, we needed a change of scenery after nine months in Latin America). 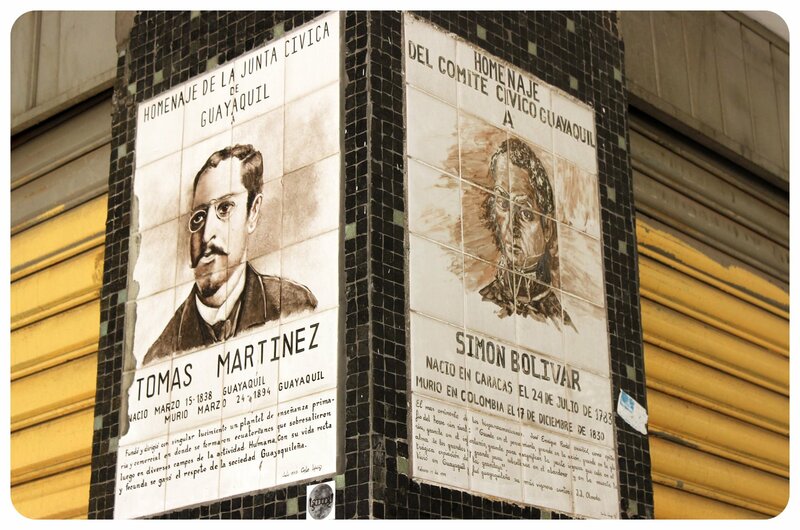 When we returned to Latin America a couple of years later, we started in Argentina and wanted to work our way up to Colombia. 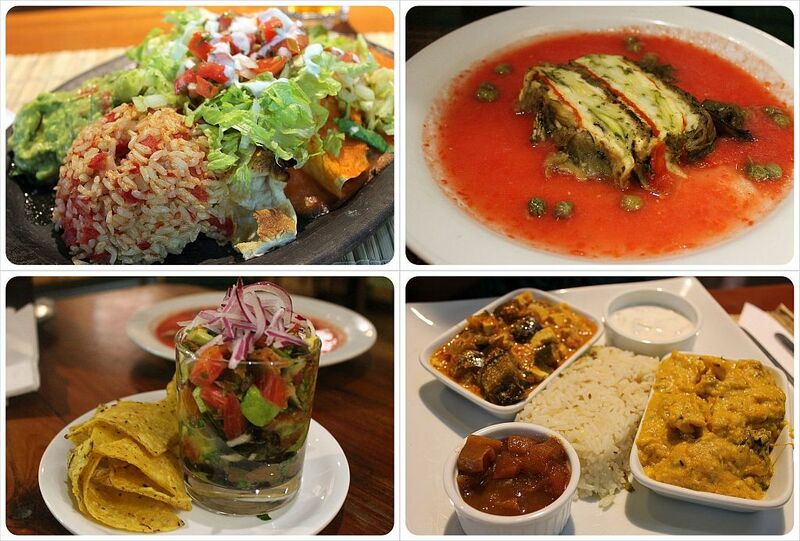 We only ever made it to Peru (and then this happened). It was like I wasn’t supposed to see Las Lajas. But last year, I finally made it to Colombia. I was finally going to visit Las Lajas! When I mapped out my trip, however, I saw where Las Lajas was located: all the way in the south of Colombia, close to the Ecuadorian border. 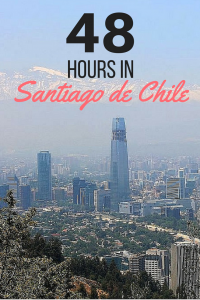 I’d only make it there if I was going to Ecuador, which was something I’d contemplated, but eventually I ran out of time to visit both countries. Was I ever going to see Las Lajas? 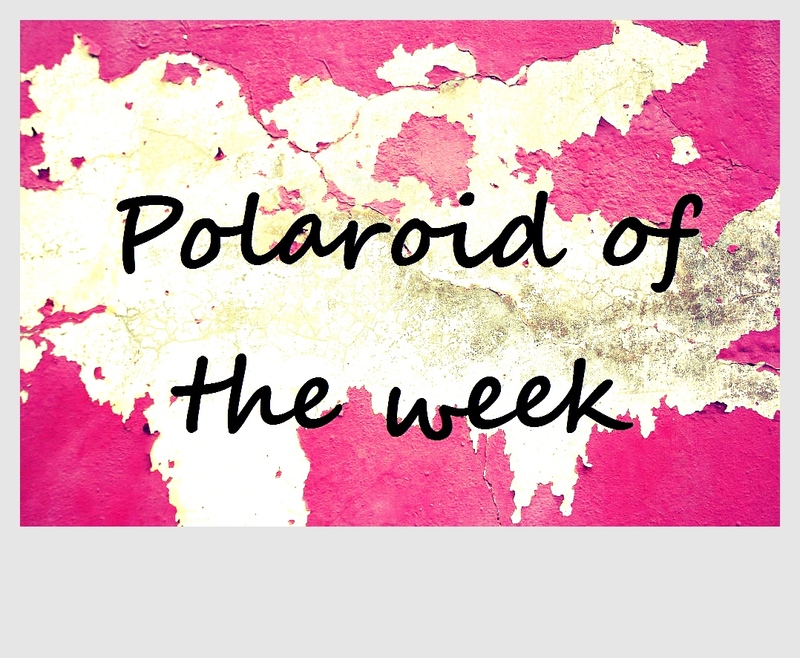 Well, the Polaroid already gave it away, I guess. Yes, I finally made it to Las Lajas! 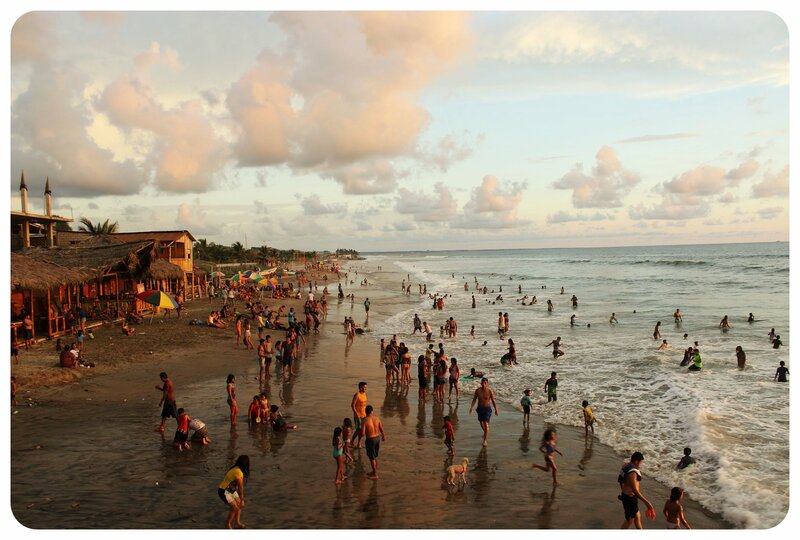 I decided to add a whirlwind tour of Southern Colombia to my Ecuador trip, crossing the border overland. The town of Ipiales was my first stop in Colombia, and from there, it is only a short 15-minute drive to Las Lajas. The church is built into a canyon, right over the Guáitara River, and the name actually refers to the rock that it is built into (laja is the Spanish word for this kind of sedimentary rock that’s found in this canyon). The entrance of the church, built in Gothic Revival style, is reached via a 160 feet (50 meters) high bridge over the river, and the height from the bottom of the canyon to the top of the church is exactly 100 meters (330 feet). It is a spectacular sight. What makes Las Lajas special for Catholic pilgrims from all over Colombia and beyond is the story of how it came into existence in this rather odd location: In 1754, a woman and her deaf-mute baby daughter were caught in a storm in this canyon, and saw a cave they could find shelter in. Inside the cave, the little girl pointed at a silhouette illuminated by lightning – an apparition of the Virgin Mary – exclaiming “The woman is calling me!”. All of a sudden, the girl was able to speak. It is believed that the virgin cured her and caused people to start heading to the site as news about this miracle began to spread across the region. A shrine was built, which eventually was replaced by a larger shrine, which then resulted in the construction of a church in the beginning of the 20th century in that very spot. 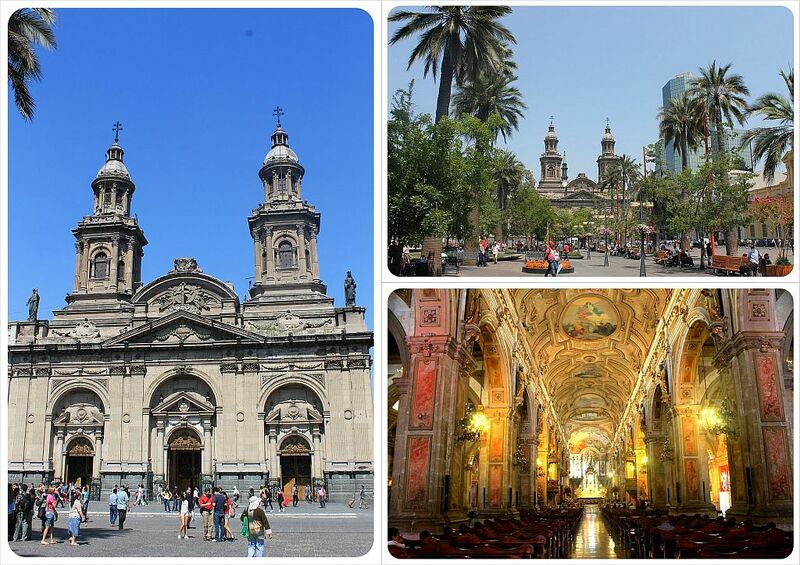 It took several decades to finish the church that you can visit today. In 1952, Las Lajas received canonical coronation from the Vatican and it was made a minor basilica in 1994. In 2007, Las Lajas was declared on of the ‘Seven Wonders’ of Colombia. 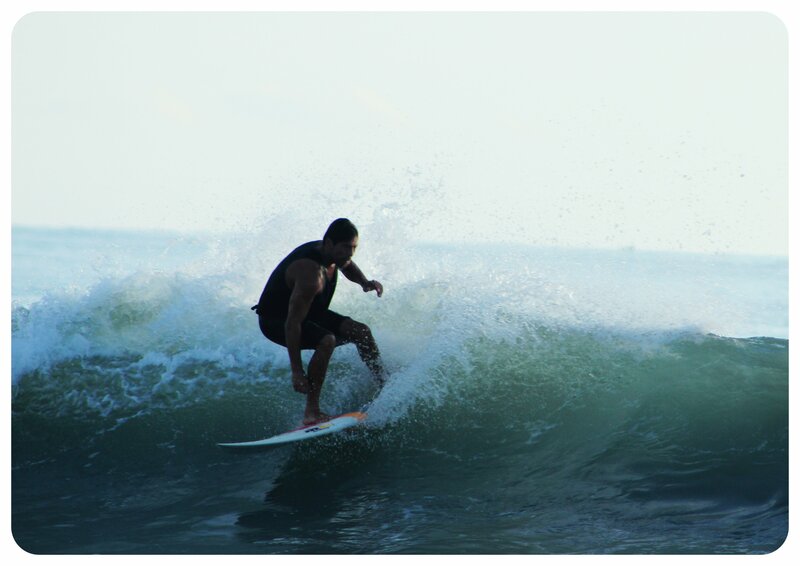 Baños is known as Ecuador’s adventure capital, and I knew there were a bunch of activities I could do here that would give me a nice adrenaline rush – rafting, paragliding, mountain biking, zip lining and canyoning, to name just a few. The one attraction that gave me sweaty palms though? 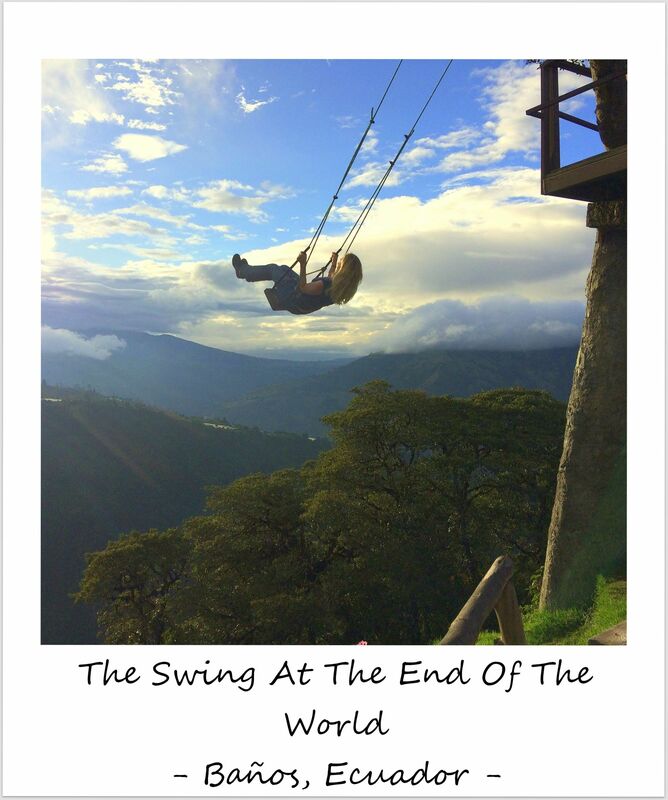 The infamous ‘swing at the end of the world;, where you dangle from a tree house over a cliff, high up in the mountains over Baños. It’s one of those places that you see a picture of and know you have to go there. Or is that just me? 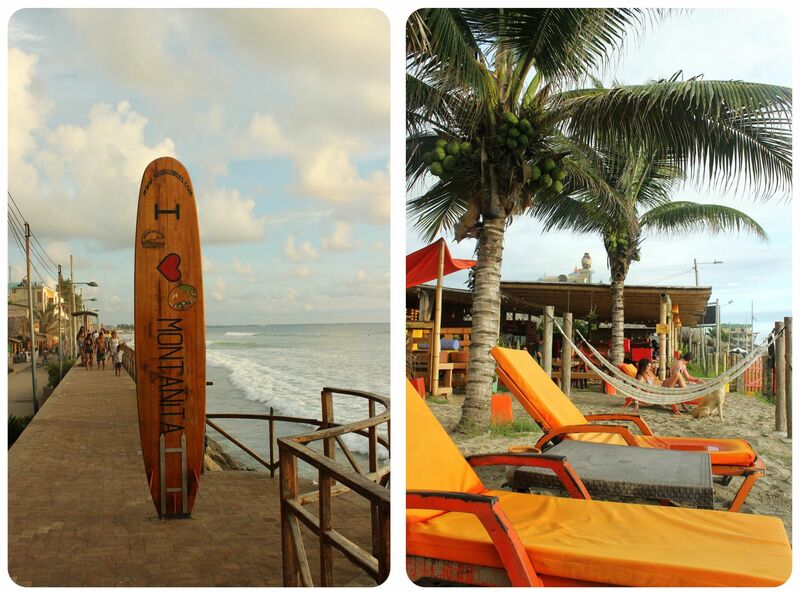 For years, this was one of the only places I knew about in Ecuador. 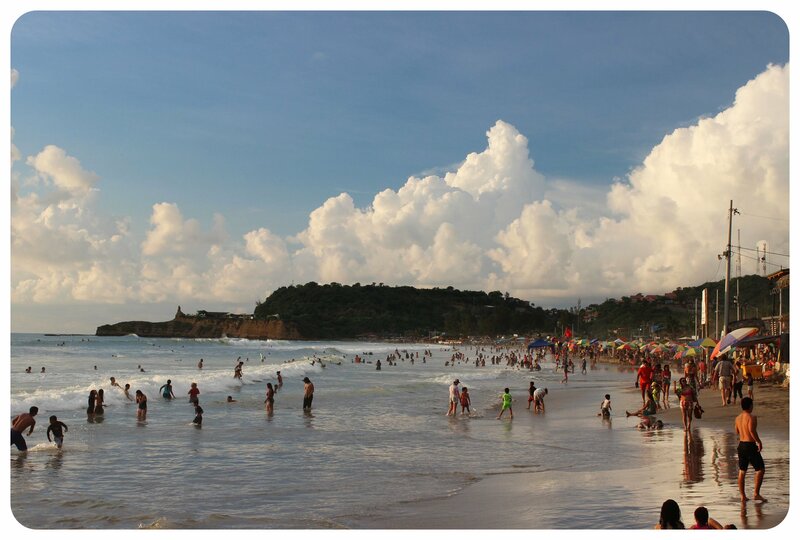 I knew about the Galápagos Islands, I knew about Quito, and the Swing At The End Of The World. 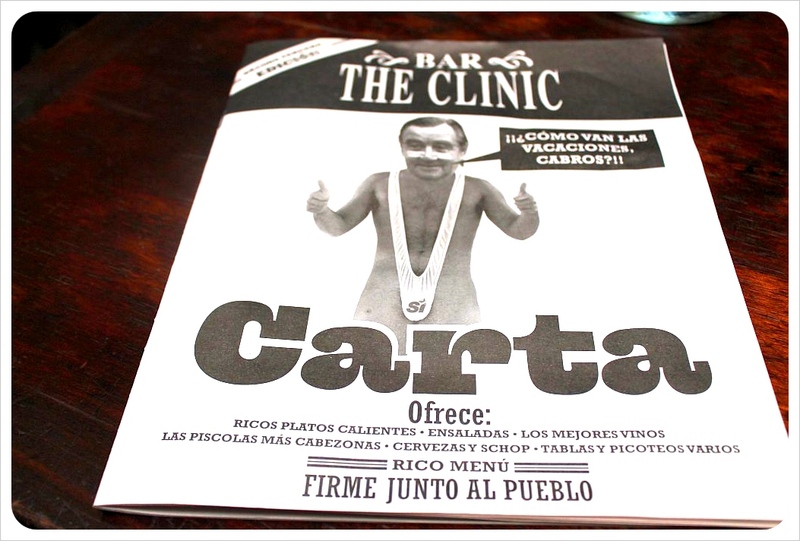 Since this was the thing I was most excited about doing in Baños, it was where I was headed to first. Initially I attempted hiking up the mountain, but when, after walking for an hour, I still hadn’t even made it to the bottom of the mountain on top of which the swing sits, I changed my mind and took a Chiva instead, a truck that’s converted into a tourist shuttle with benches in the back. I have to admit that I wasn’t sure if I’d actually swing on the swing or just take some photos, because I have a terrible fear of heights. 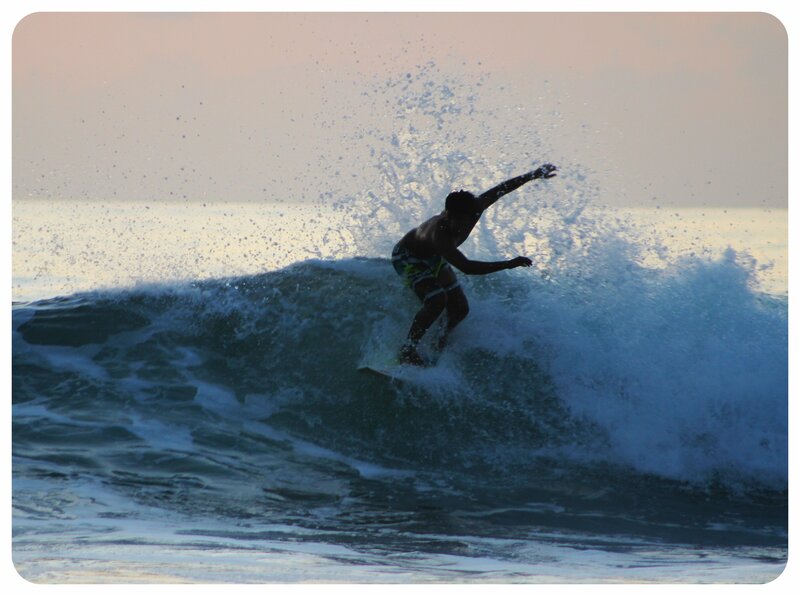 But eventually I decided that I’d regret not doing it, and chances that I’ll ever return to Baños are pretty slim. And so I got in line for about half an hour for two minutes of swinging over the cliff.. and I am happy to report that I lived to tell the tale. I continued my adventurous week in Baños with a mountain bike tour along the popular waterfall route and two firsts for me: rafting and canyoning. How did that go? 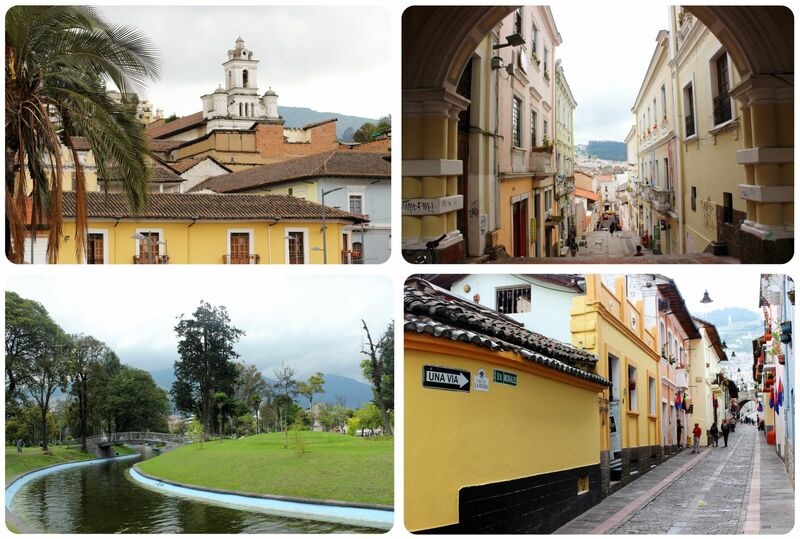 I’ll share my experiences in a detailed article on Baños soon… stay tuned!